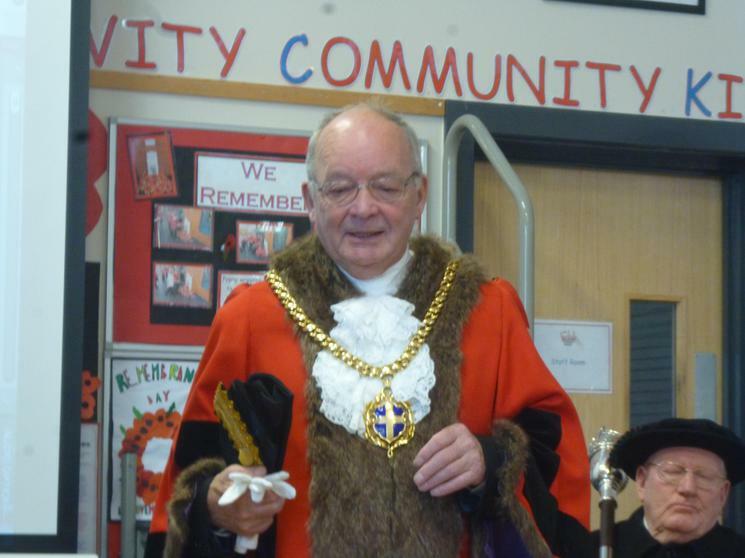 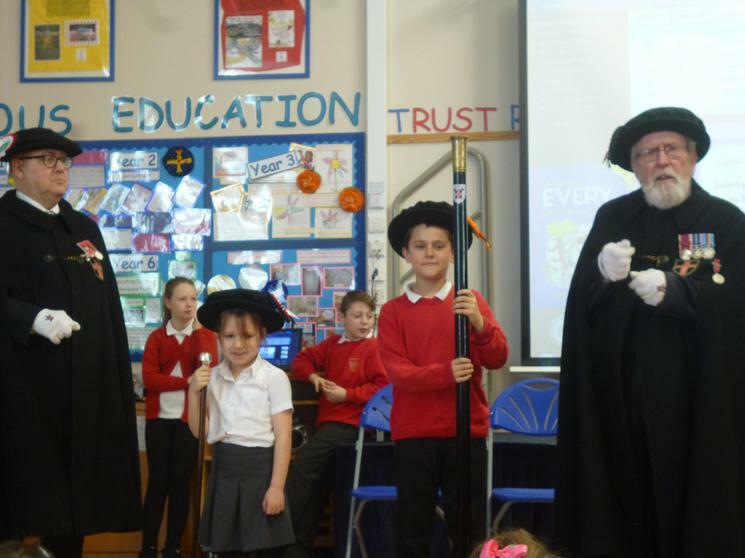 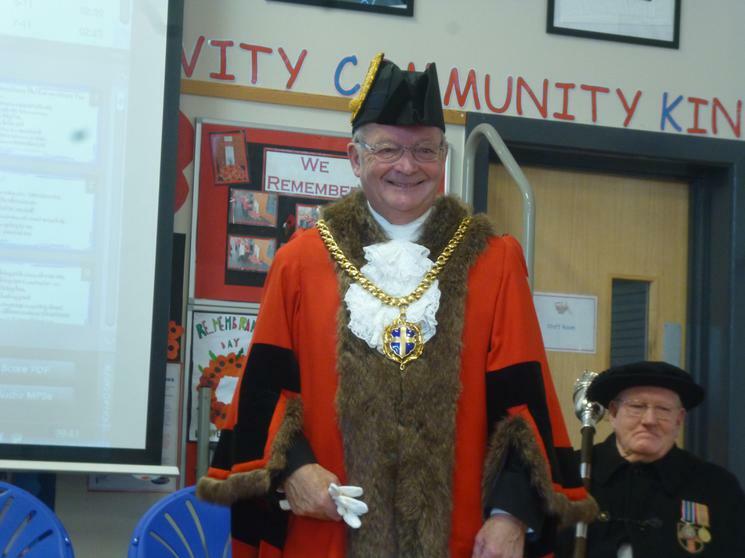 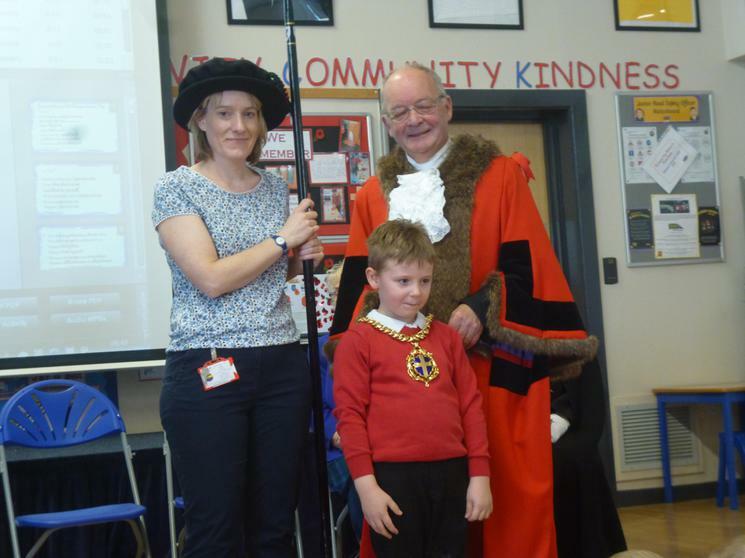 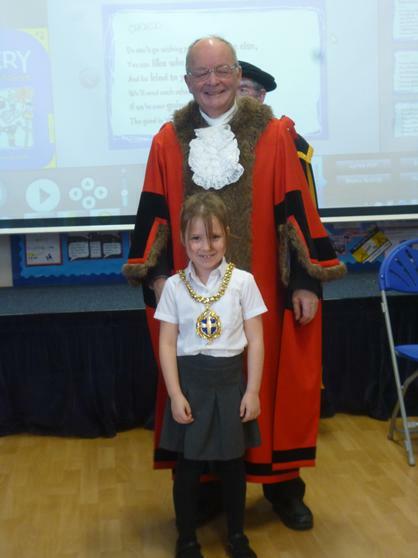 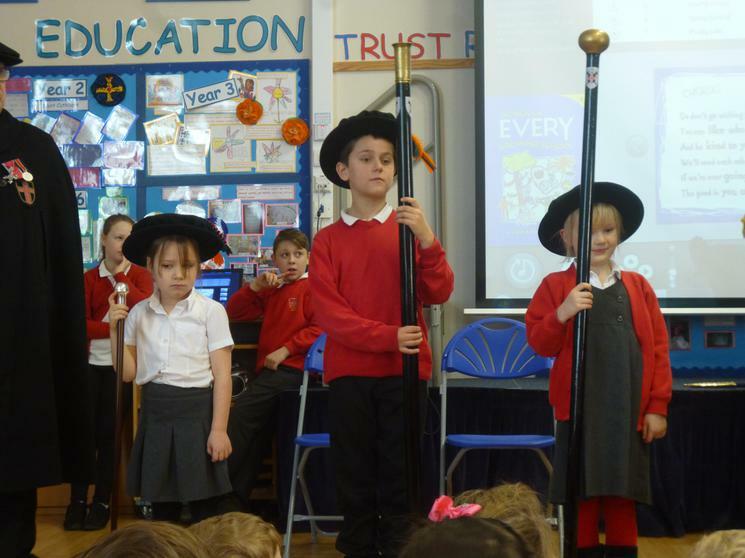 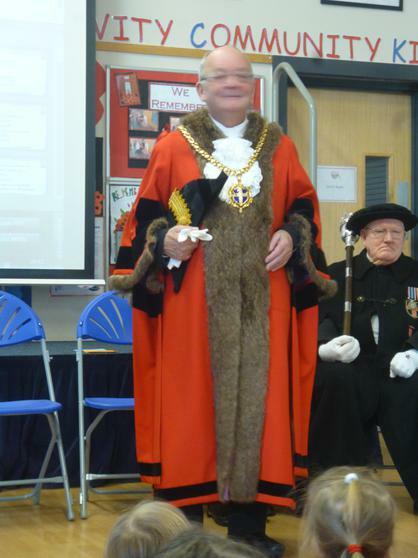 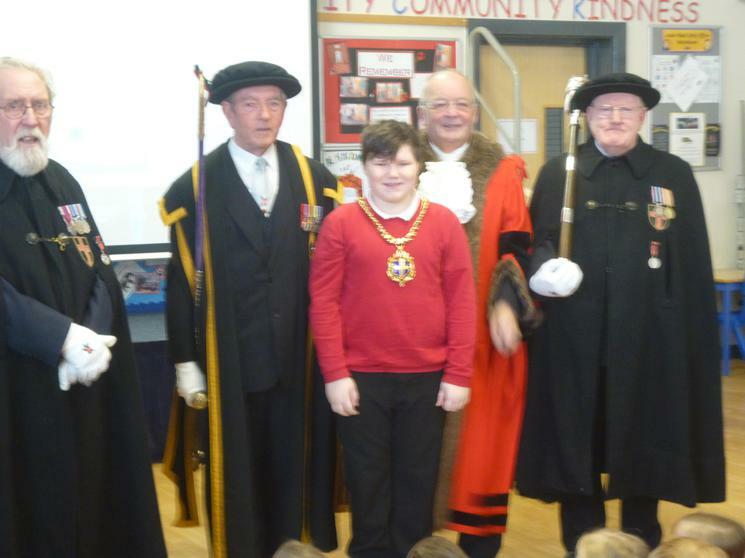 We had a very interesting assembly learning about the role of the Mayor in the past (collecting taxes) and his present day role promoting the city. 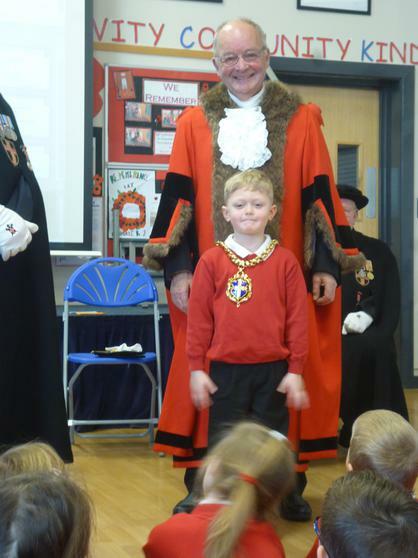 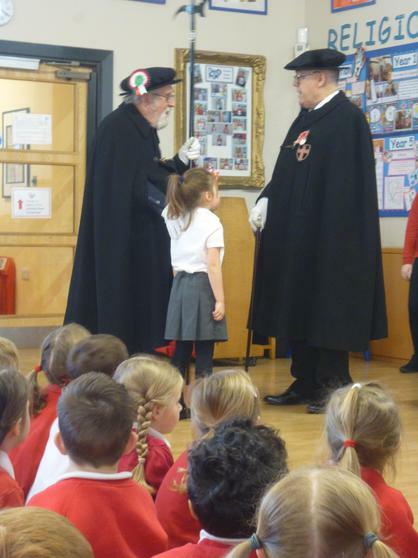 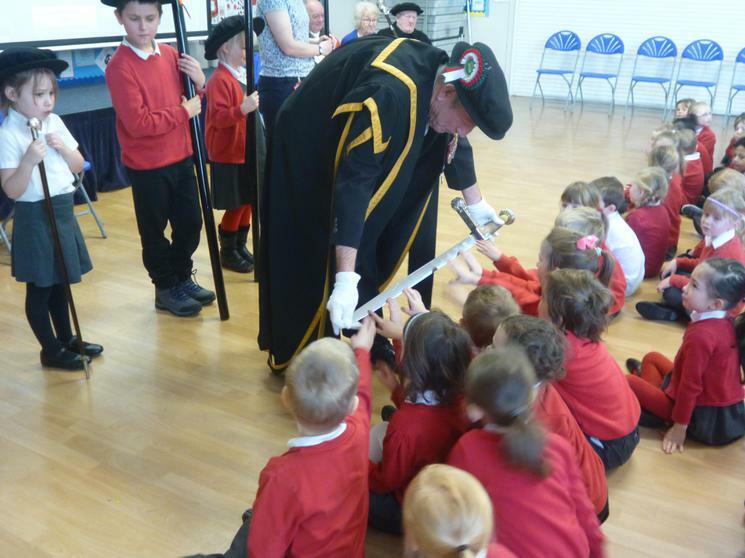 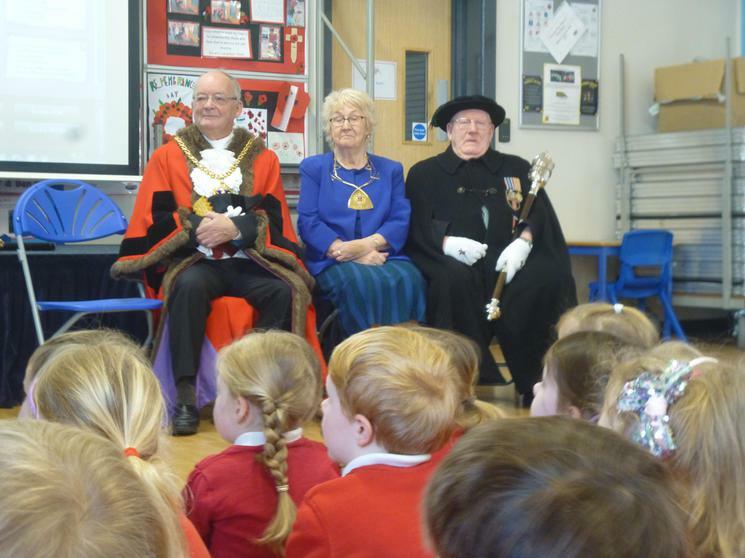 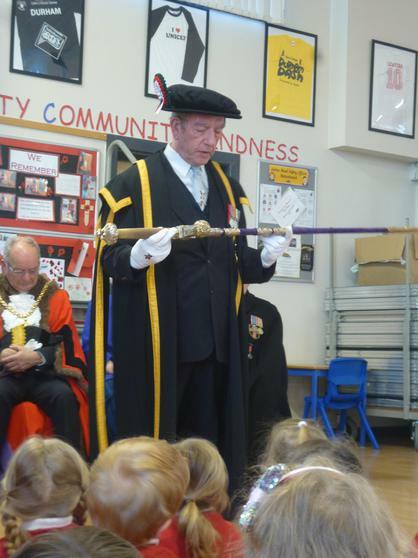 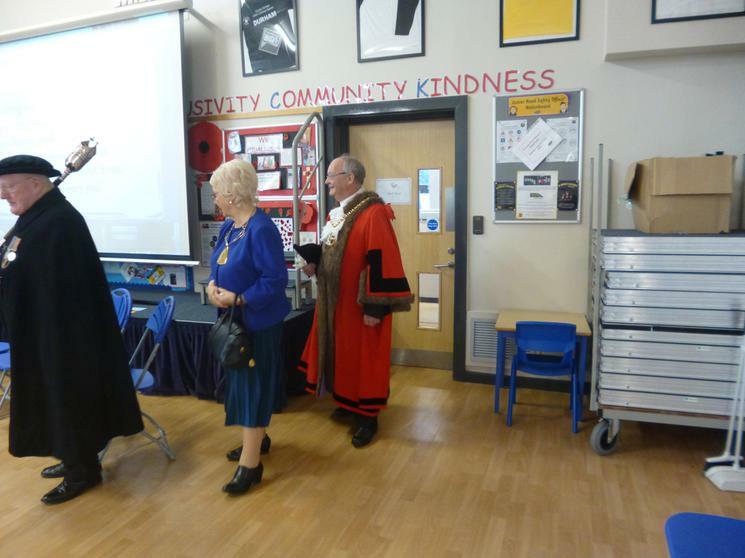 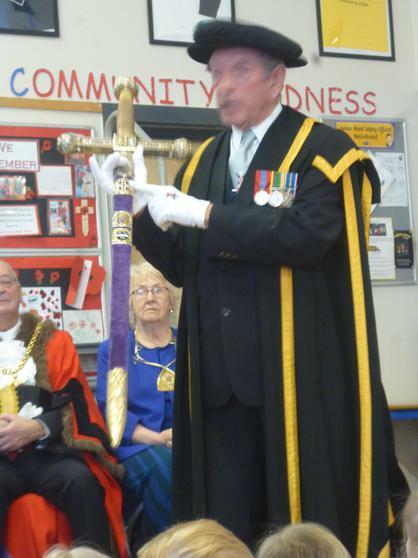 The Mayoress talked to us too and the Mayor explained all about his ceremonial robes including his hidden pockets. 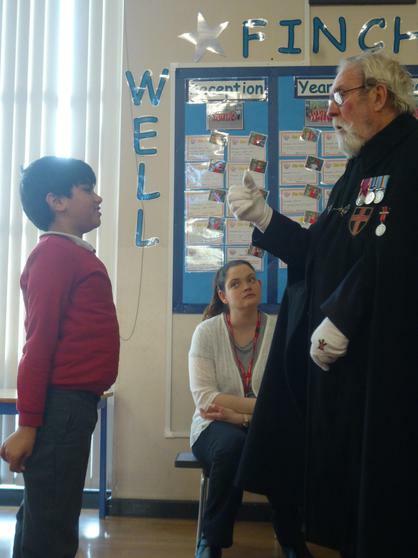 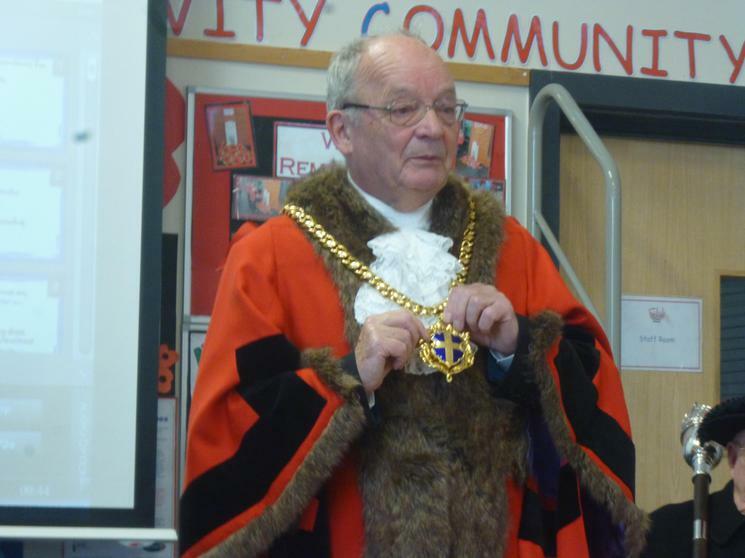 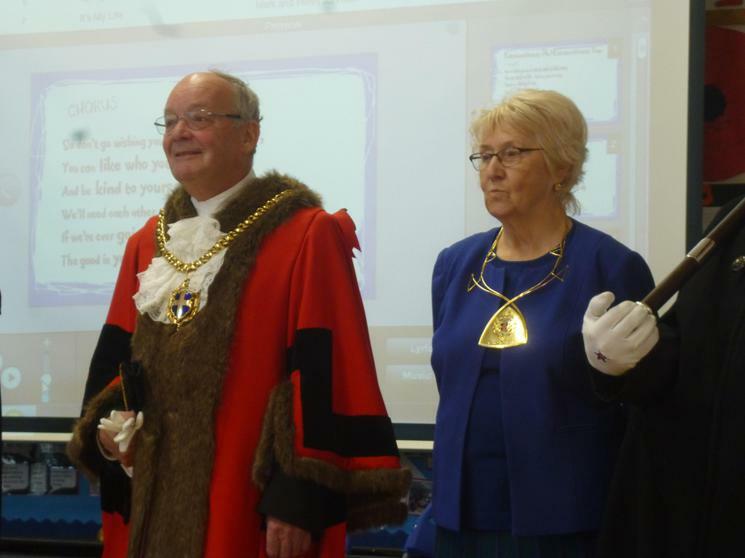 Some pupils had an opportunity to try on his gold chain of office. 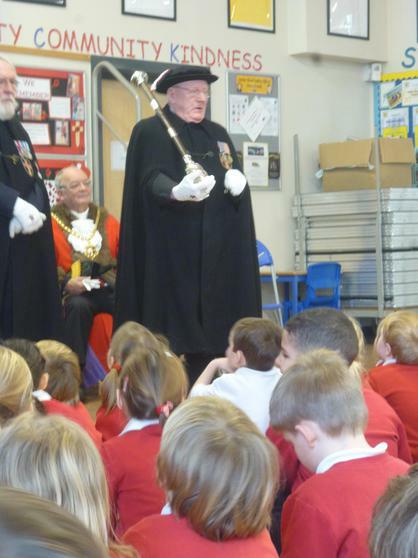 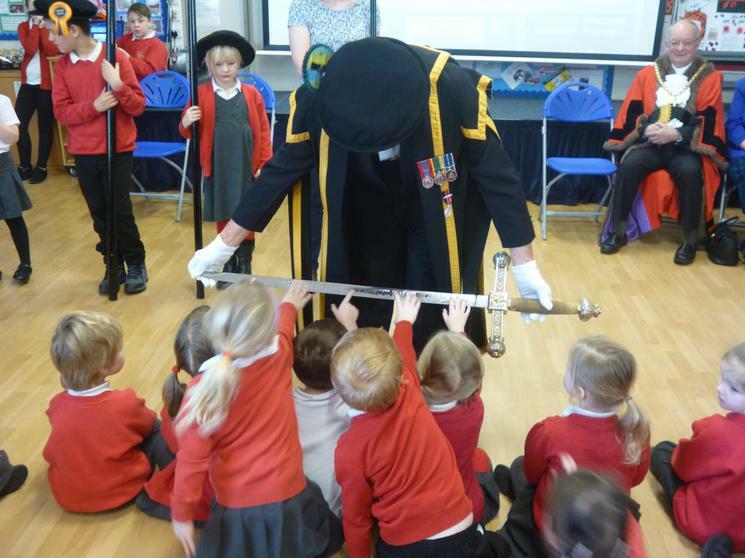 Four (out of 15) of the Mayor's Bodyguard visited and told us about their job and showed us their robes, the mace and the sword. 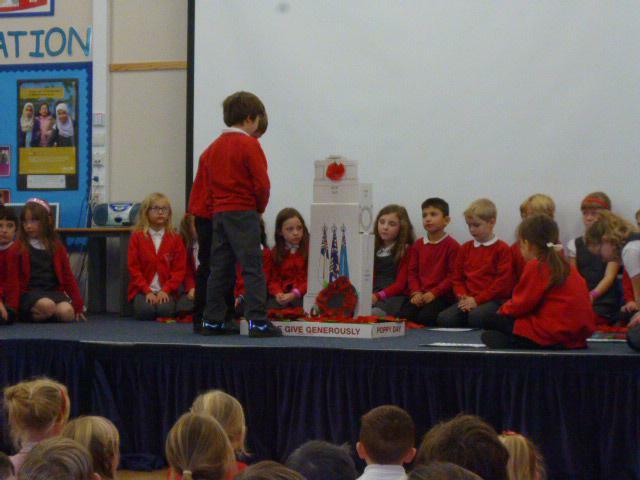 They explained the significance of each item. 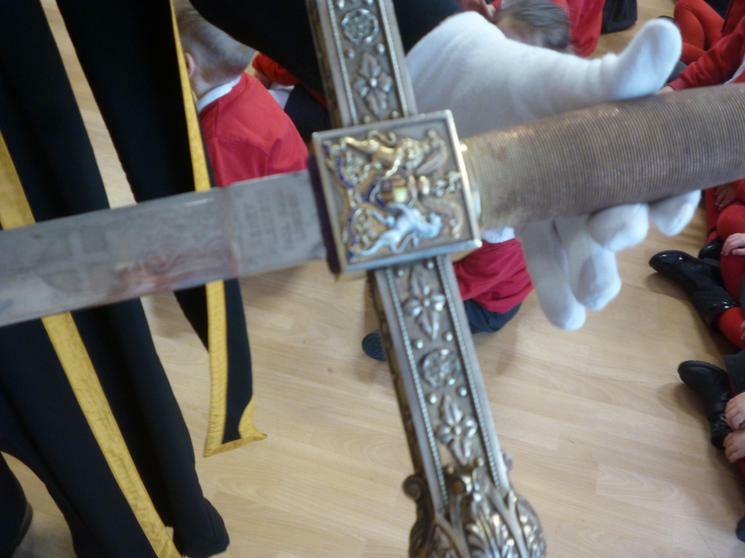 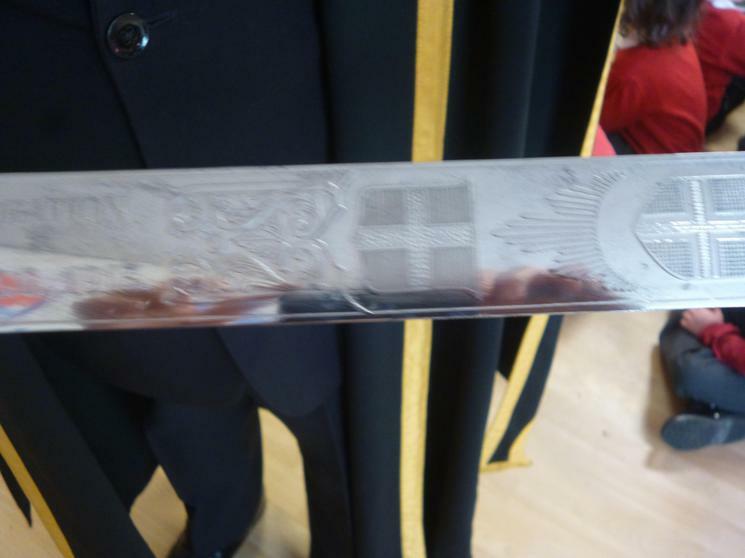 Some of our pupils had an opportunity to see the sword up close and some even joined the ranks of the Bodyguard - but only temporarily! 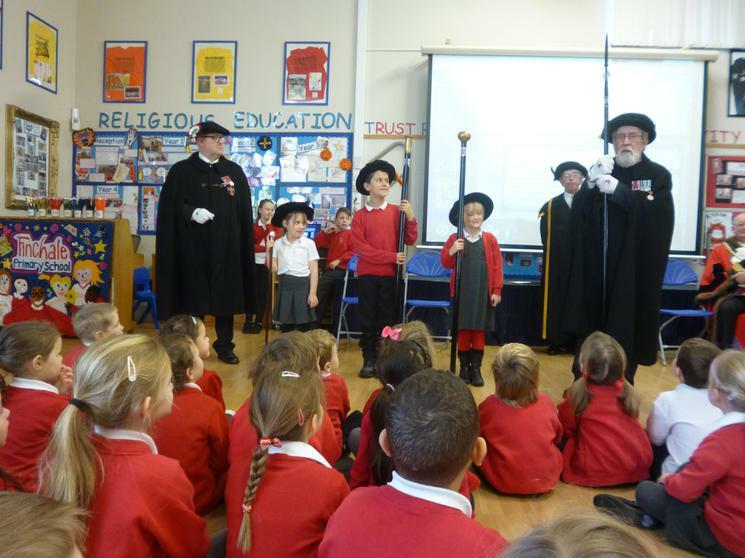 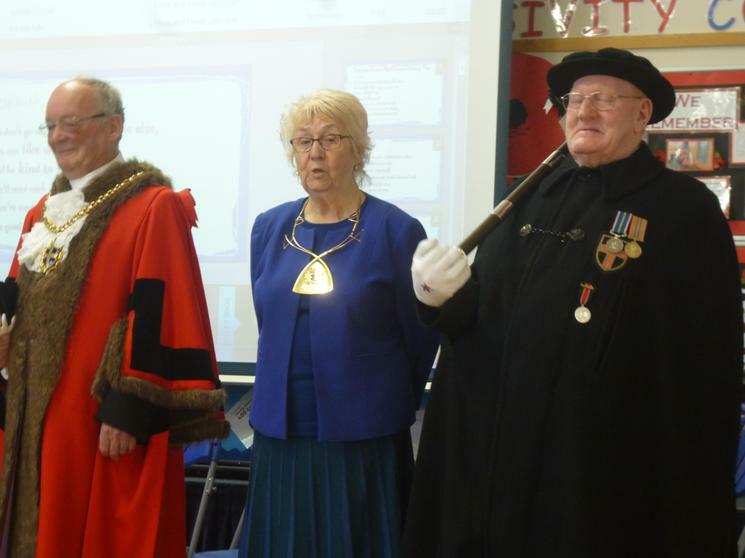 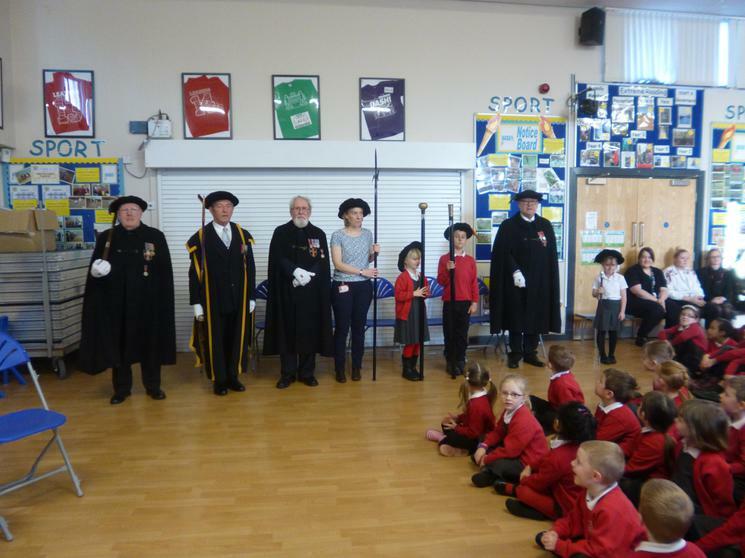 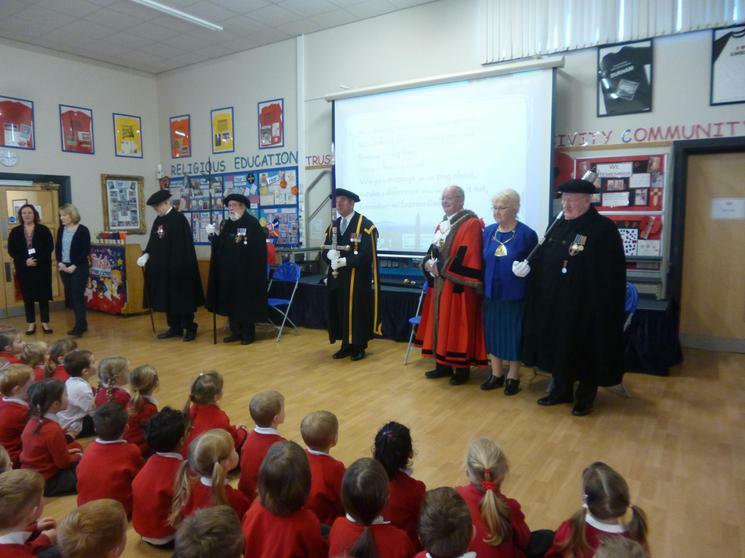 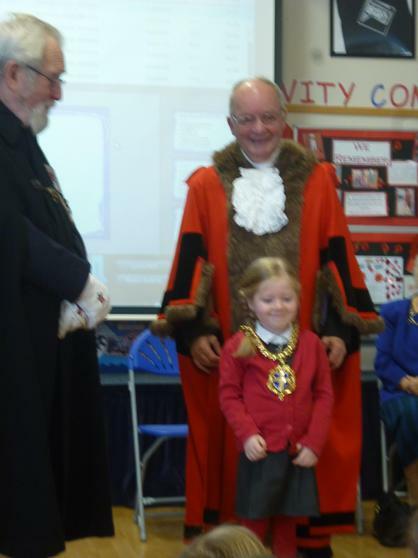 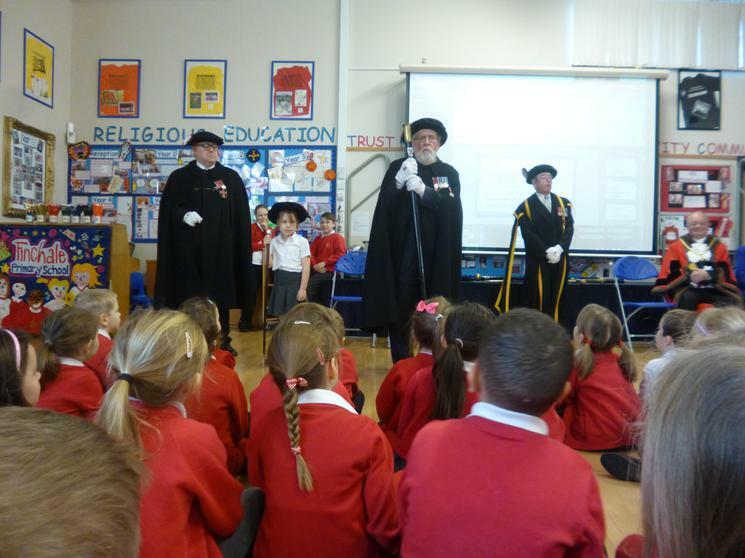 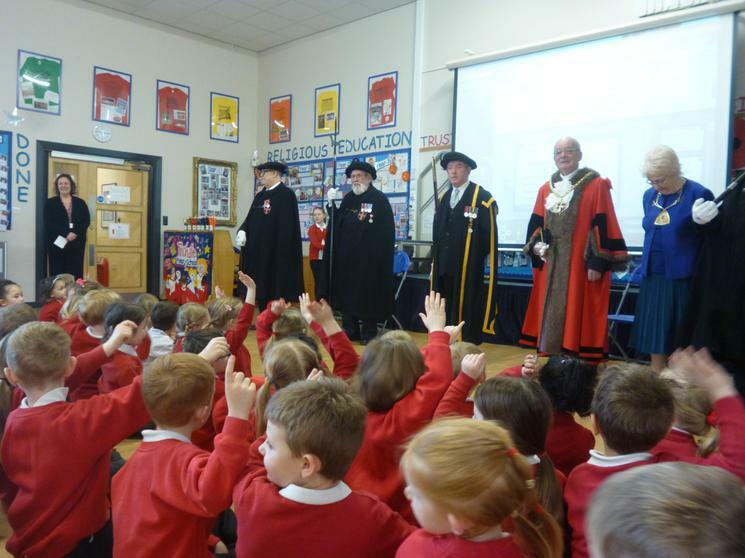 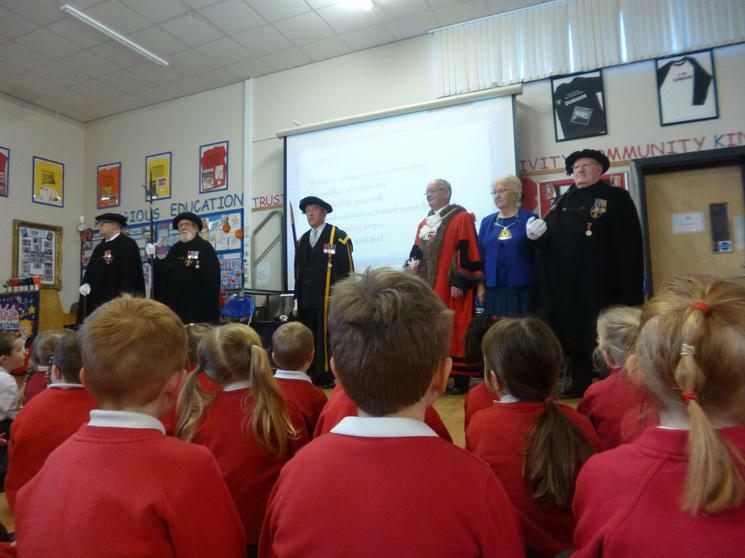 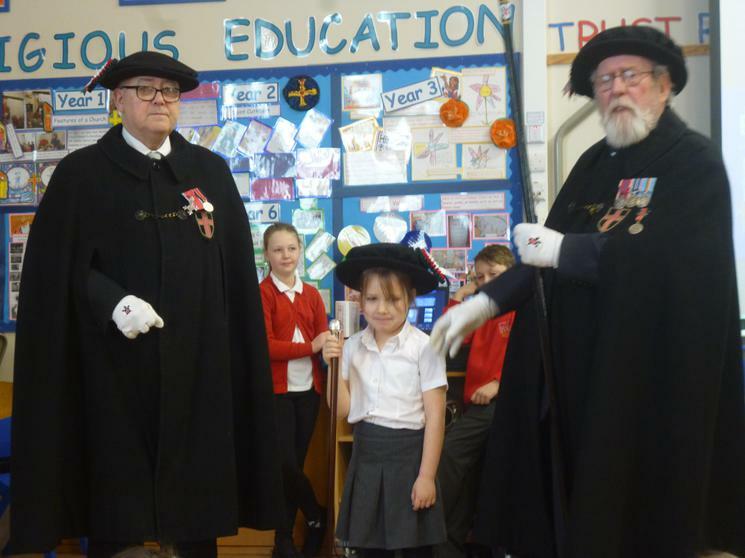 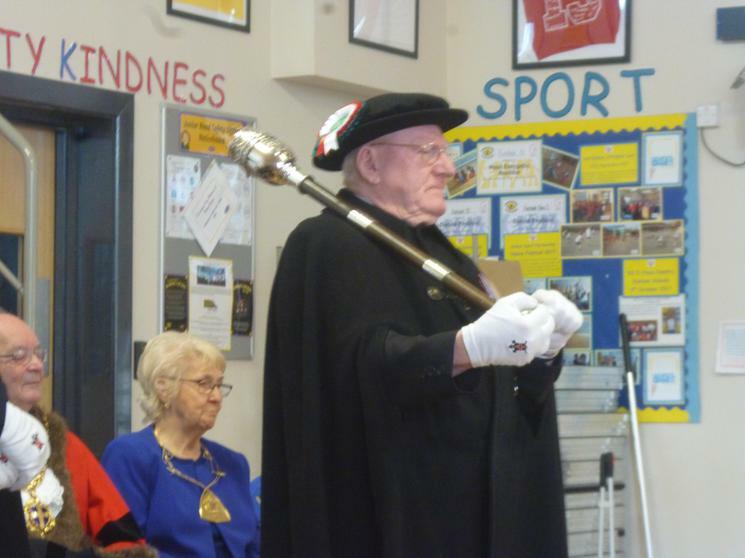 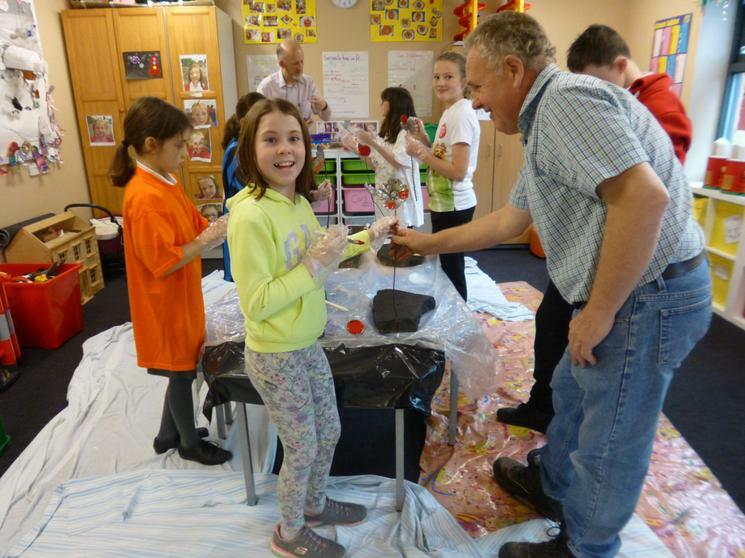 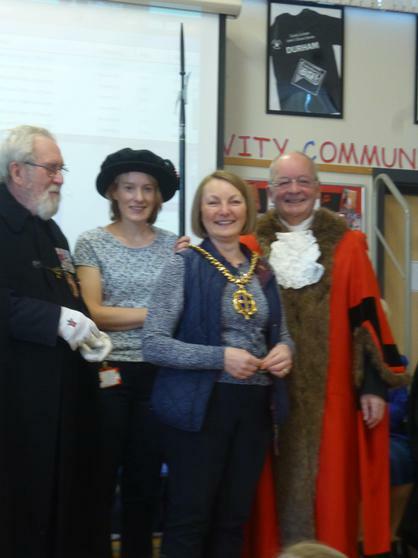 Many thanks to our visitors, it was a pleasure to learn so much about the role of the Mayor and associated traditions which the children found fascinating. 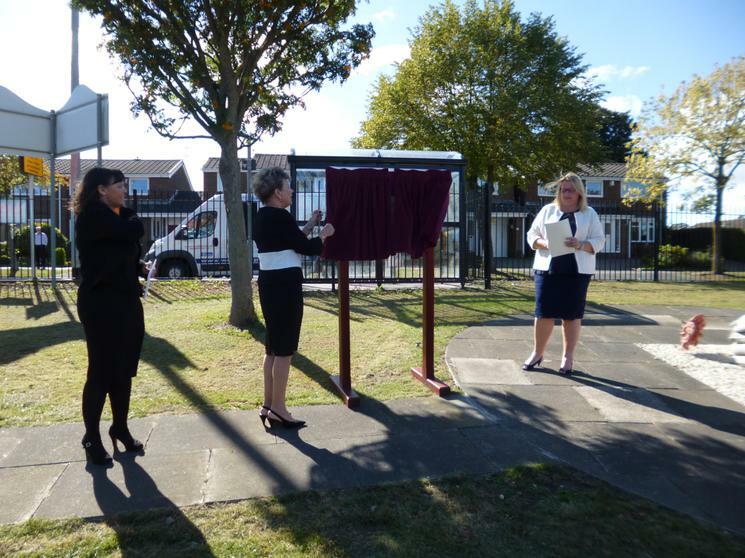 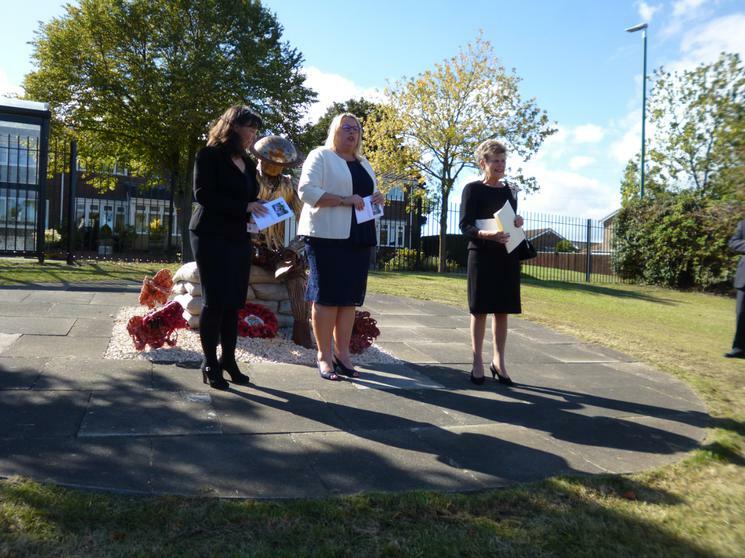 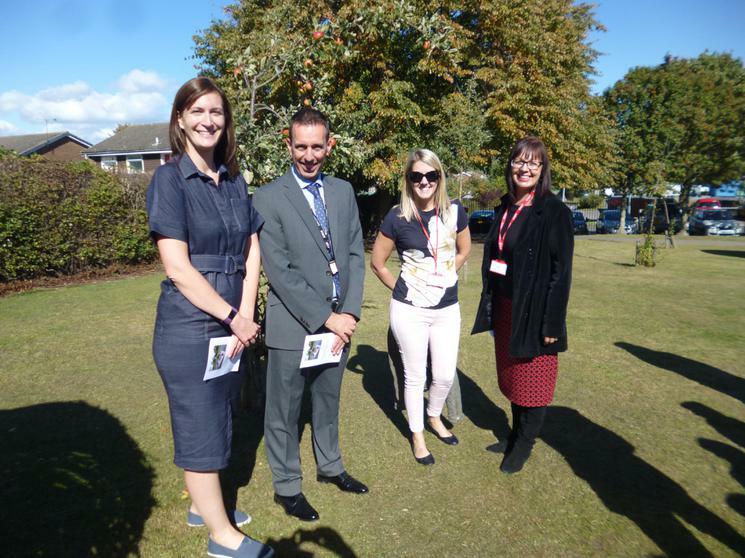 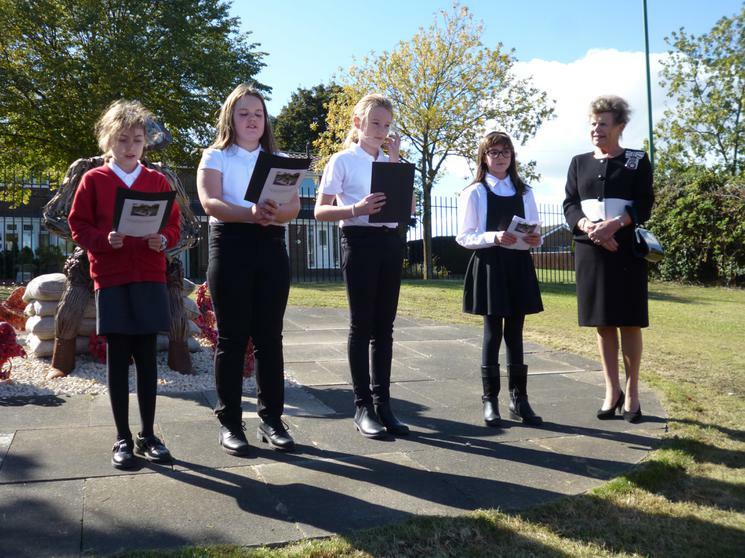 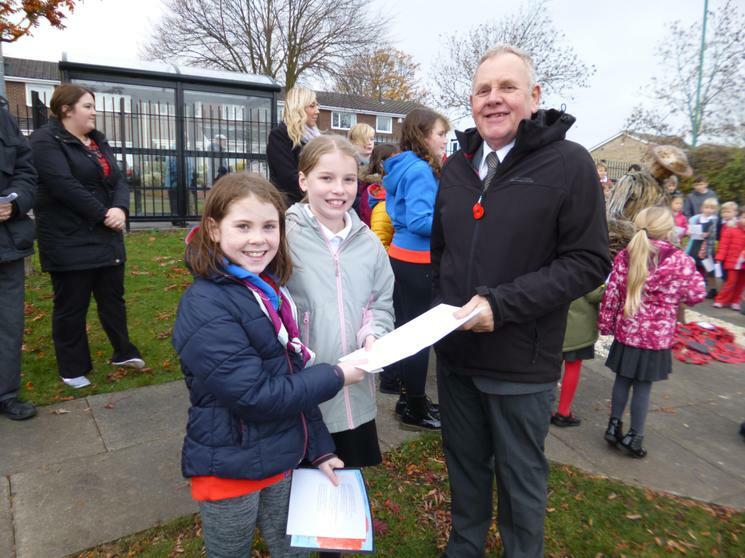 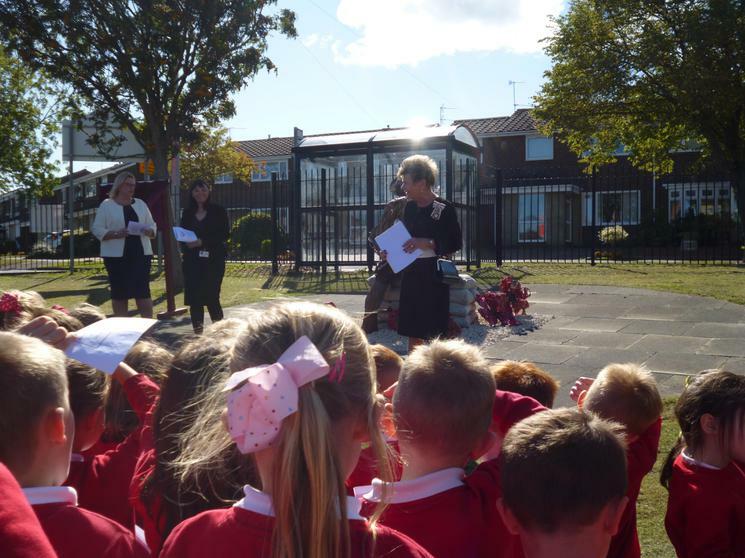 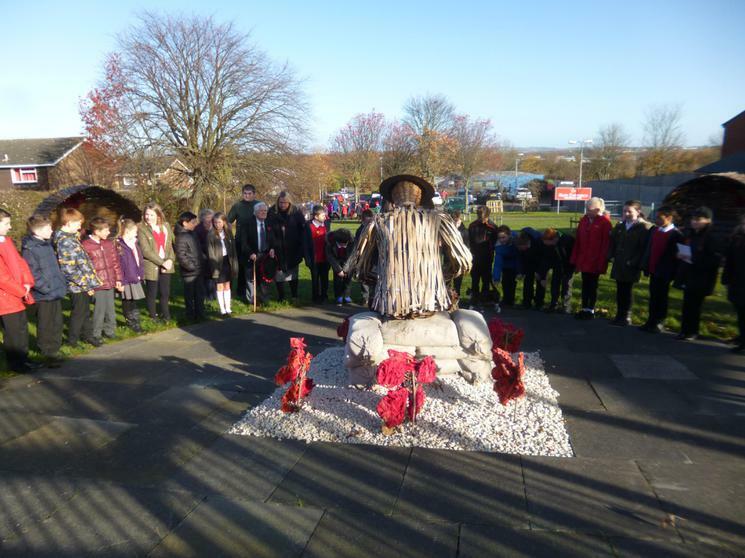 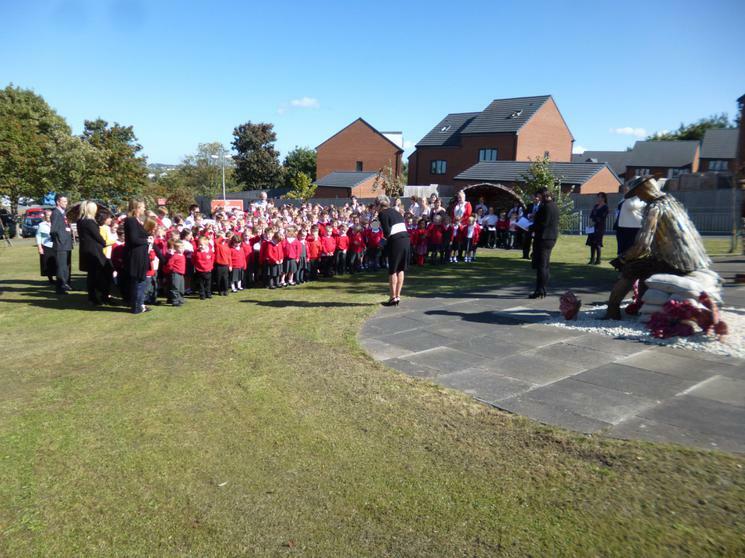 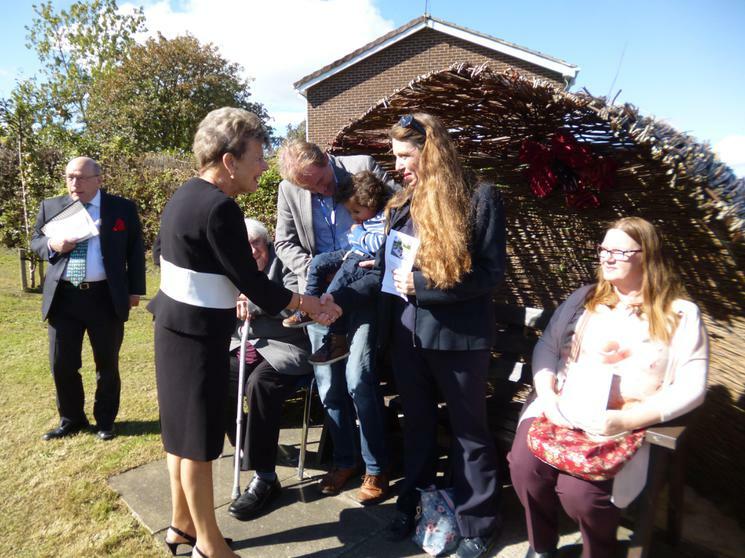 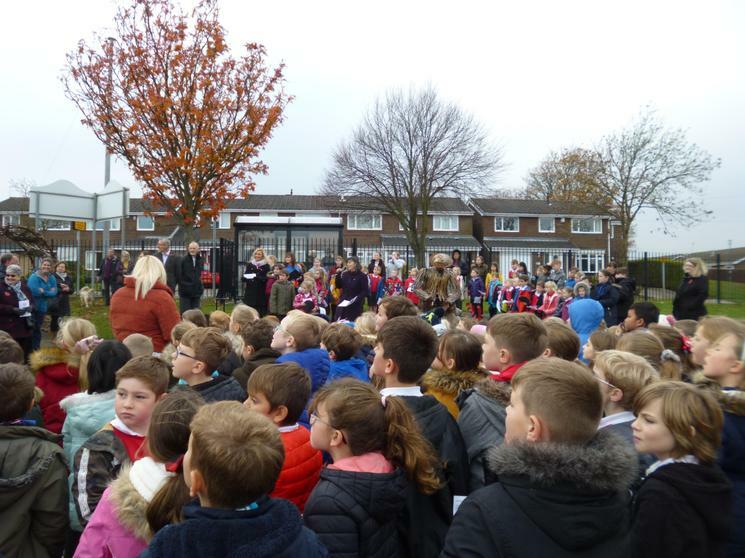 Our Remembrance Day commemoration was very special this year because we also held a dedication for our newly opened Memorial Garden. 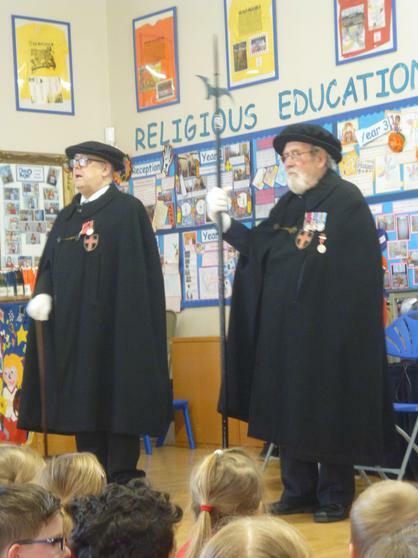 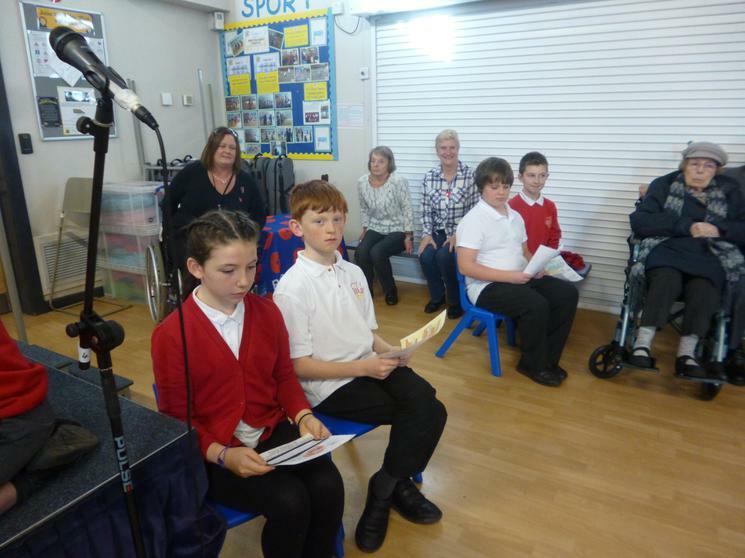 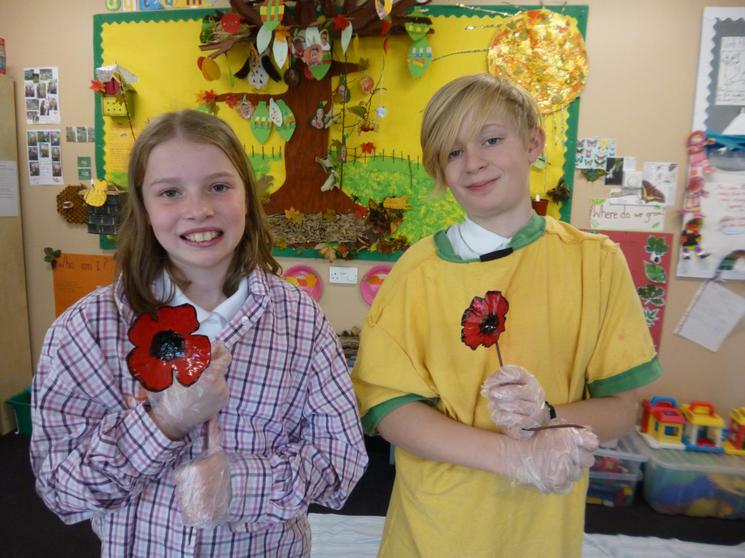 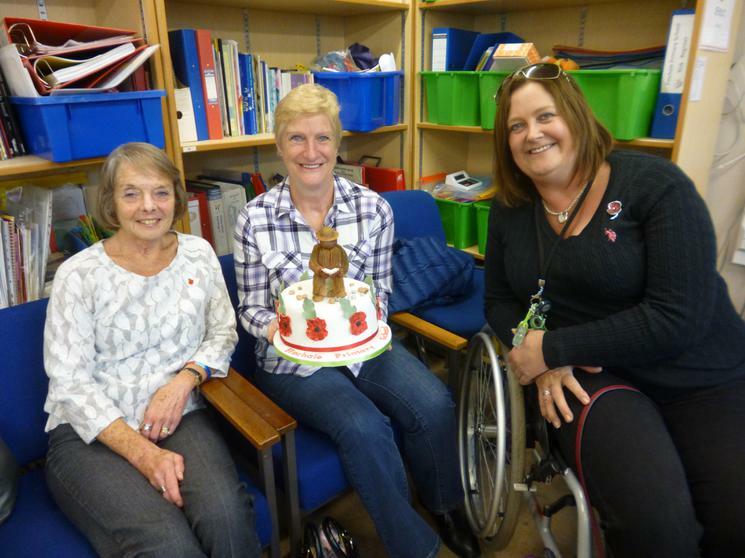 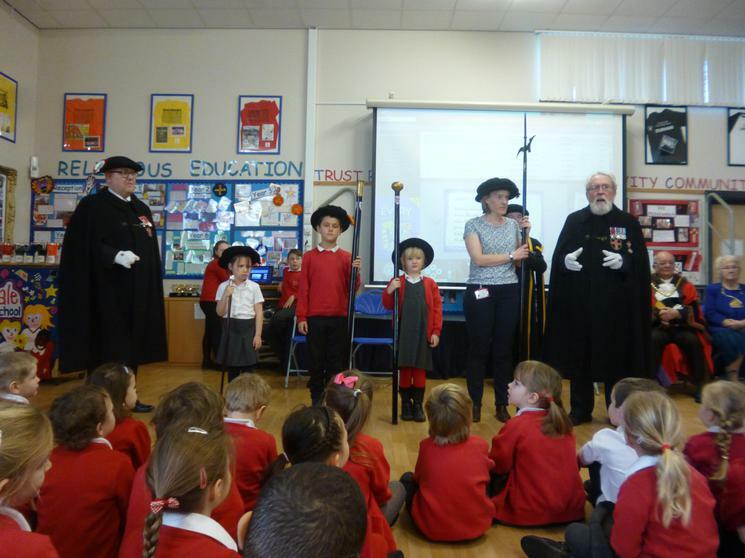 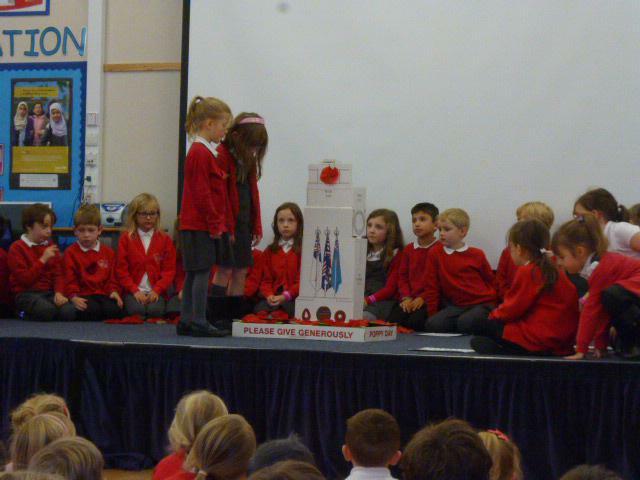 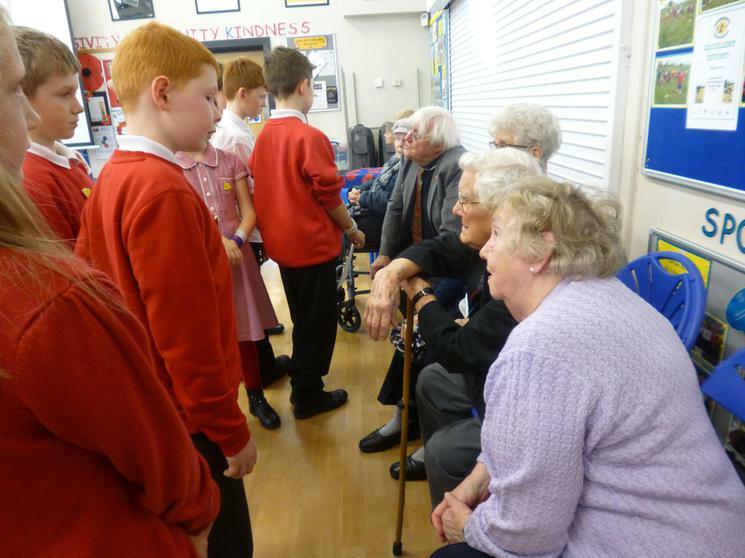 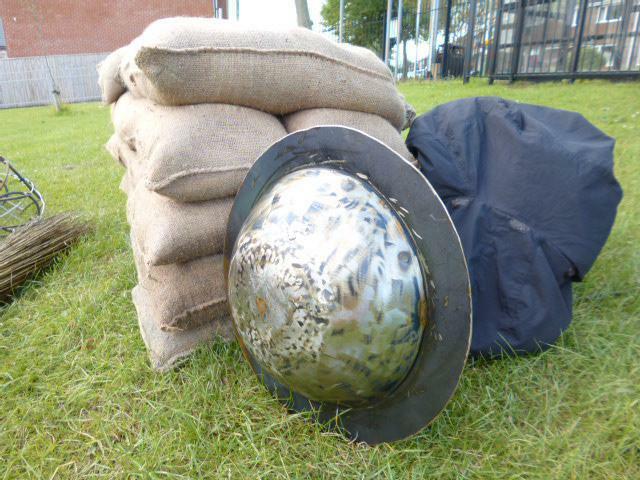 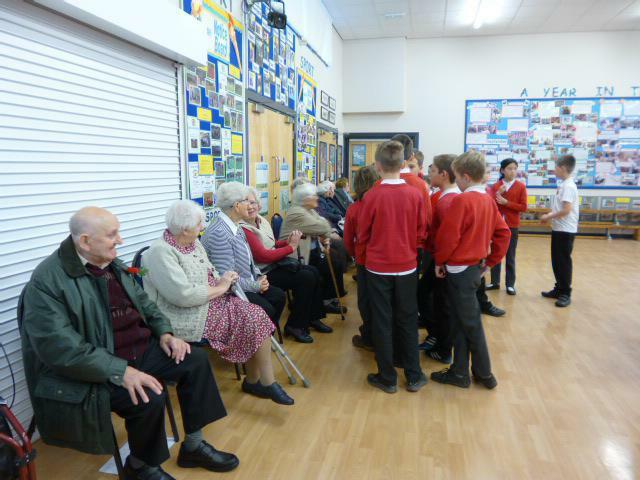 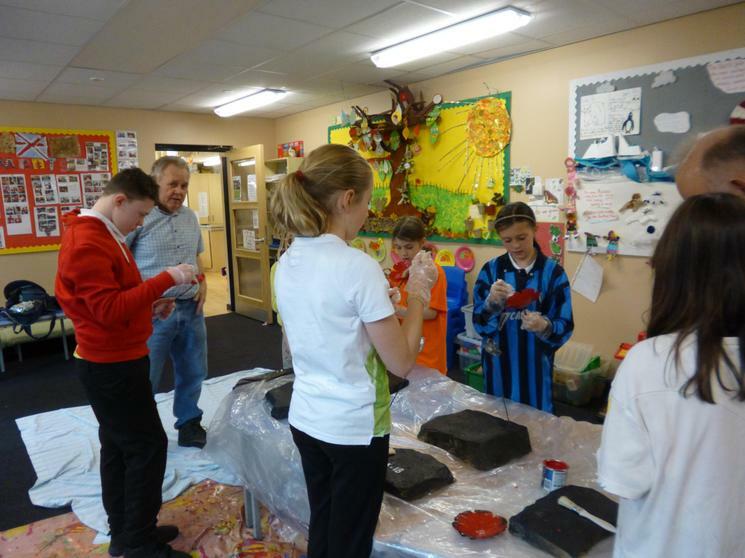 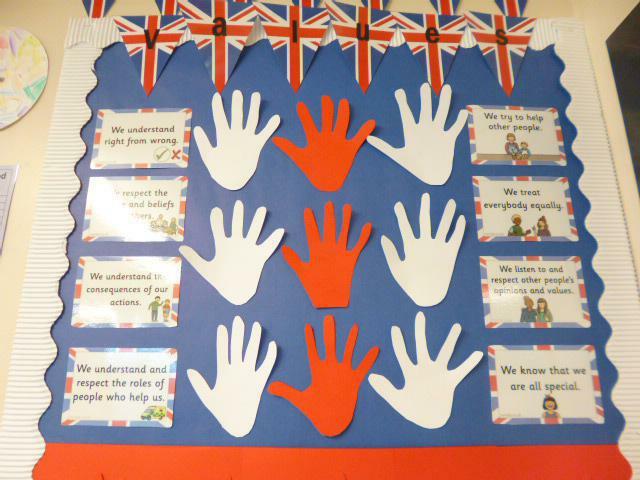 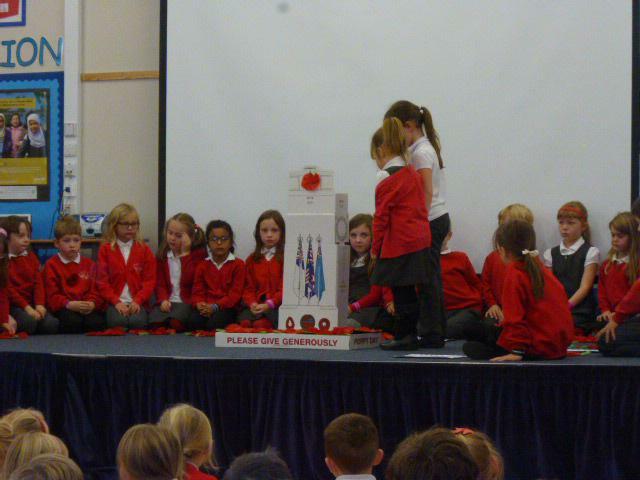 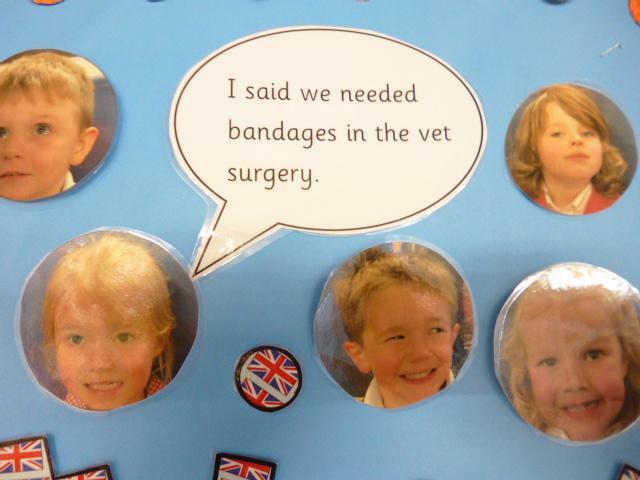 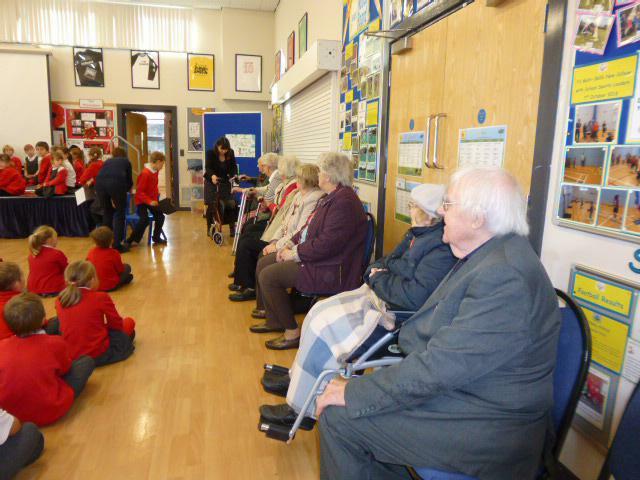 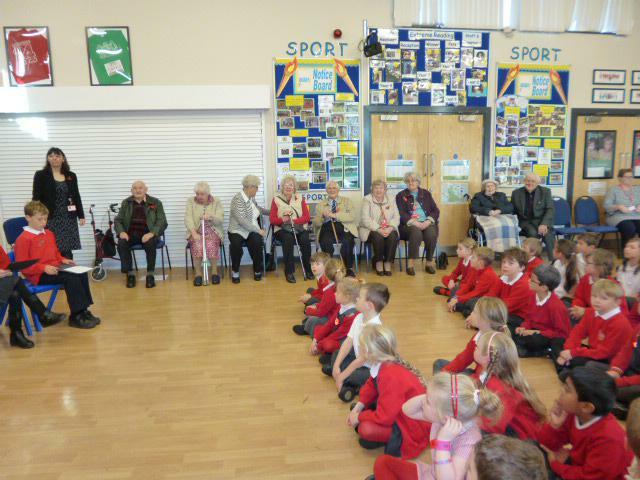 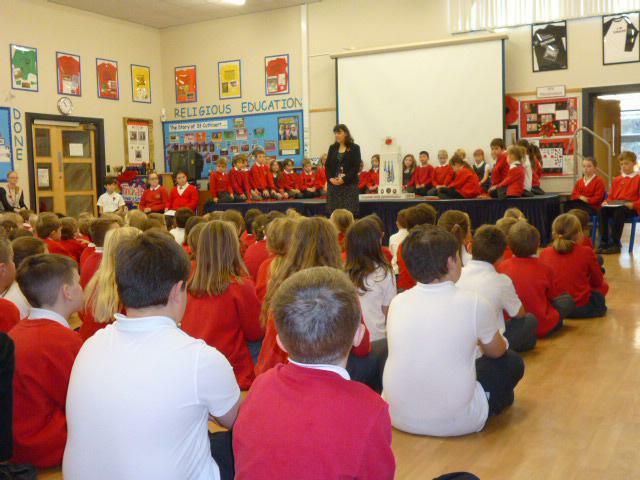 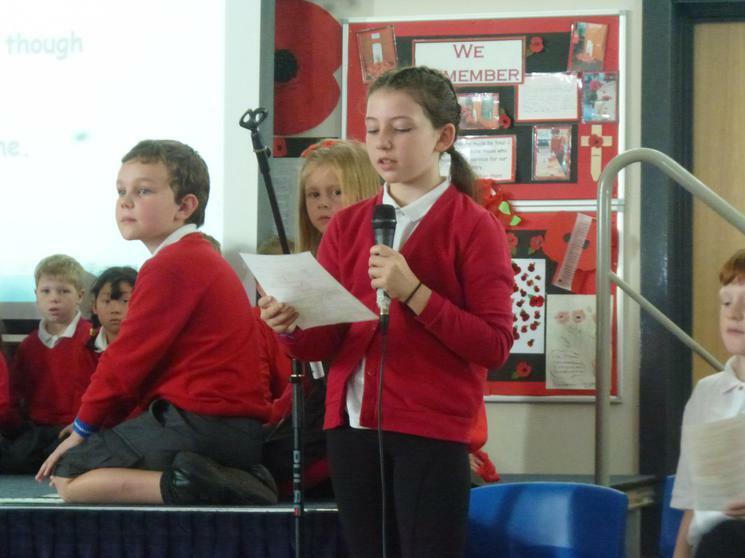 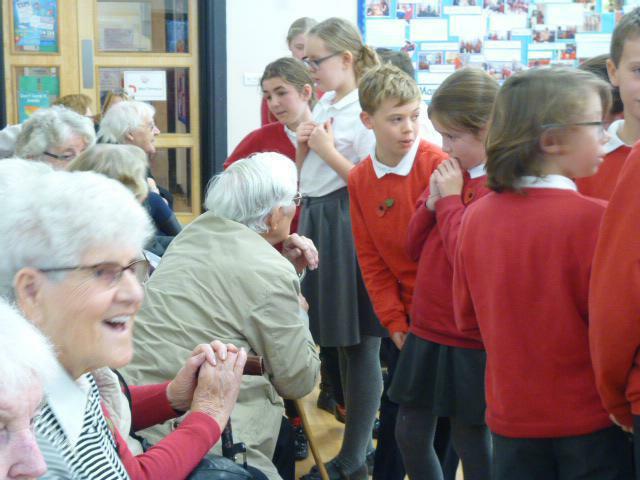 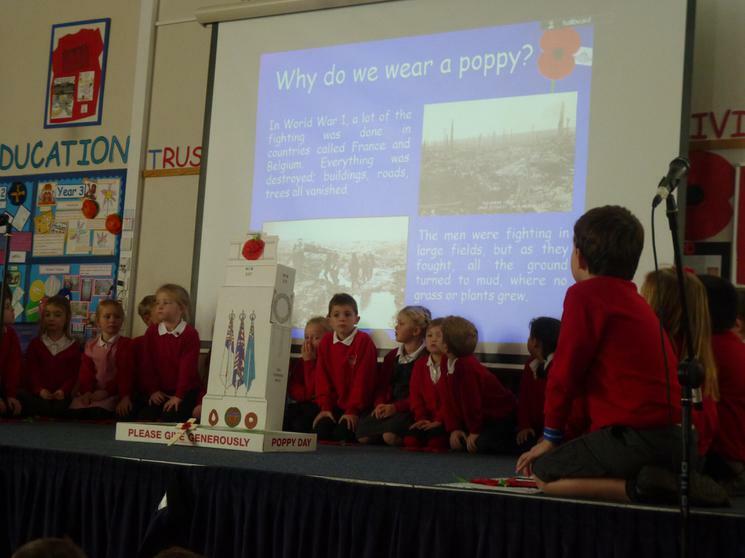 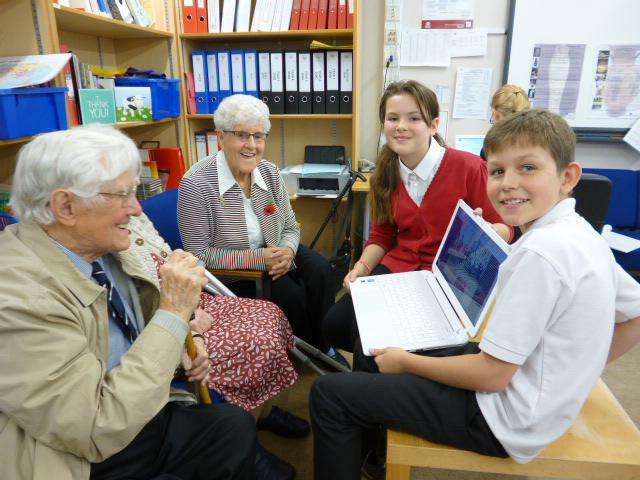 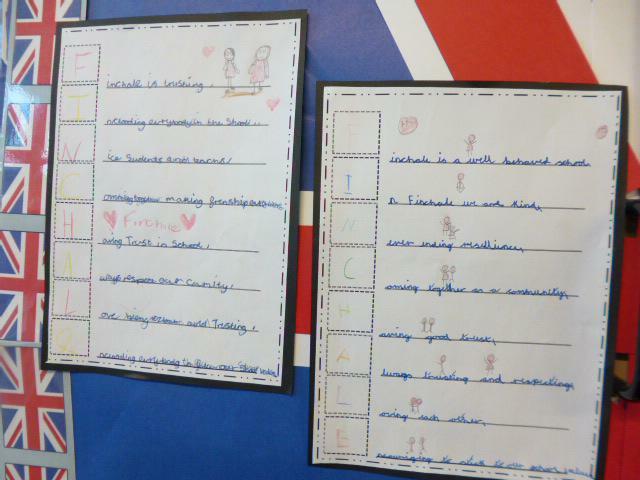 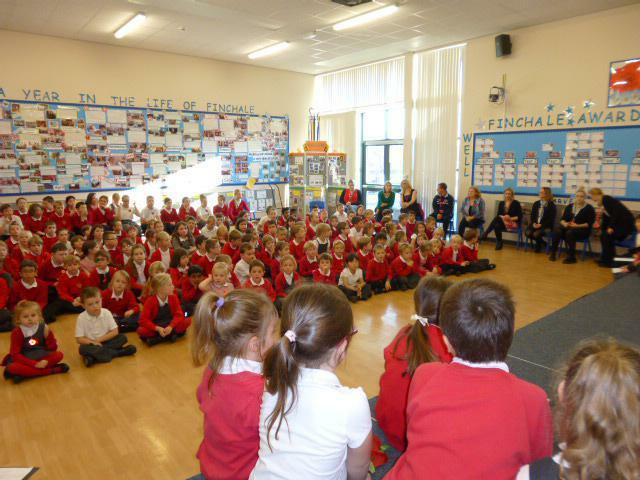 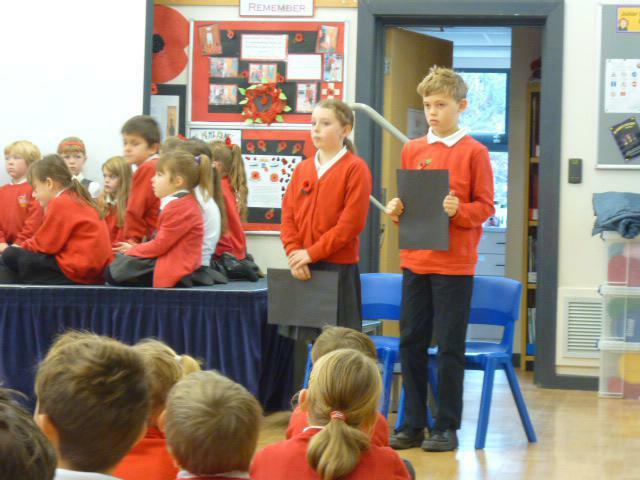 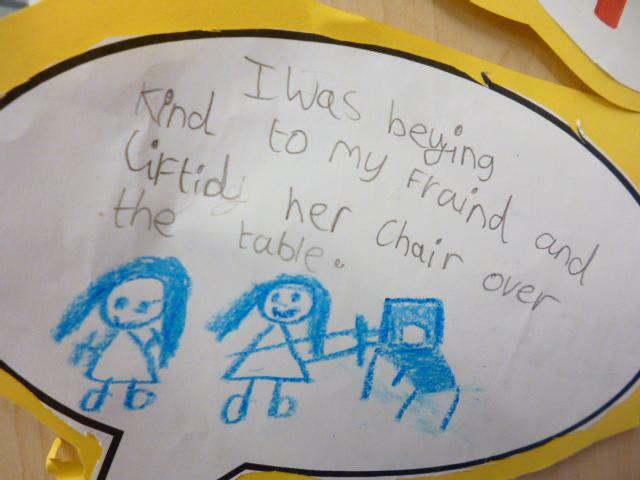 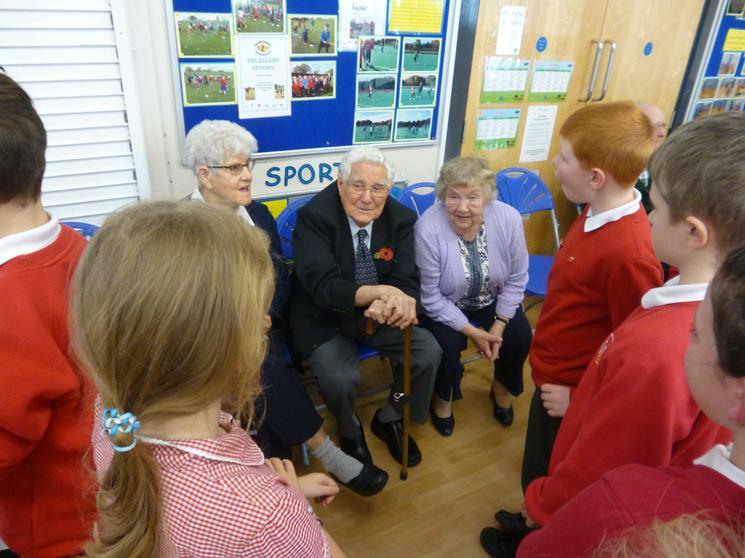 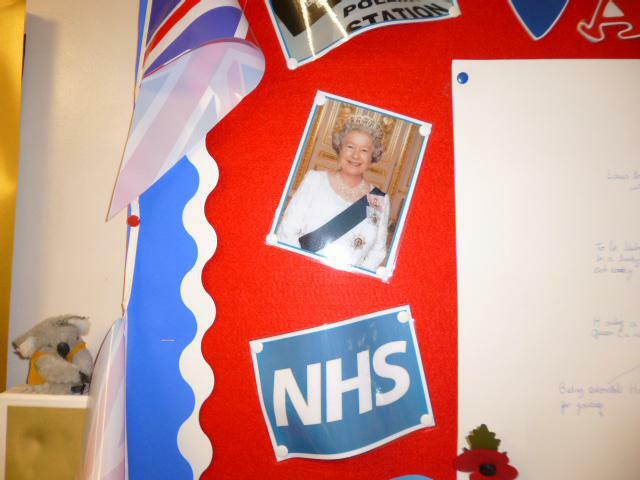 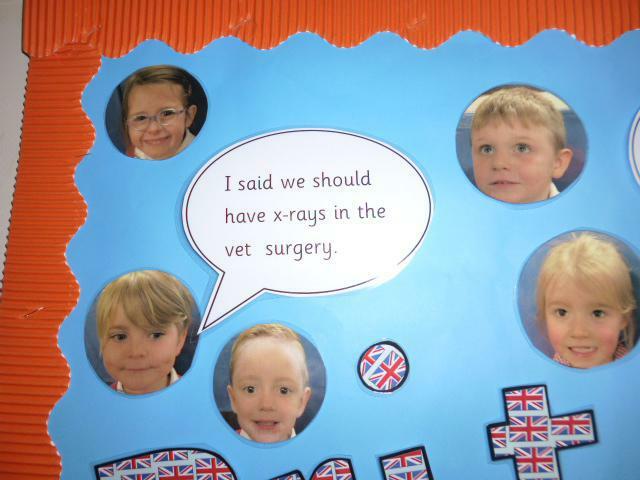 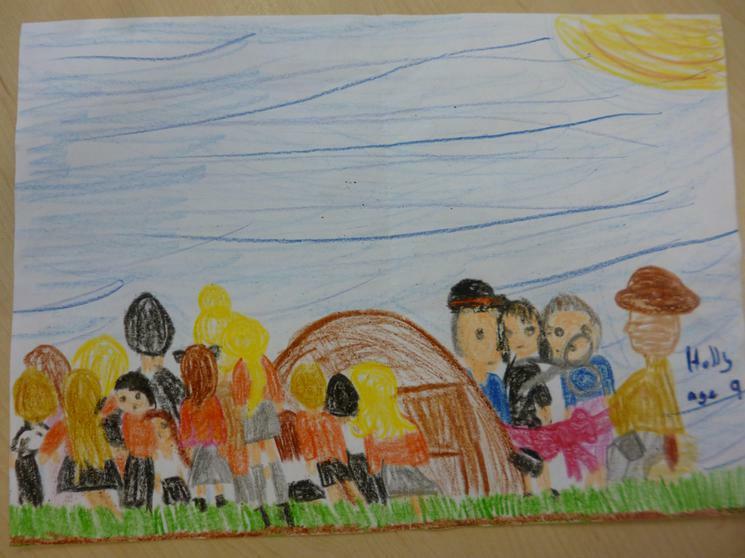 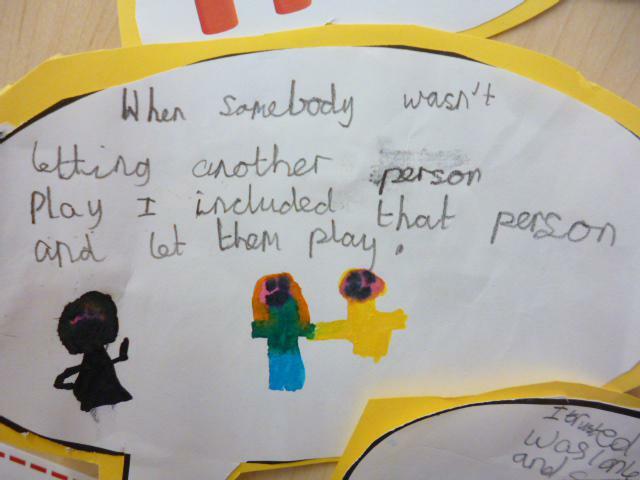 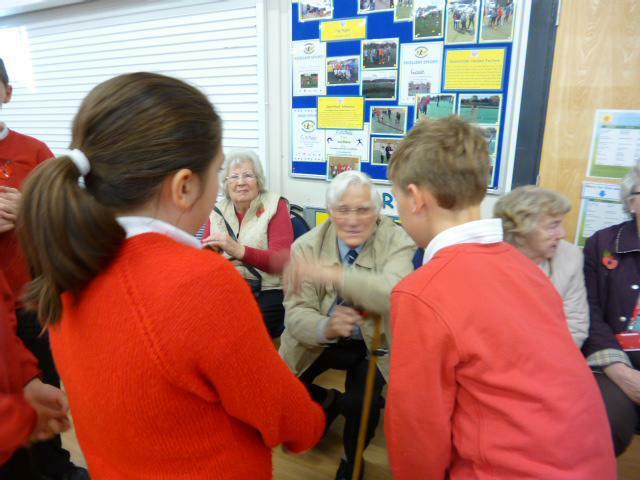 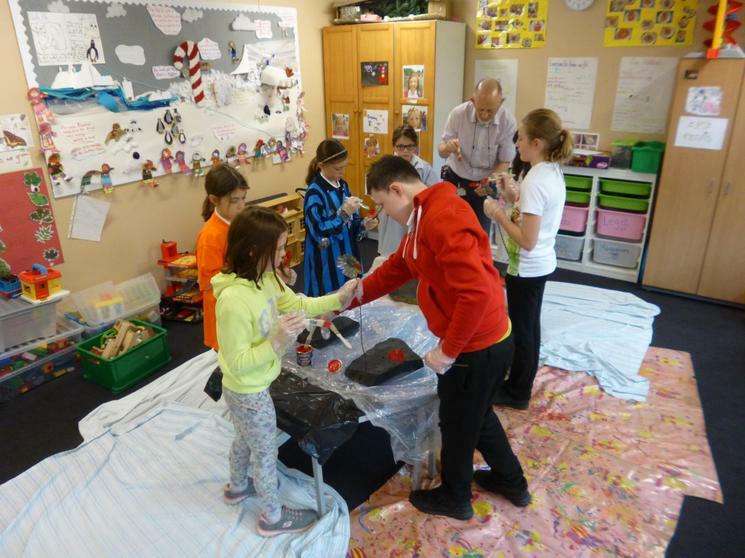 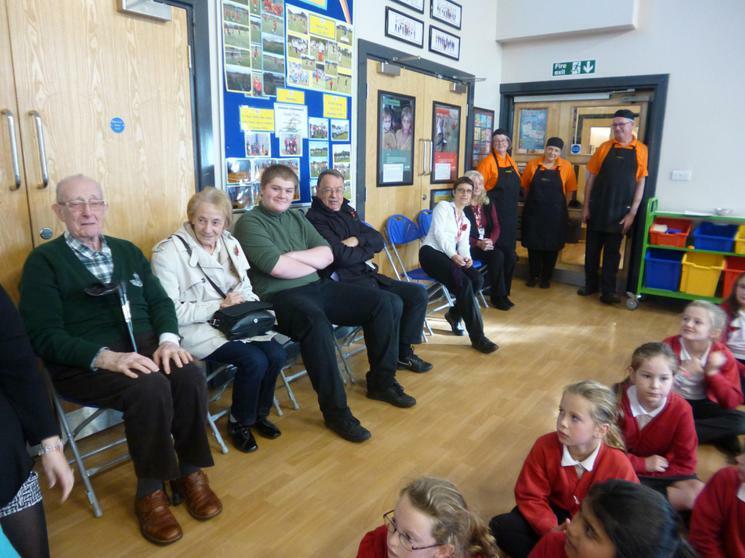 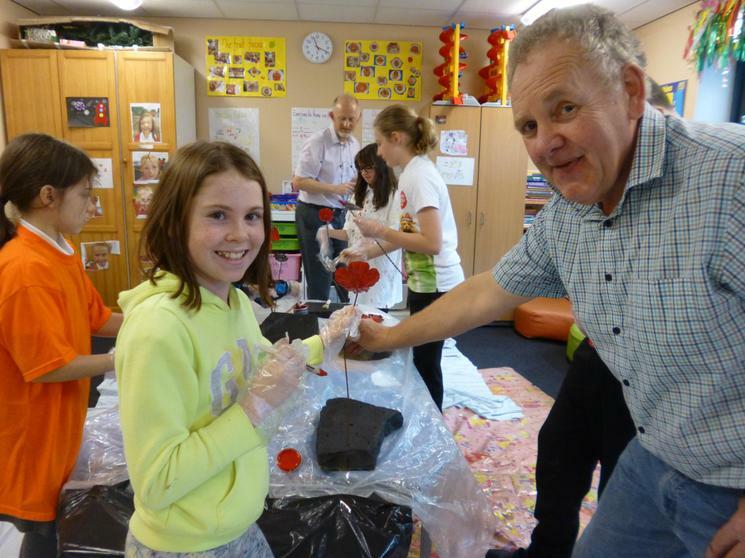 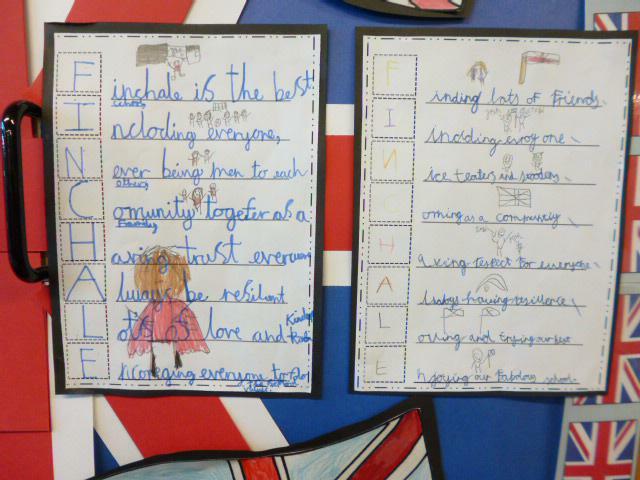 We had some special guests in school who talked with the children about their own experiences of war. 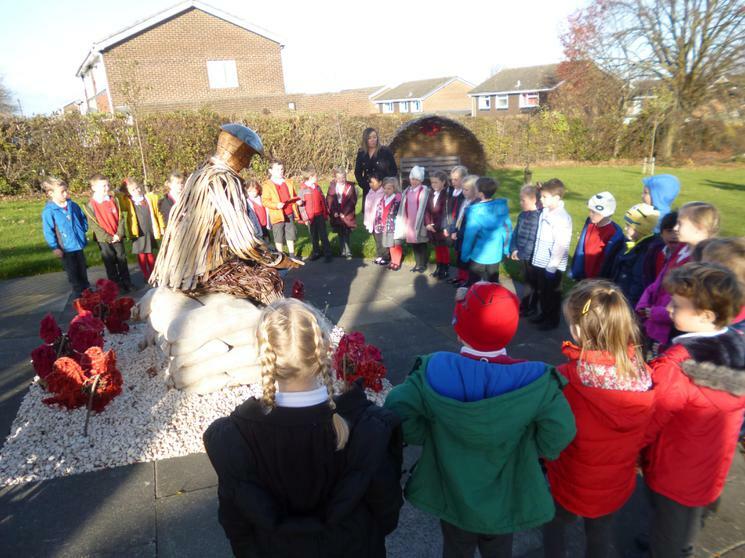 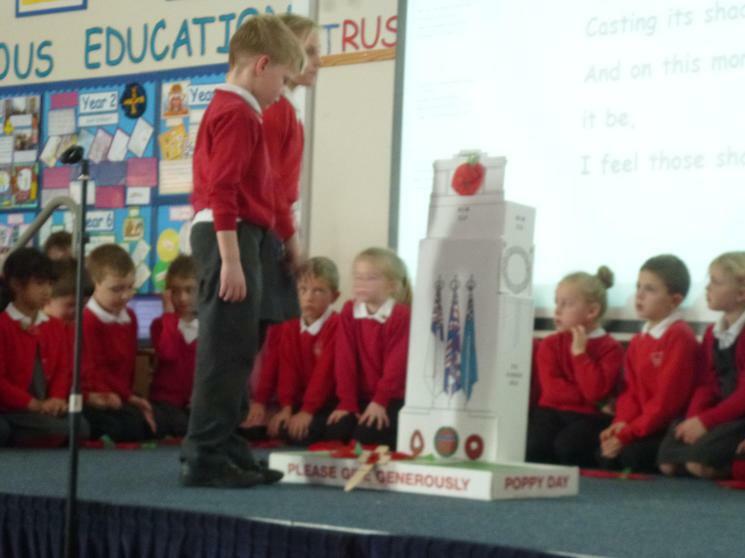 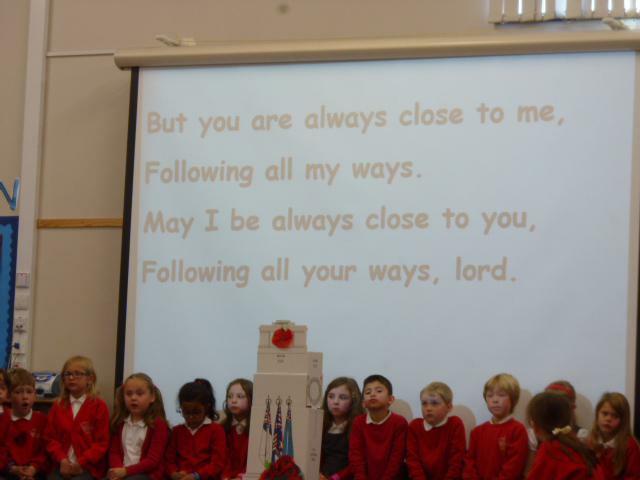 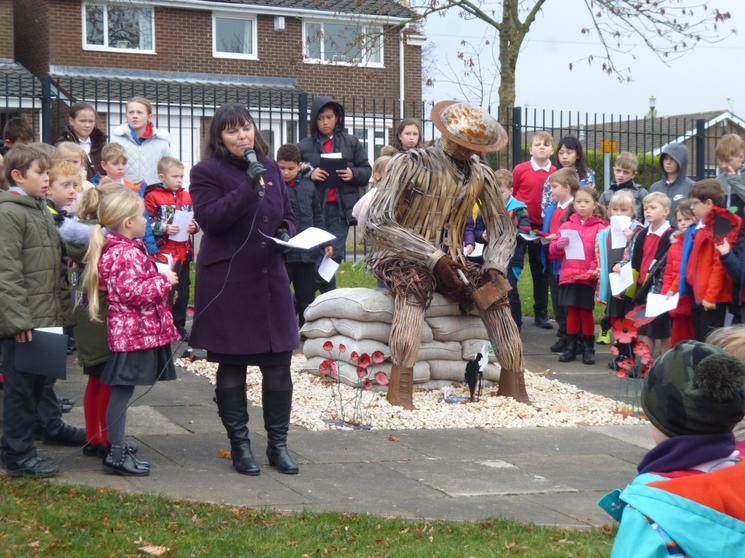 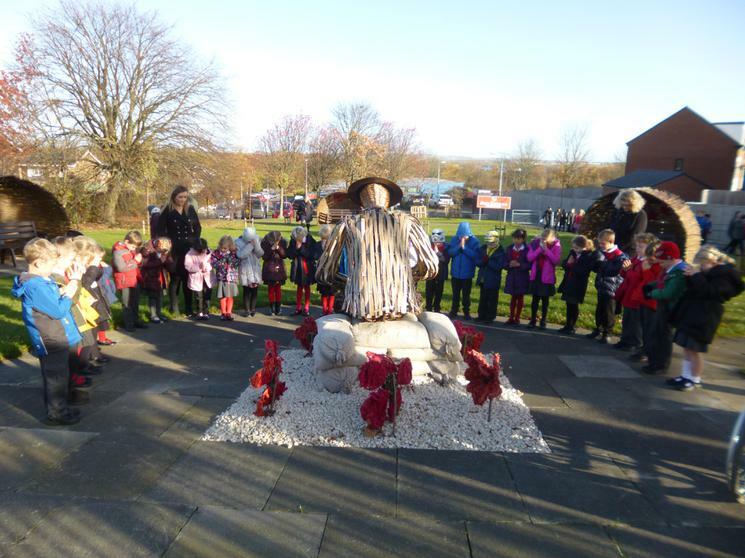 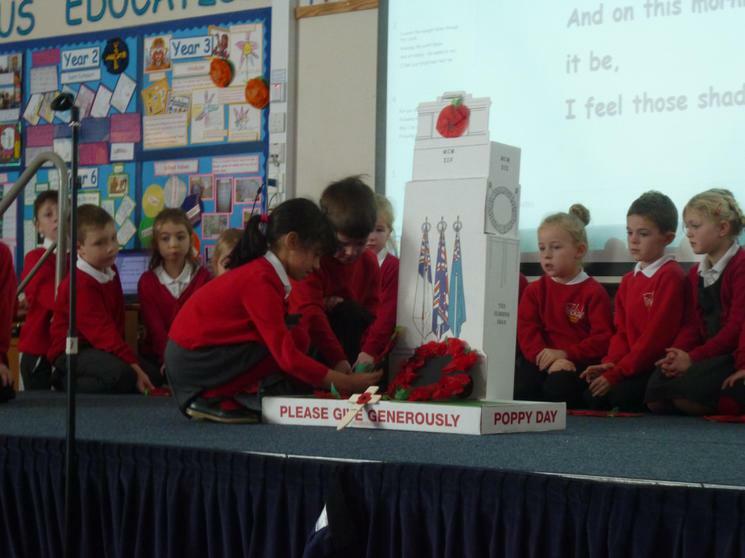 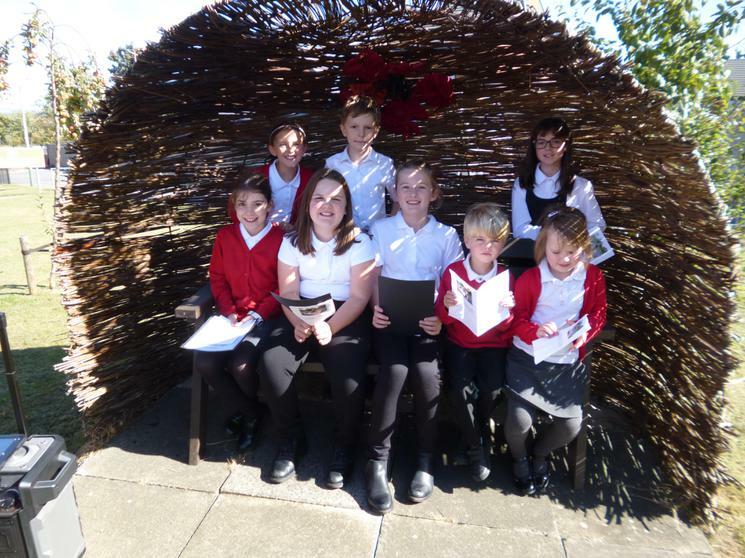 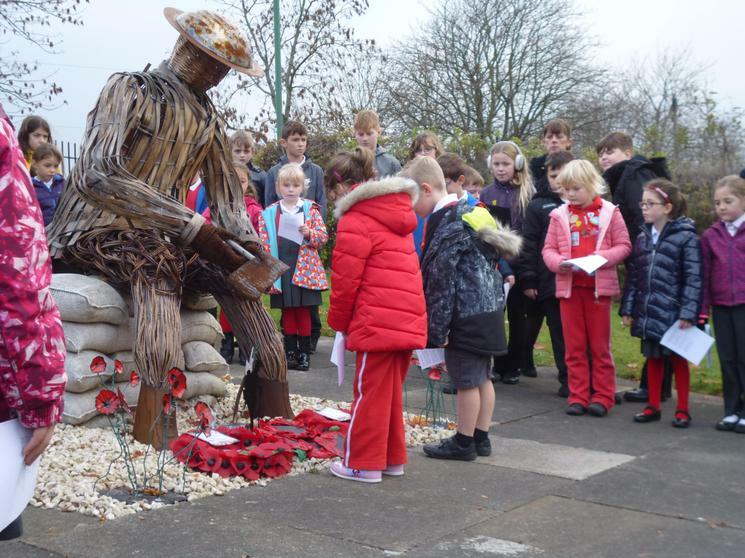 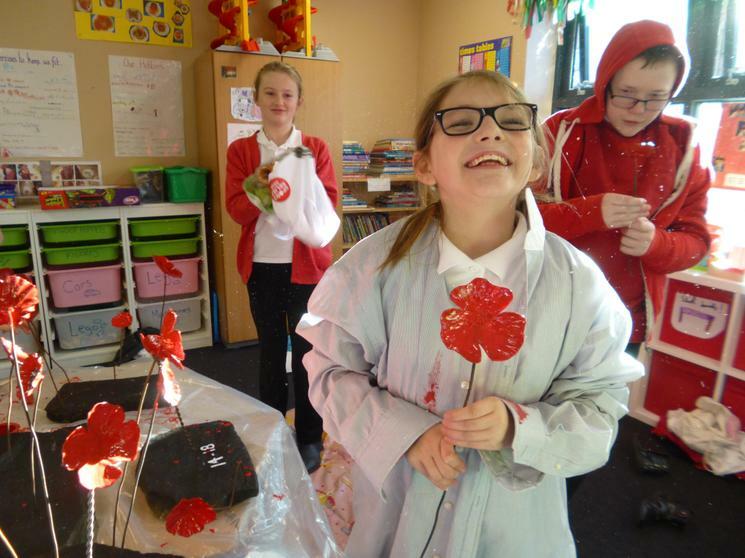 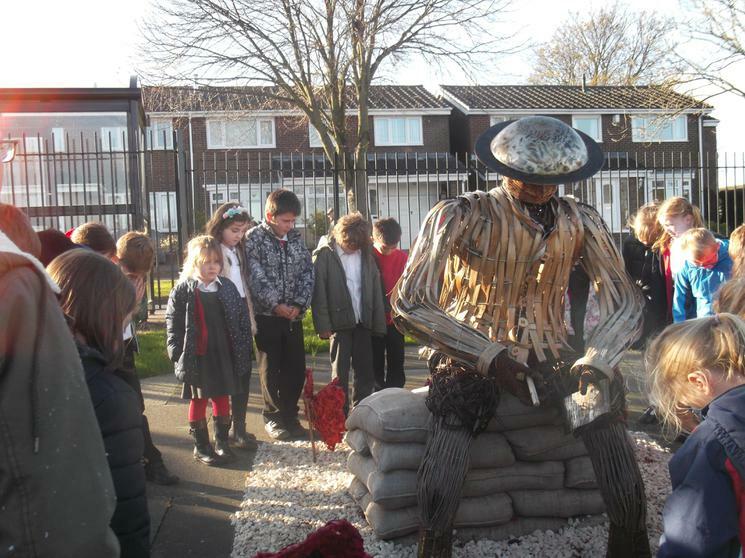 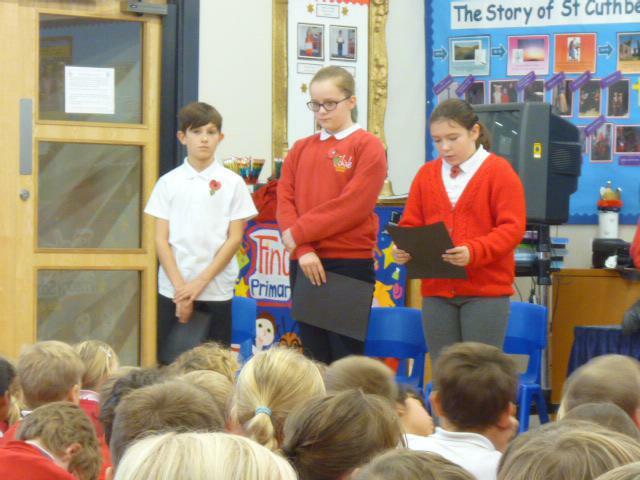 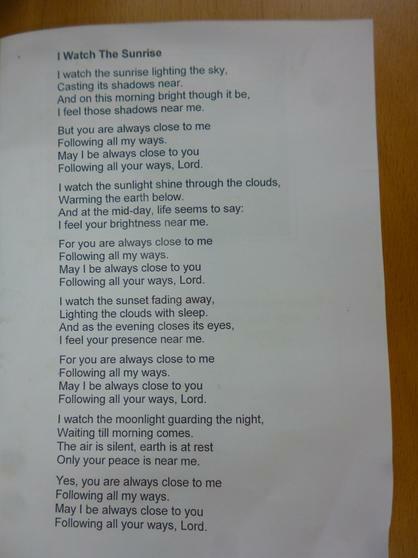 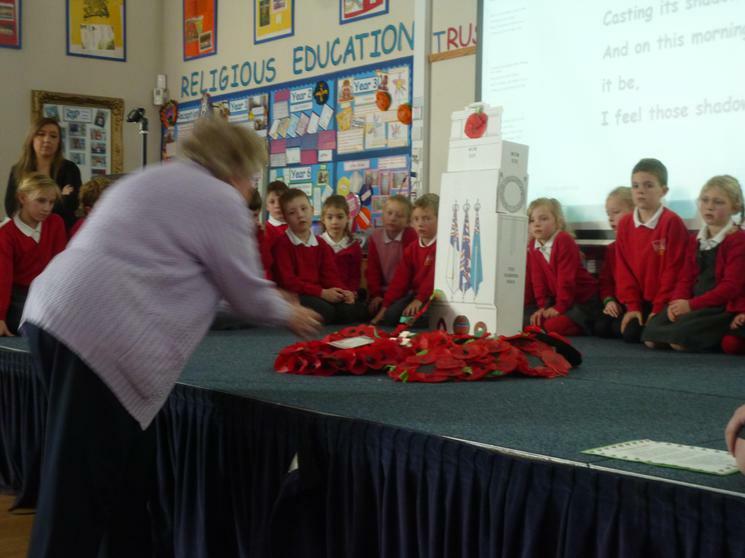 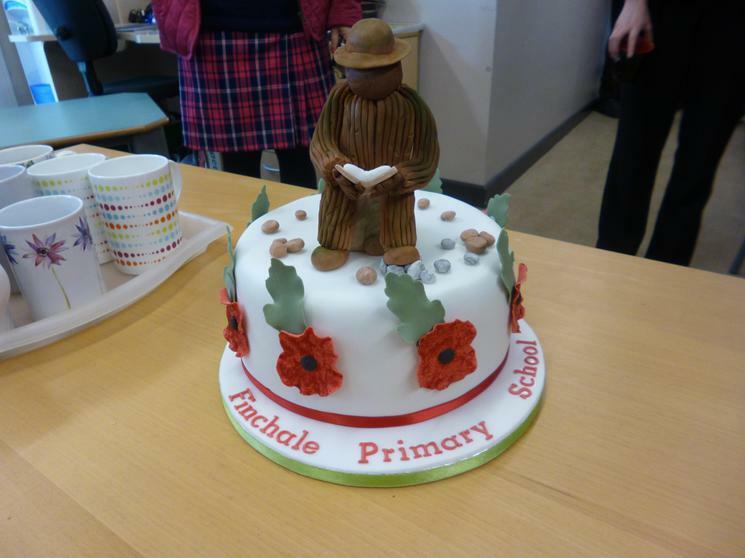 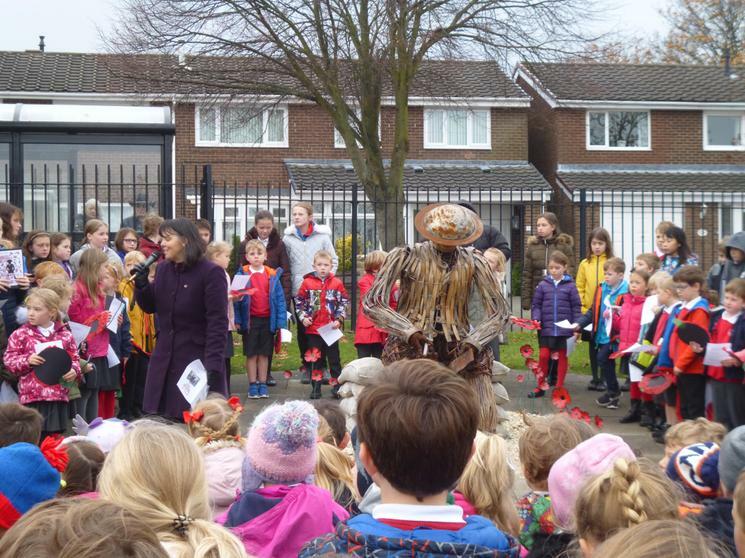 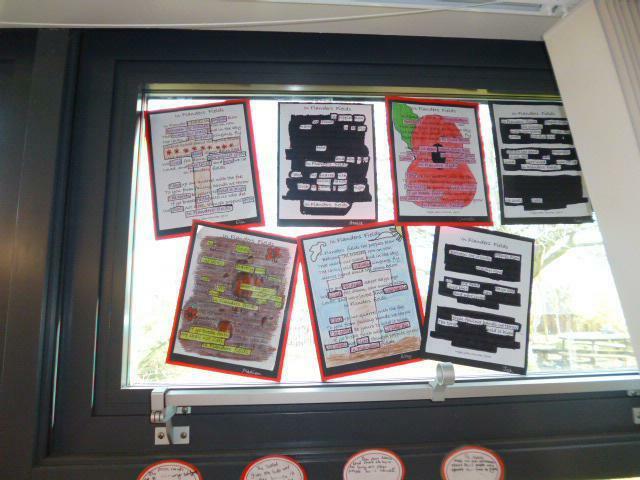 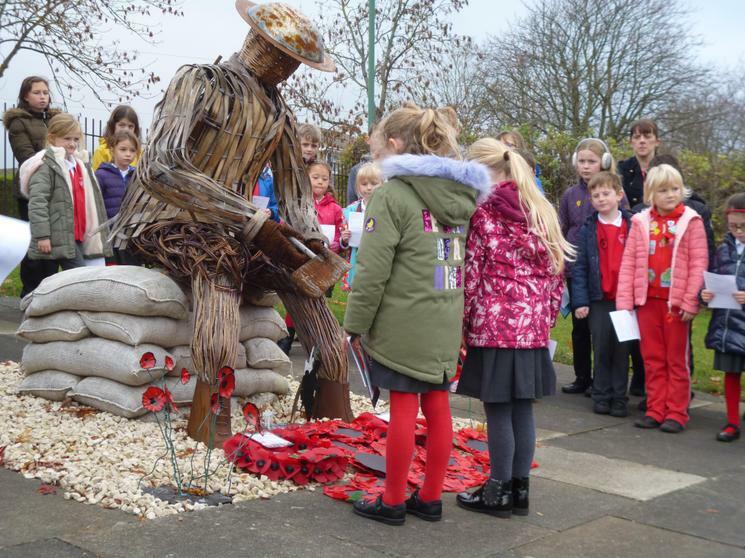 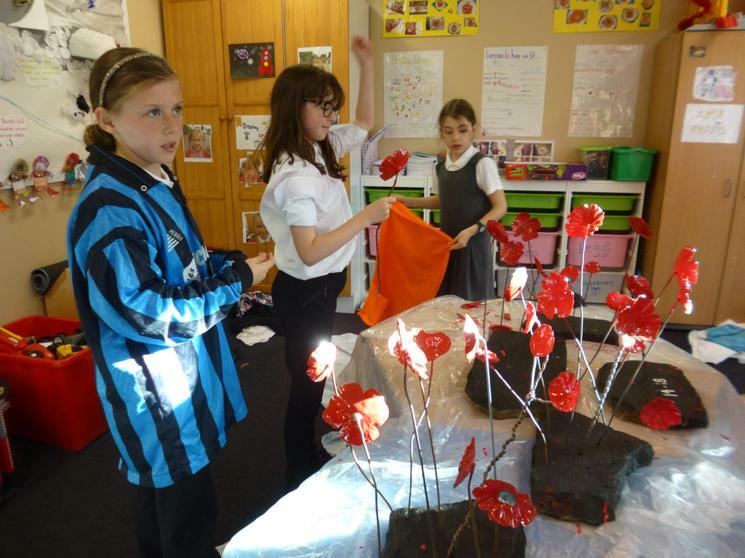 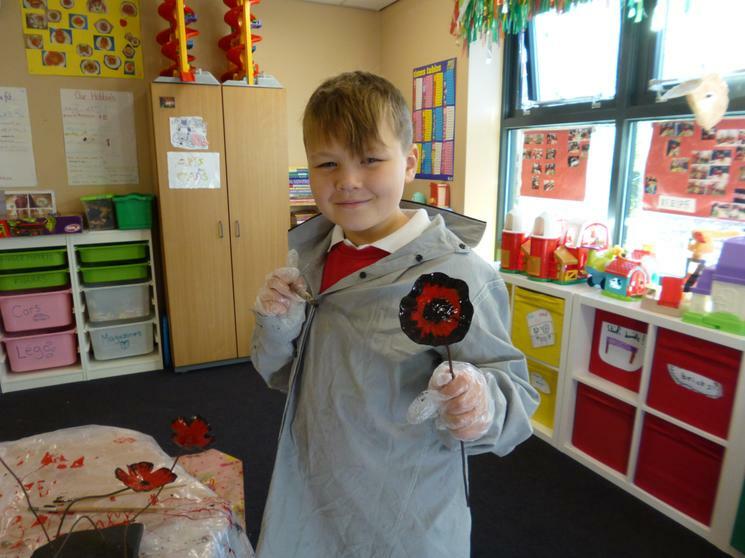 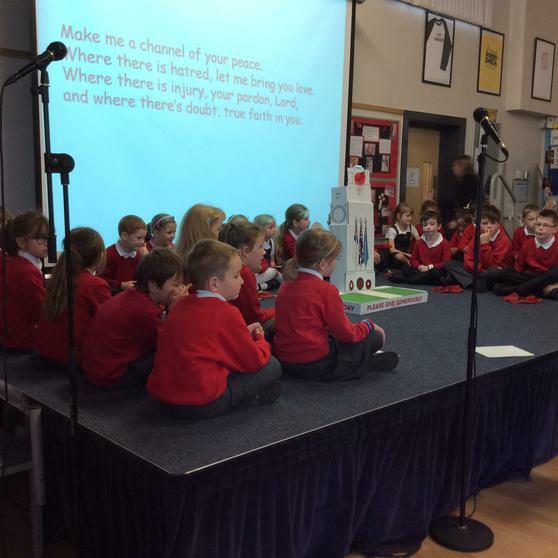 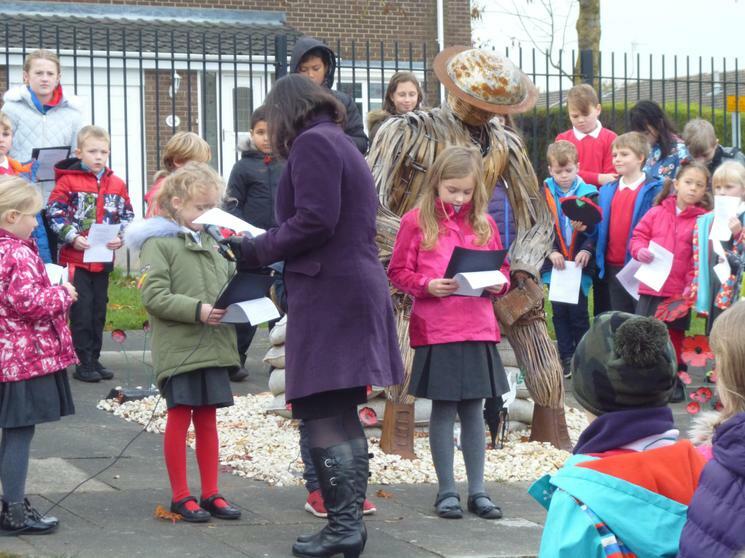 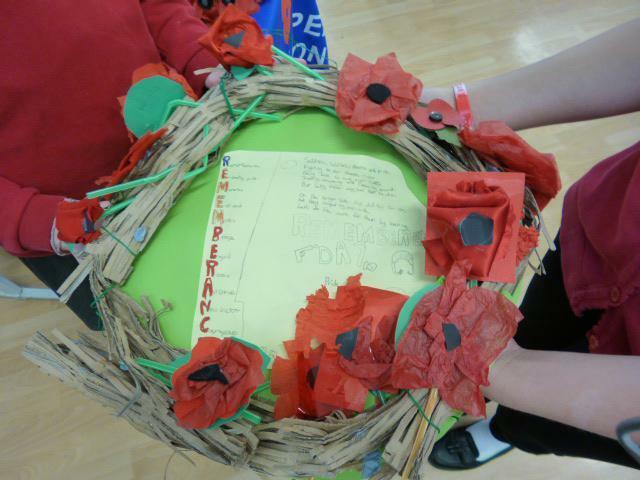 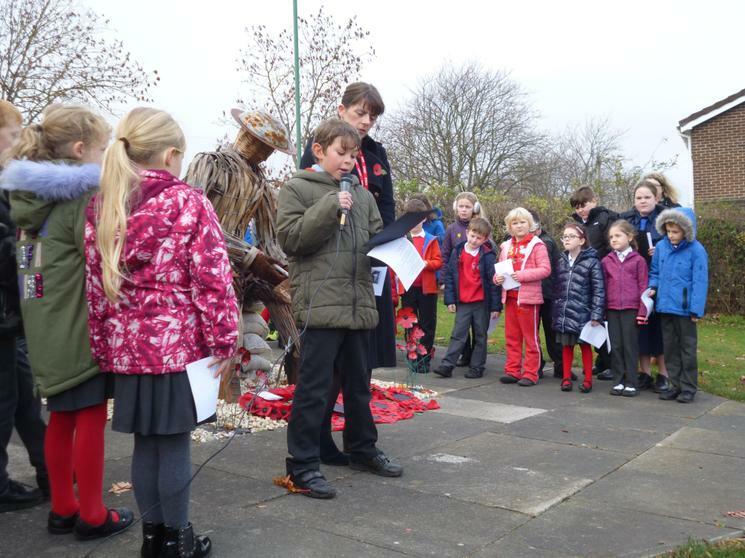 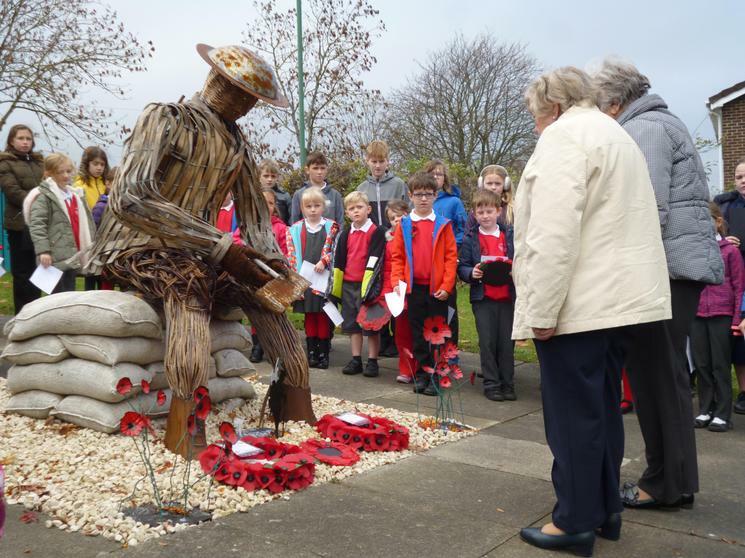 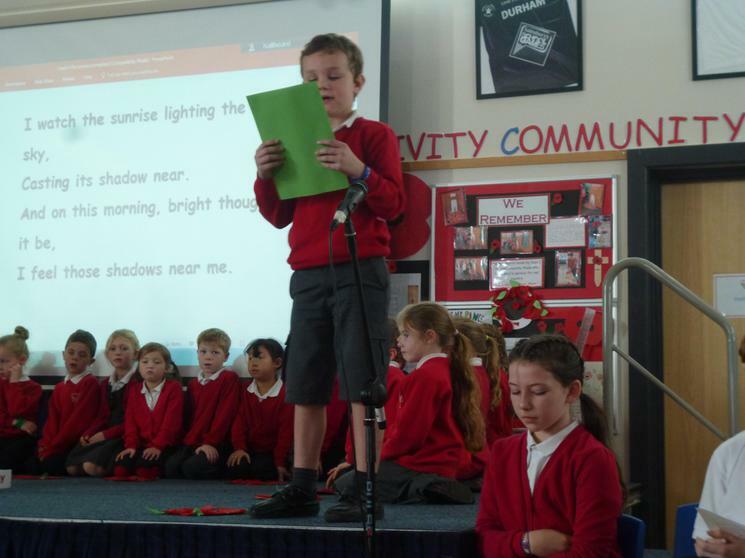 Year 2 pupils read the poem In Flanders Fields and Year 6 pupils, who had analysed the same poem read out, in their own words, what it really meant to them. 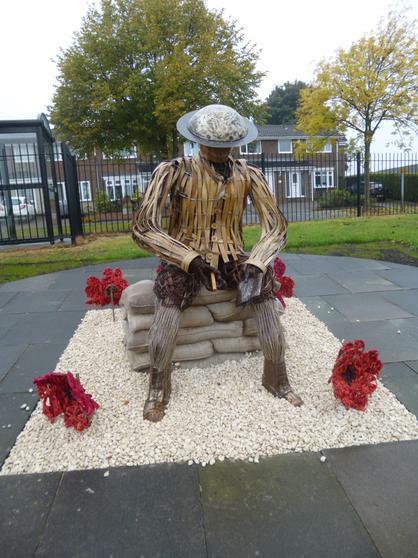 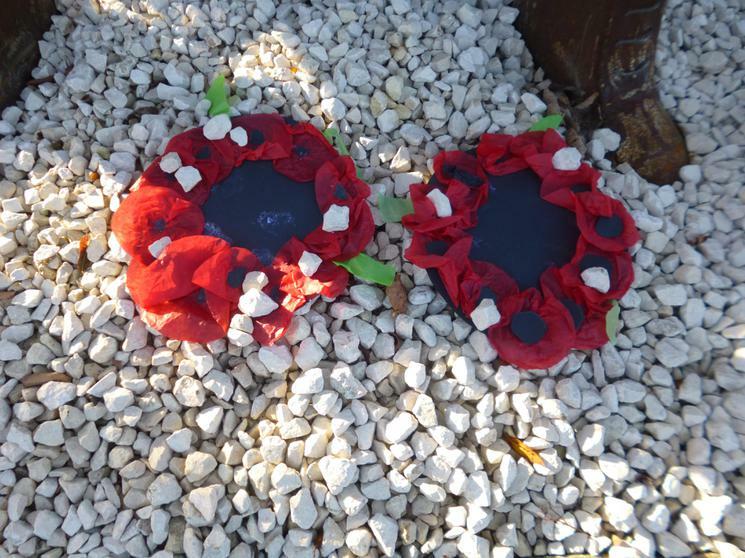 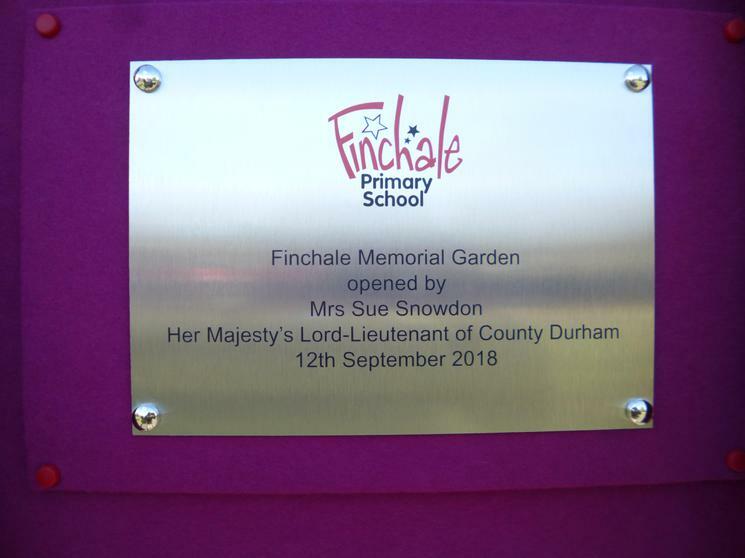 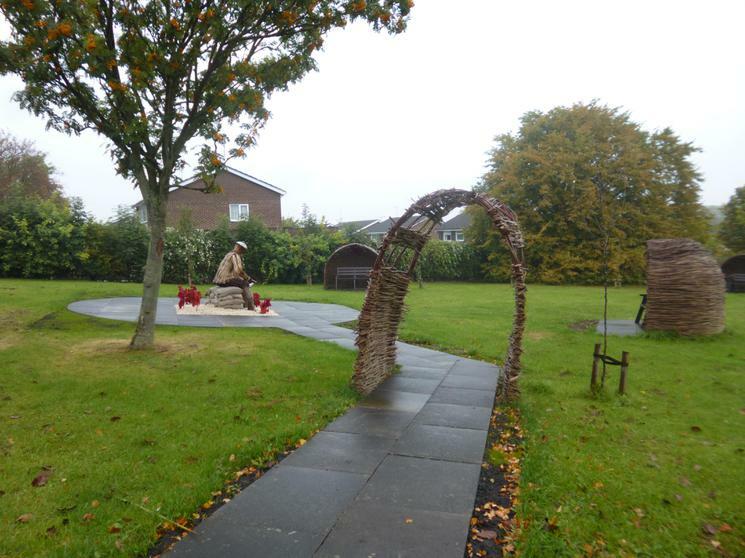 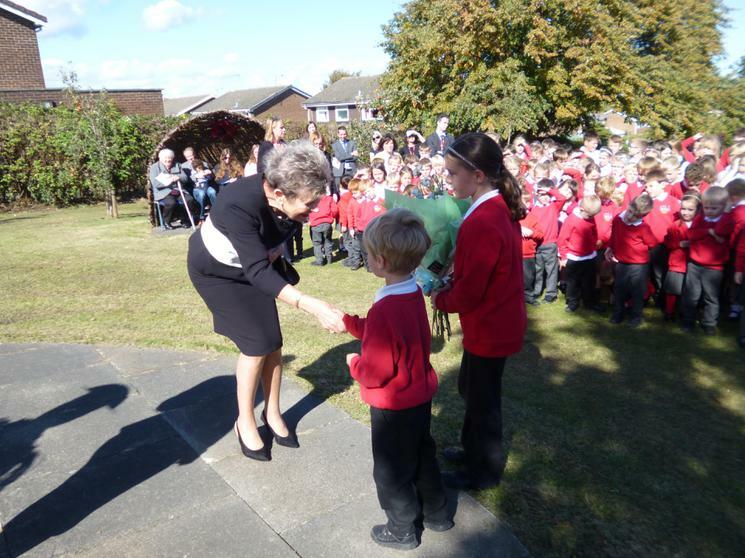 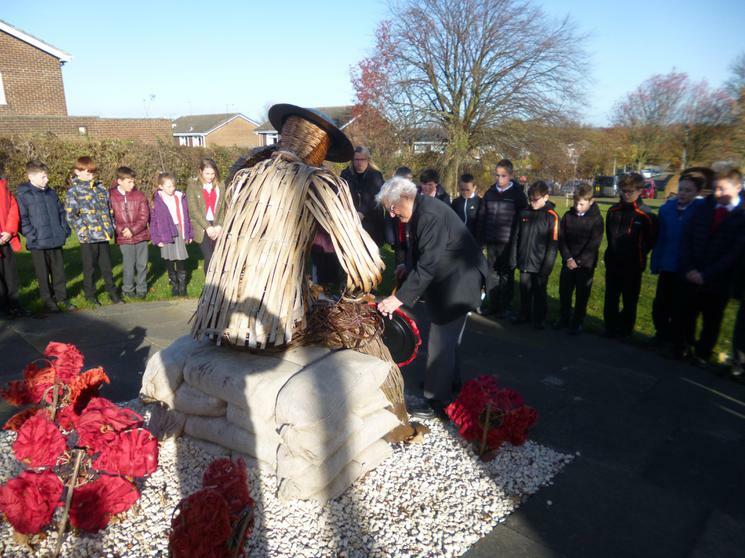 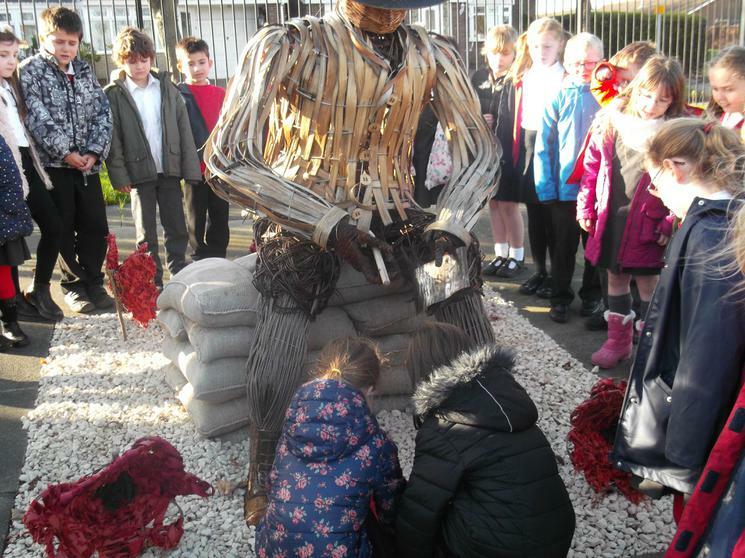 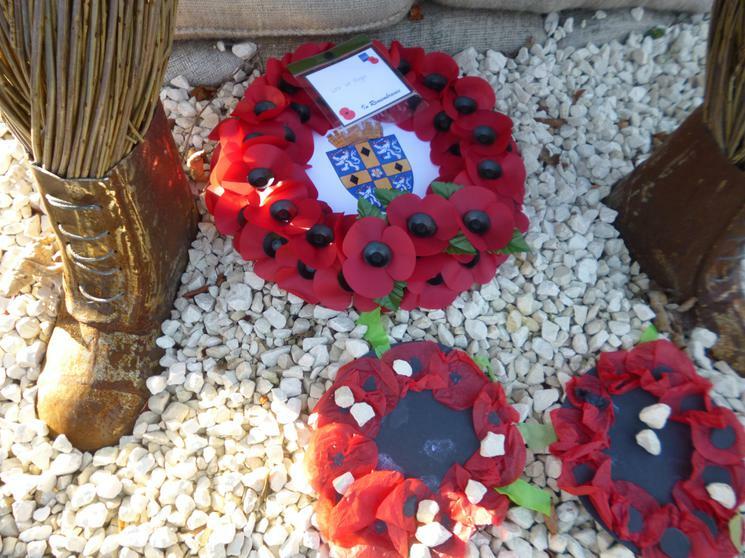 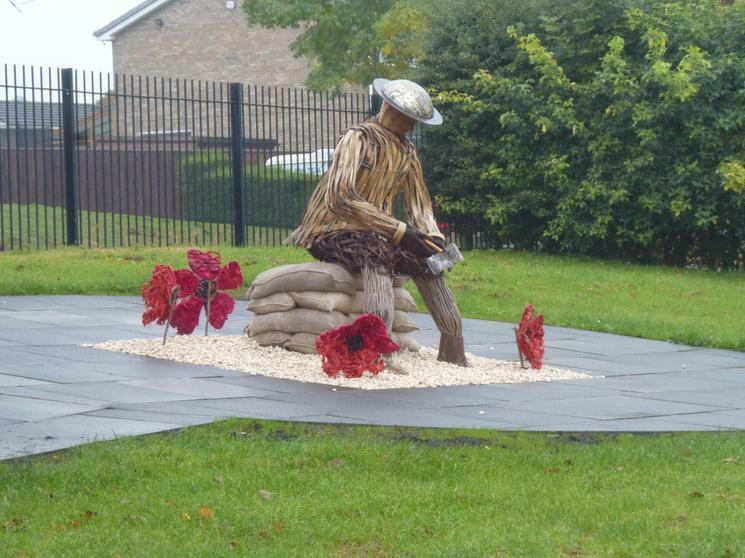 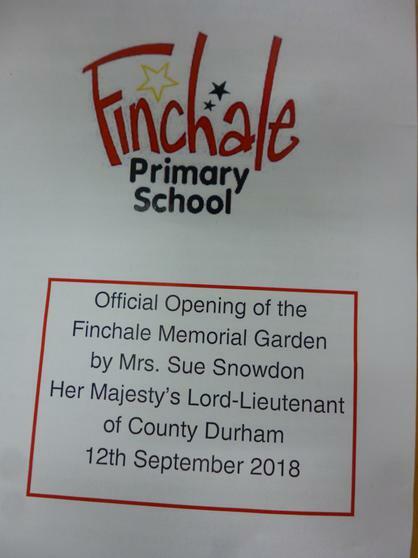 Wreaths were laid in school and at the foot of the Finchale Soldier in the Memorial Garden. 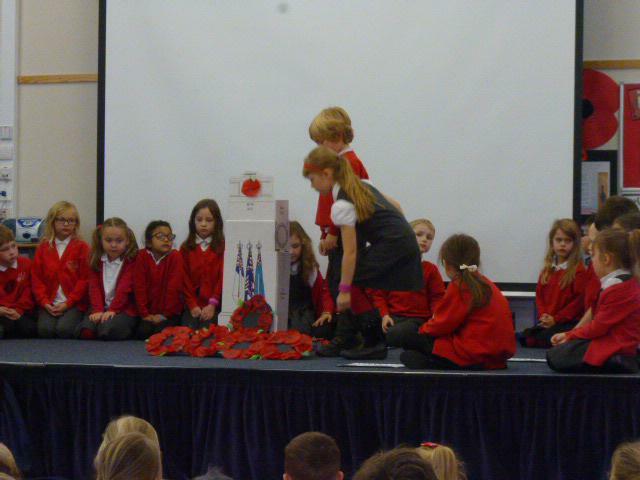 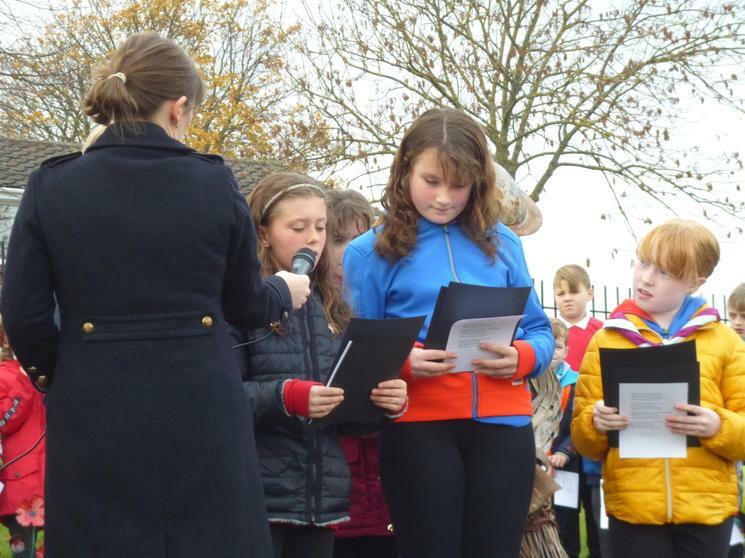 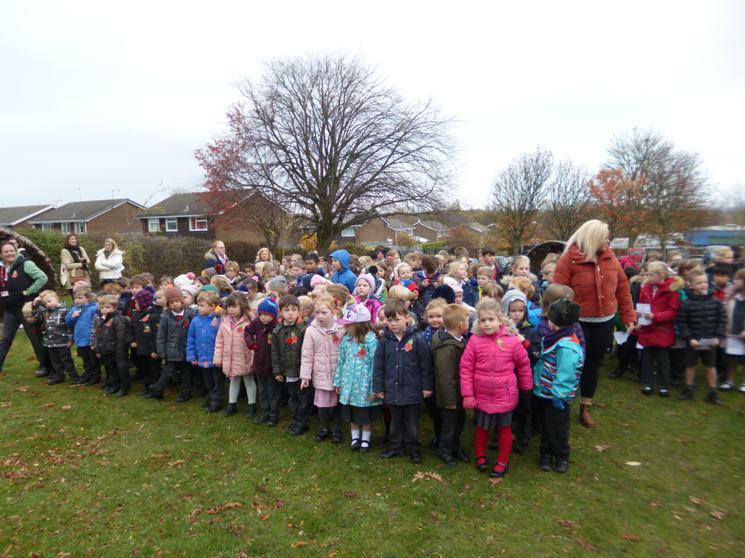 The children found the service very emotional and poignant. 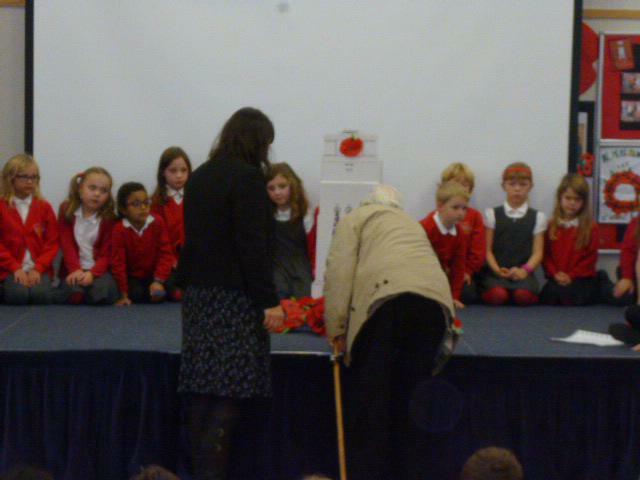 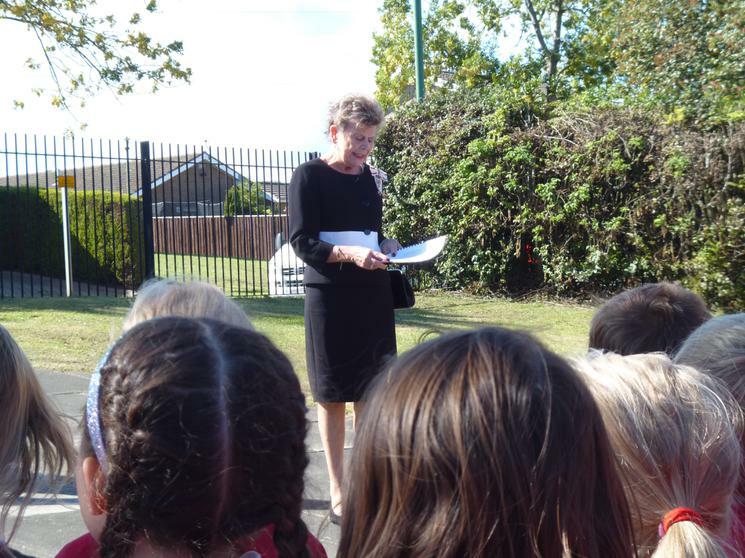 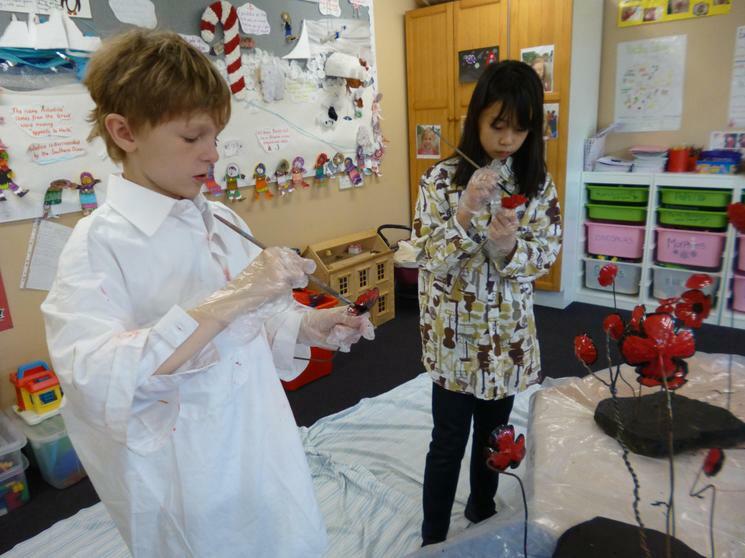 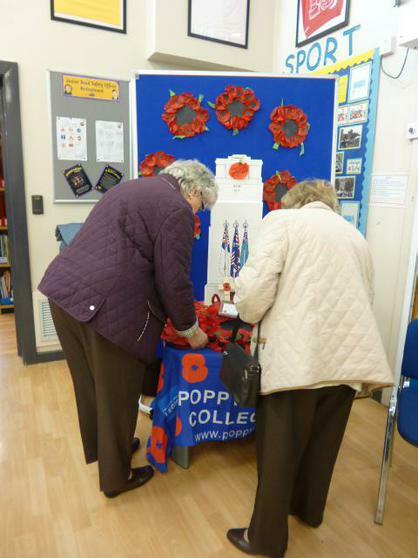 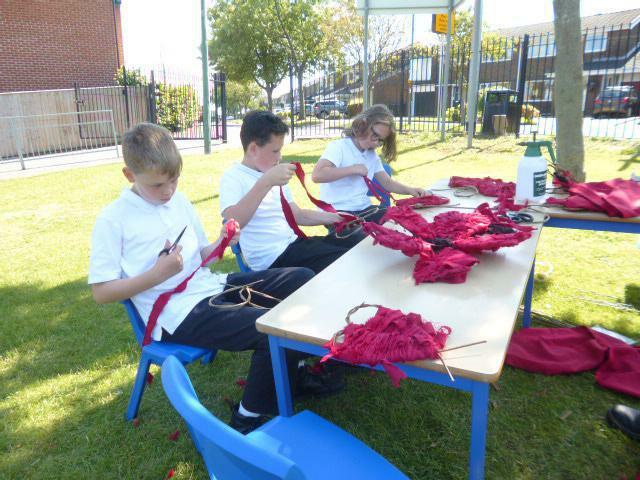 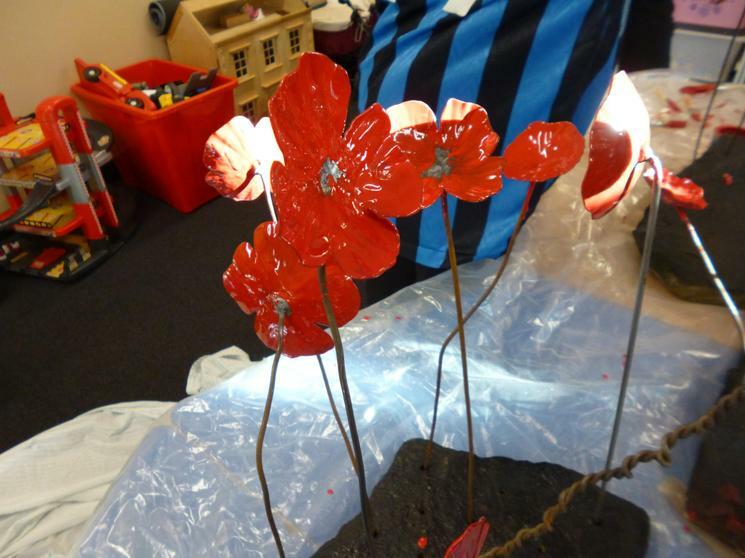 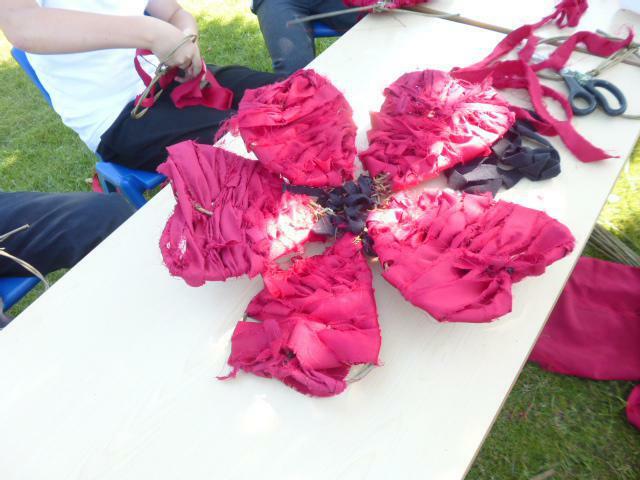 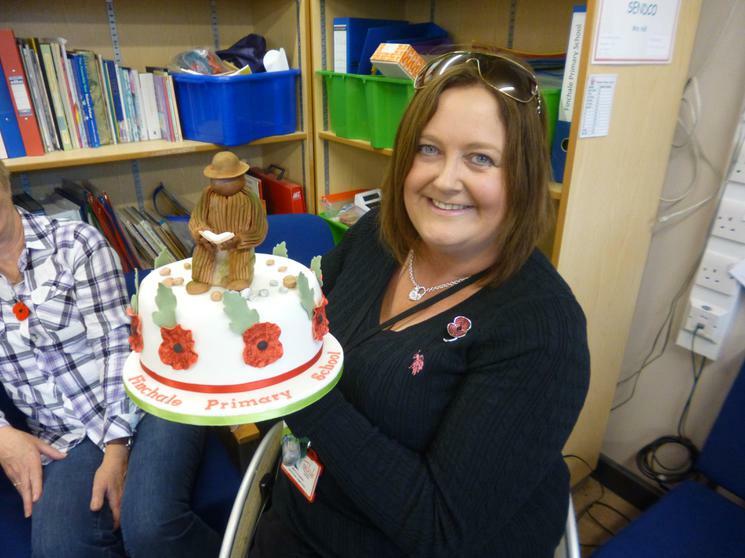 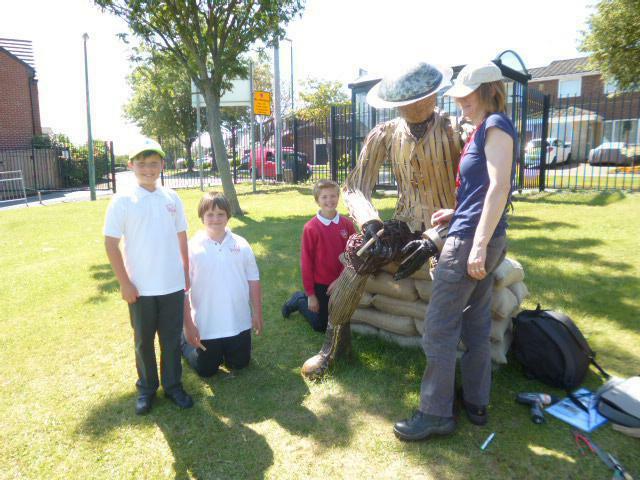 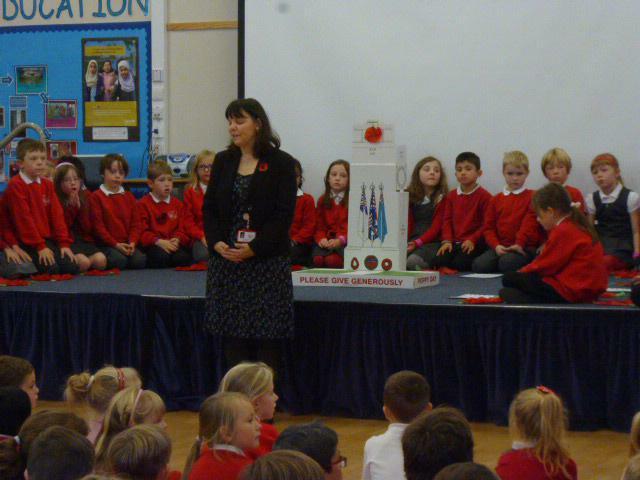 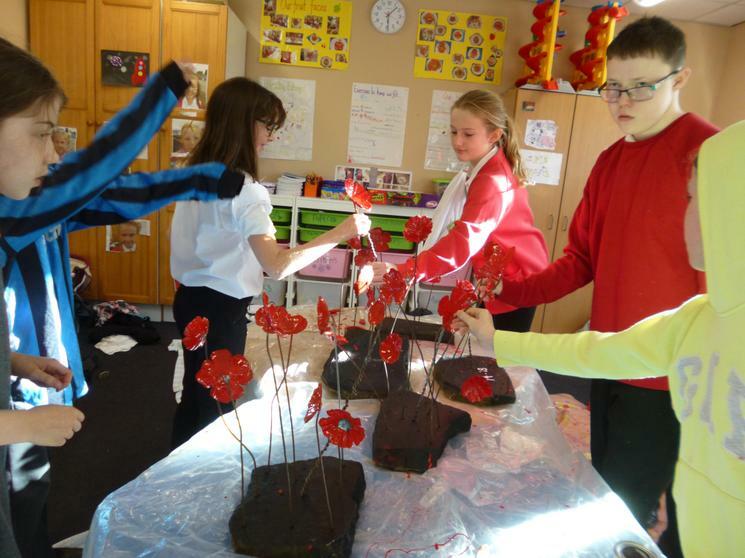 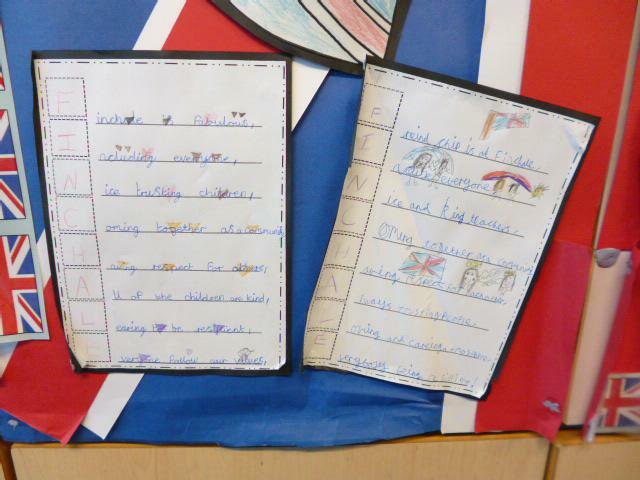 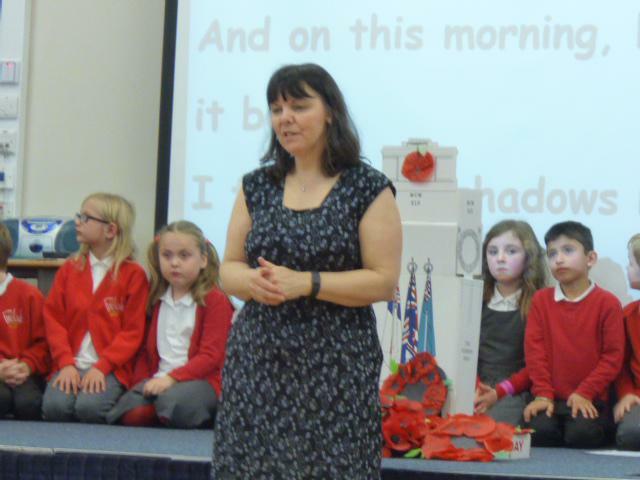 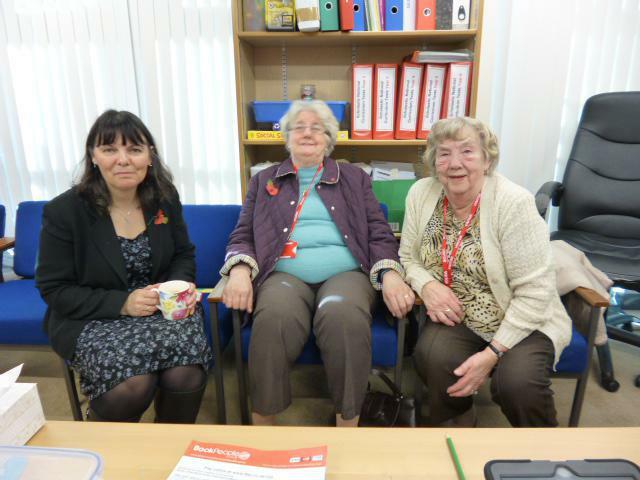 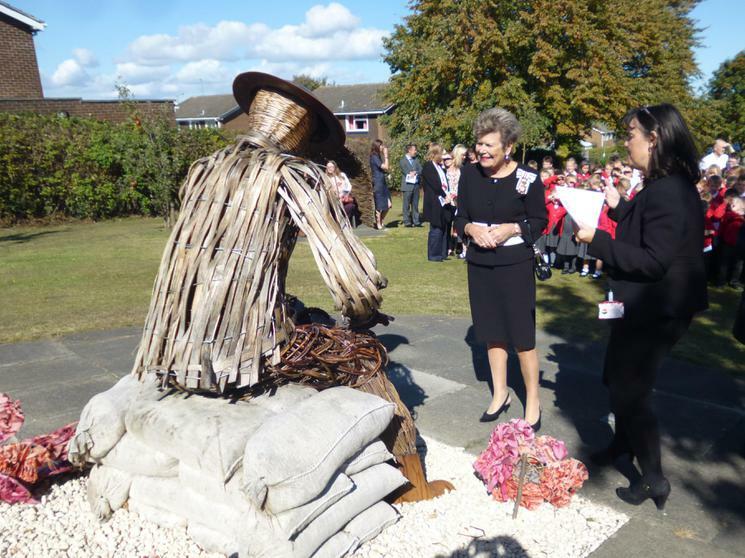 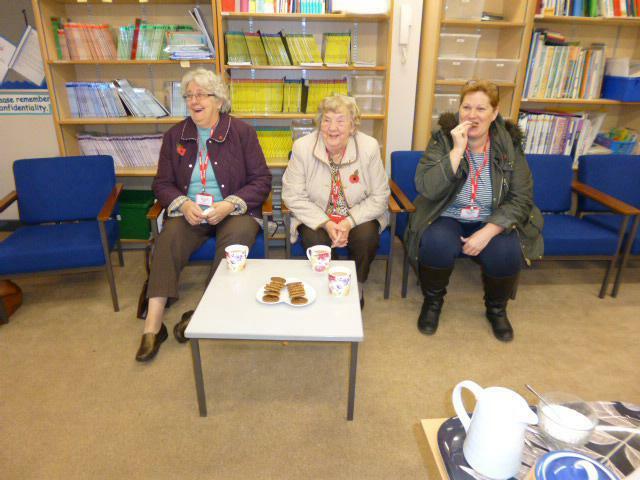 Mrs Sleeman also explained that it was the 100 year anniversary of the battle of Passchendaele. 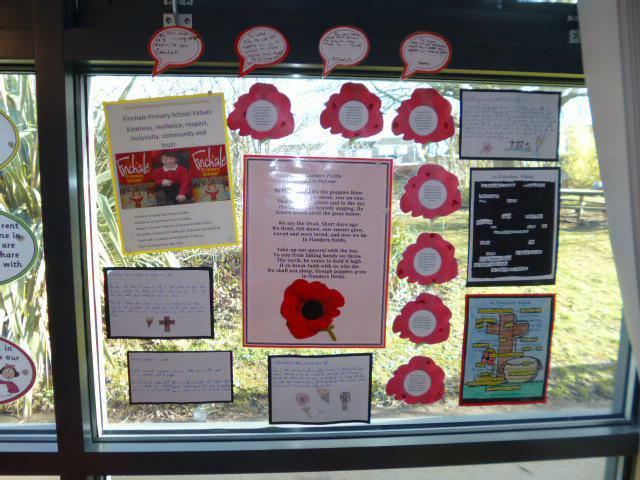 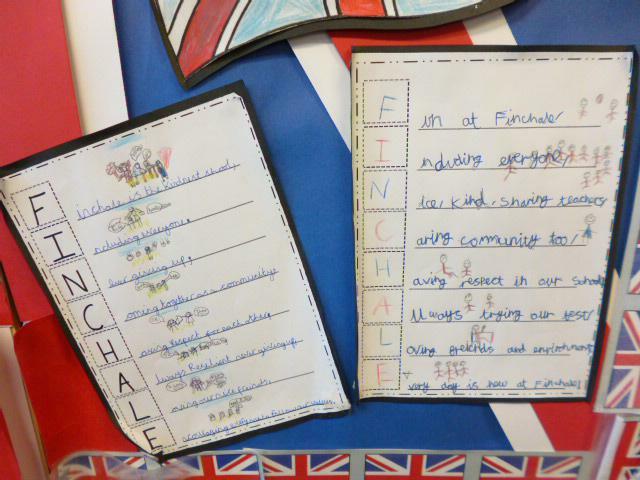 We spent time reflecting on how lucky we are to have benefitted from the selfless and heroic acts of others during all wars. 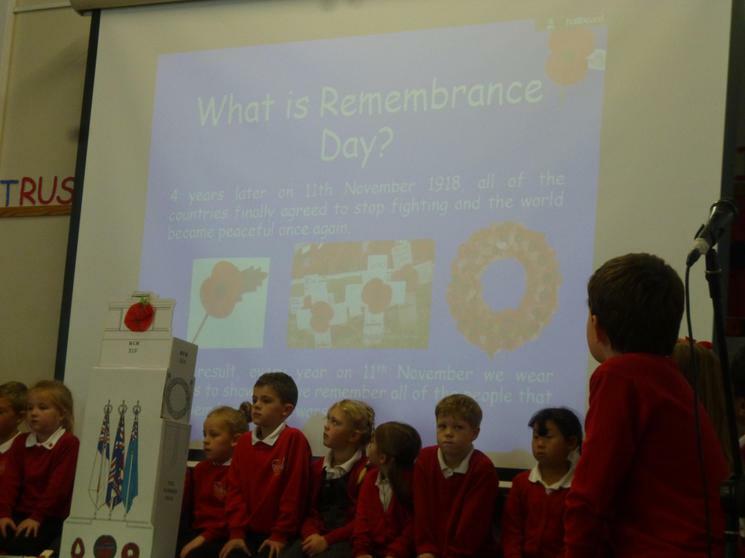 People, many of whom were still young, gave their lives so that we could live peacefully today. 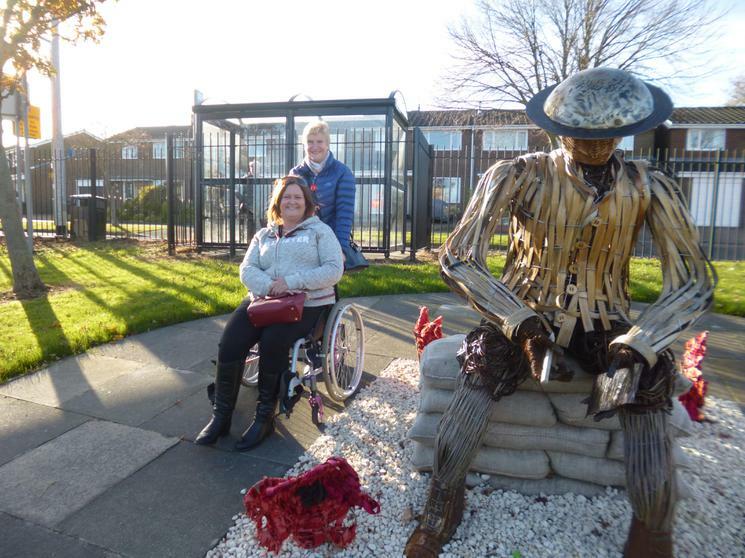 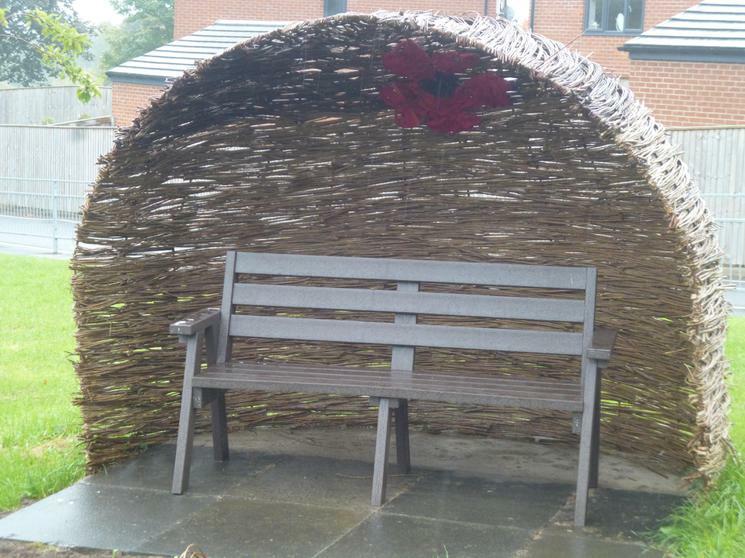 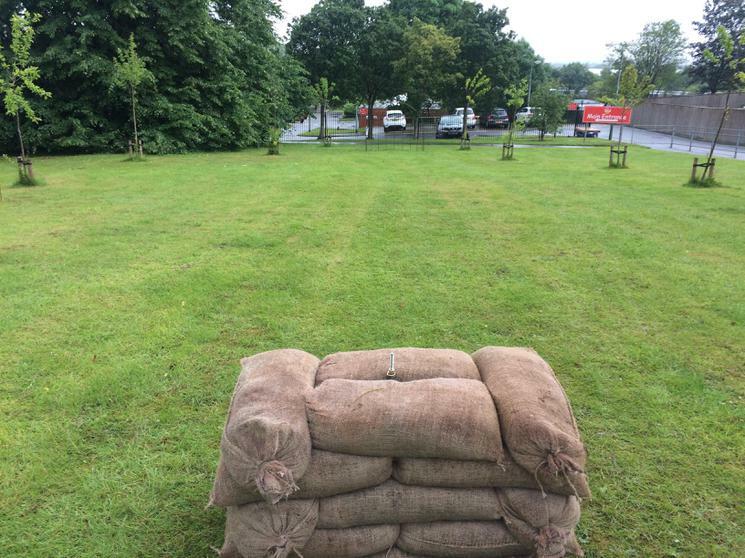 I am delighted that our Memorial Garden is very nearly finished! 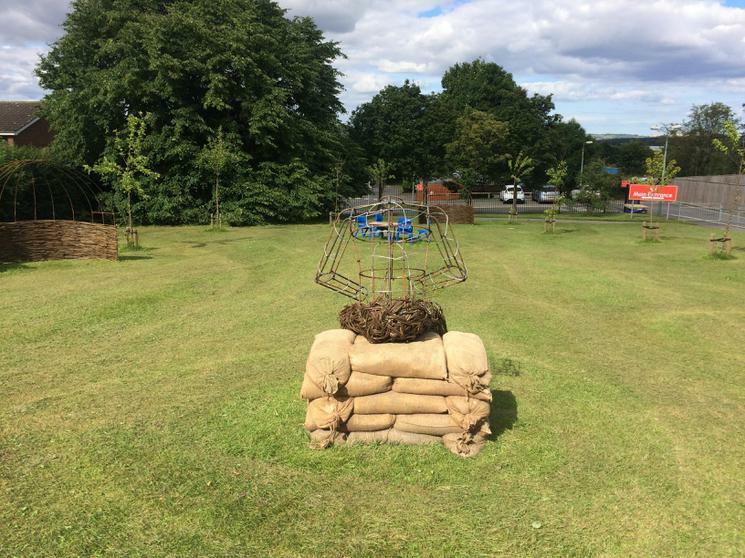 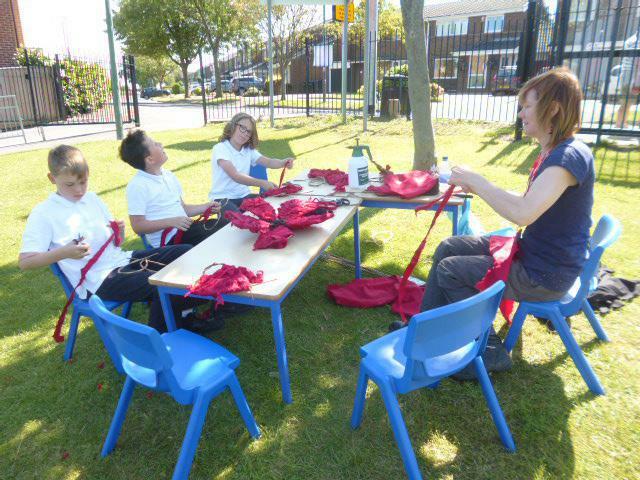 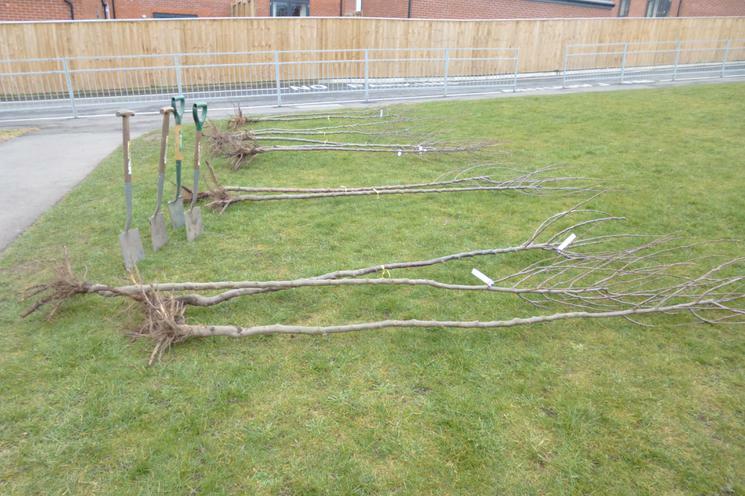 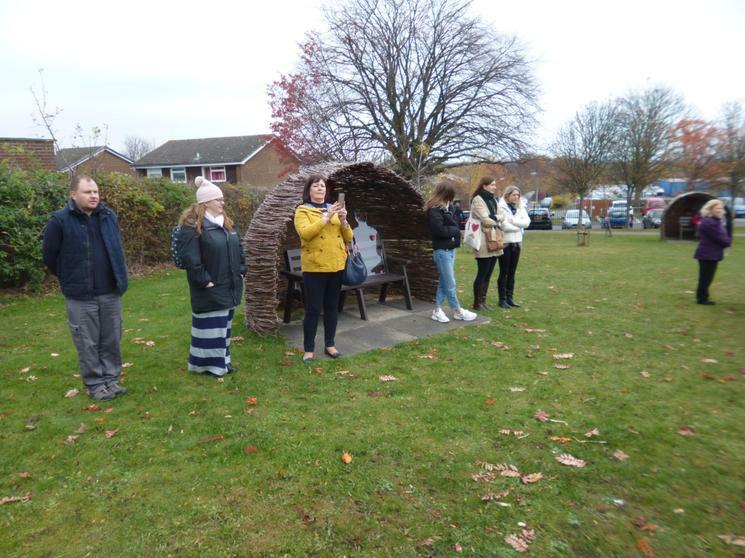 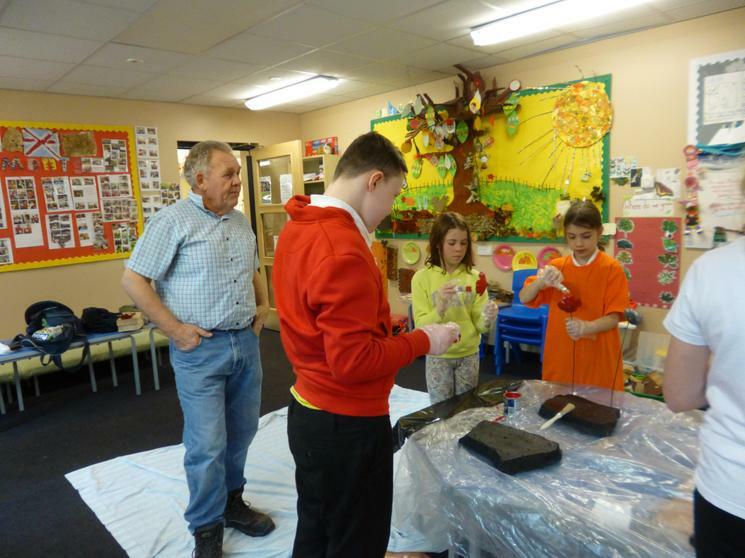 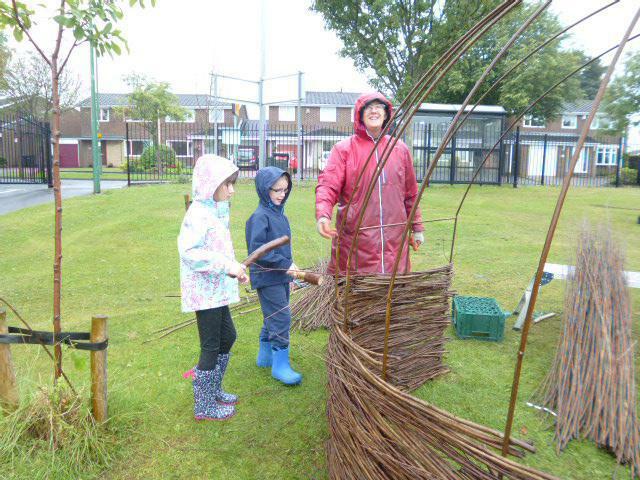 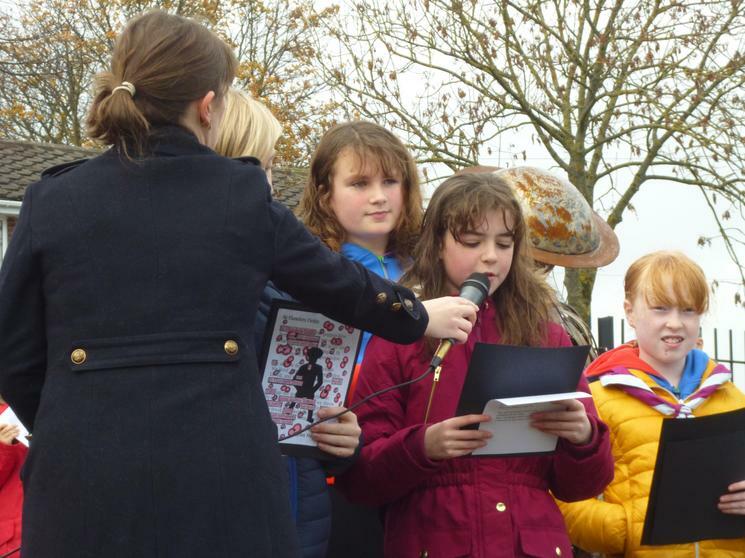 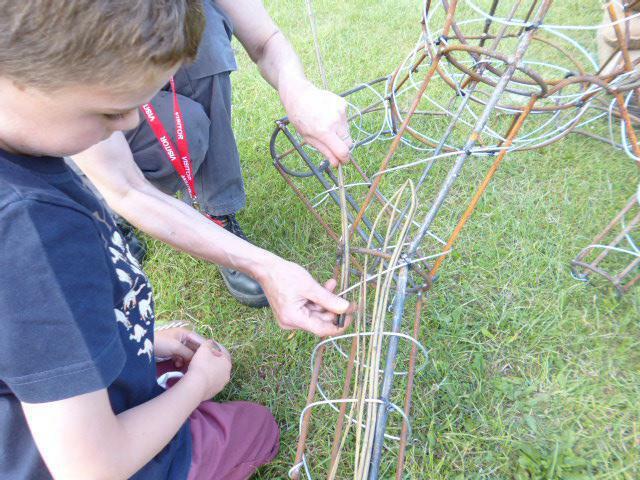 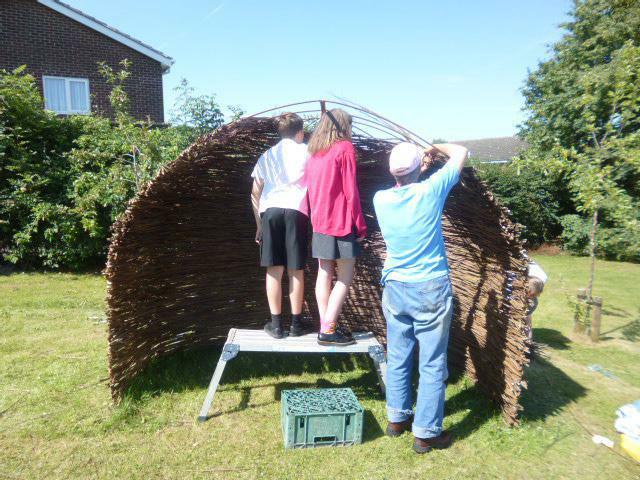 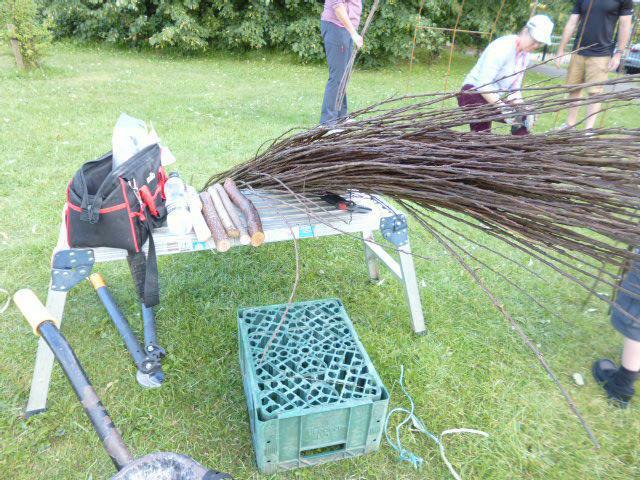 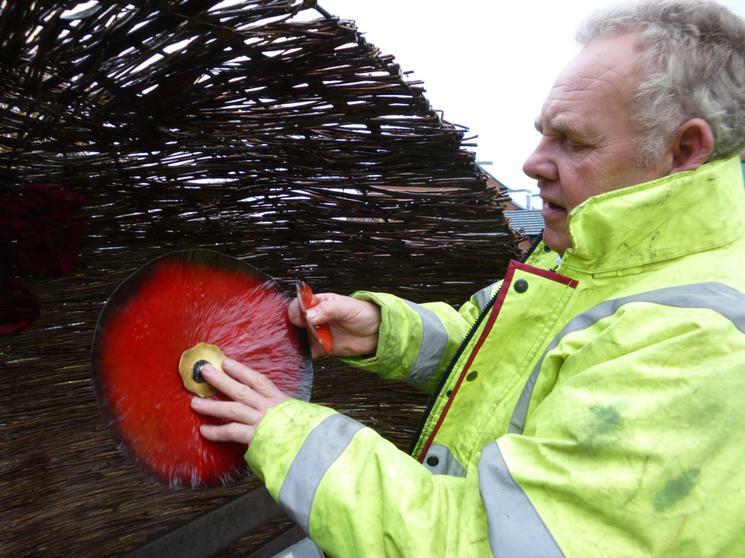 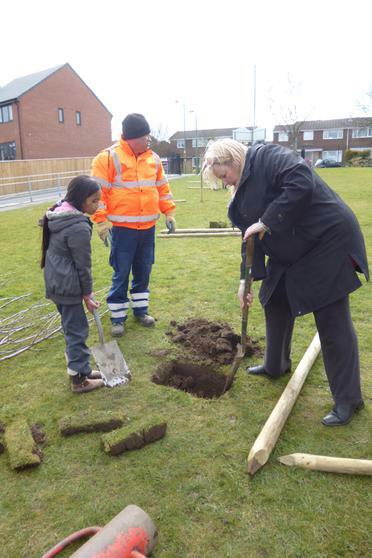 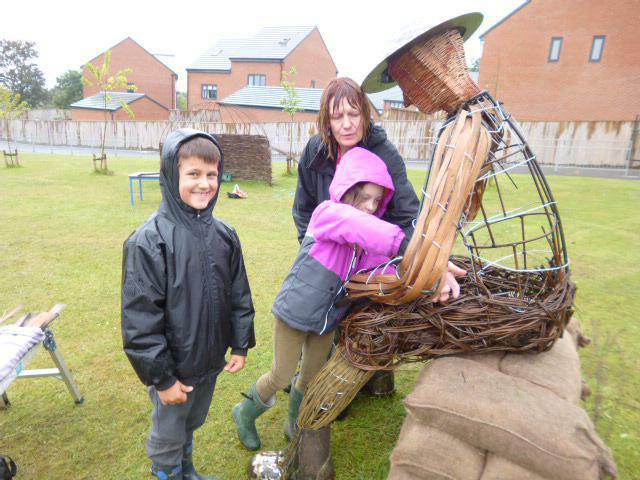 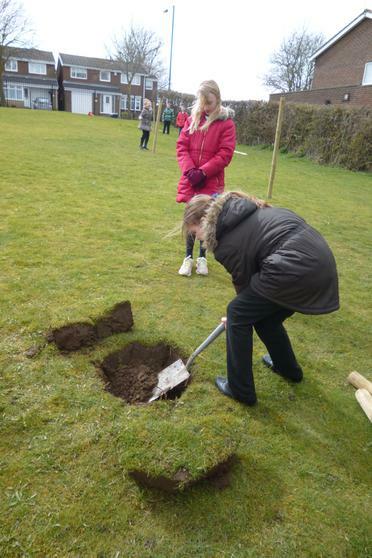 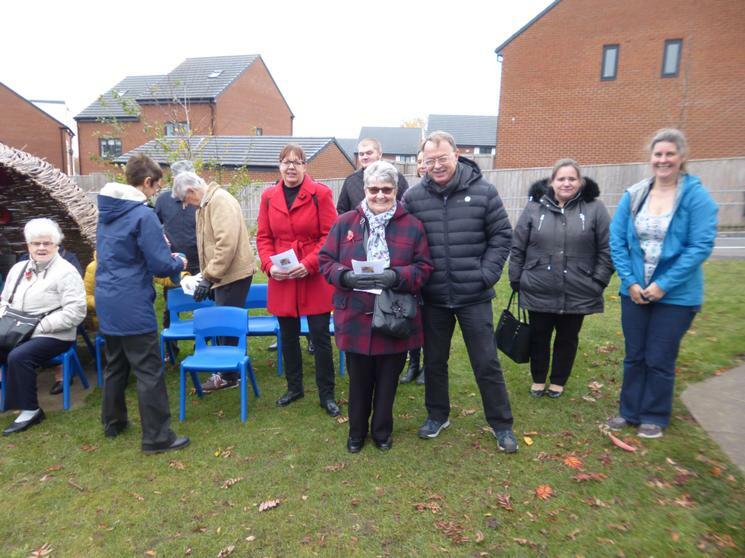 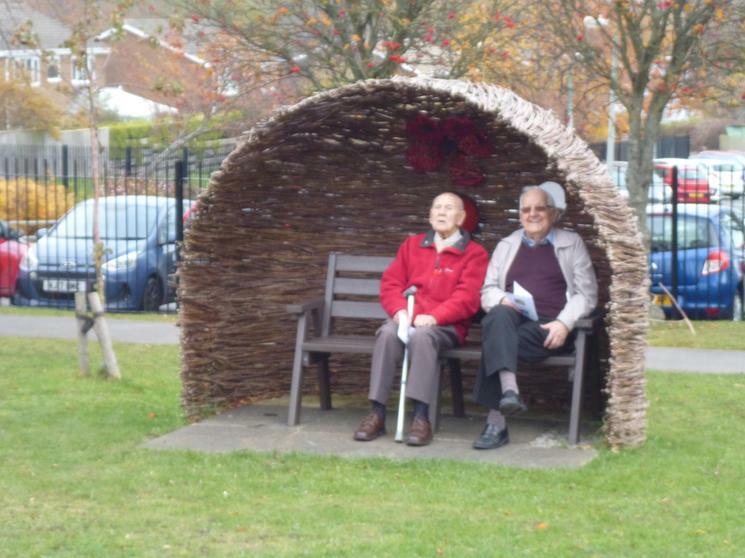 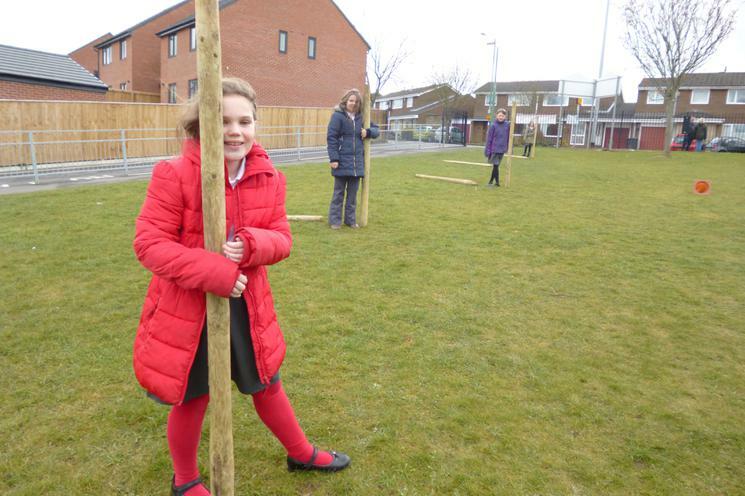 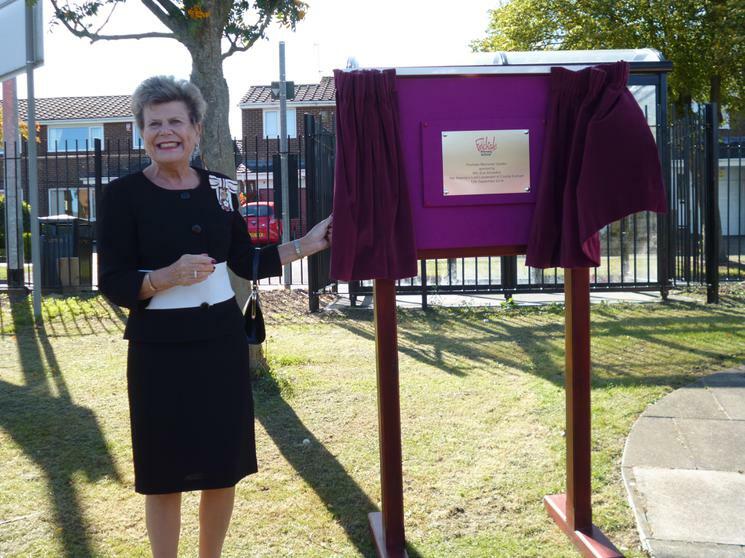 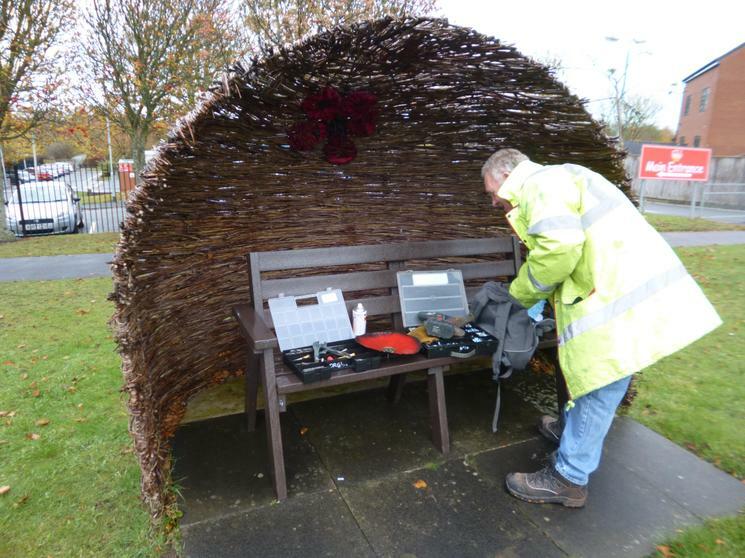 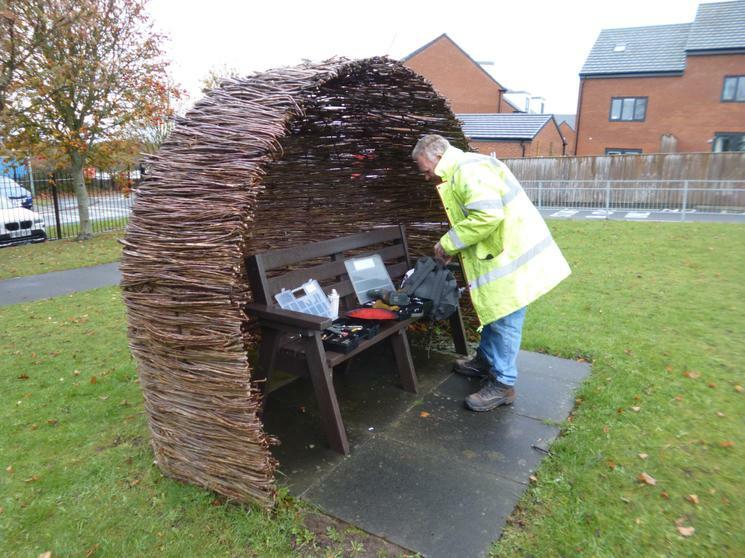 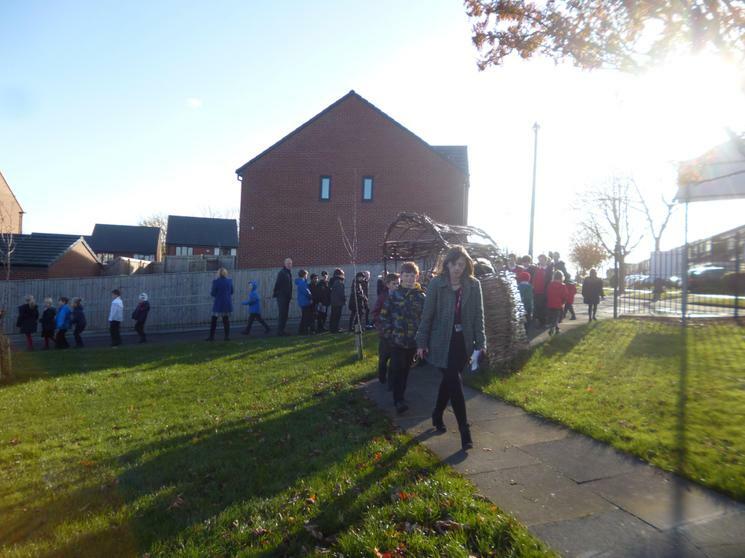 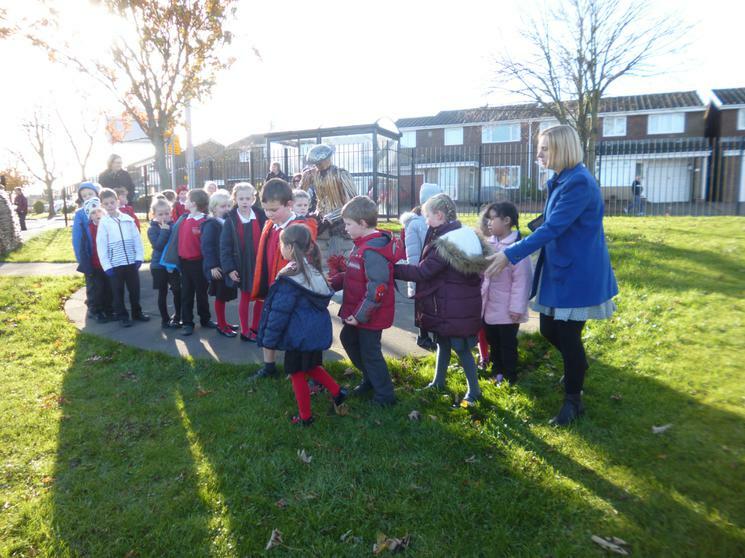 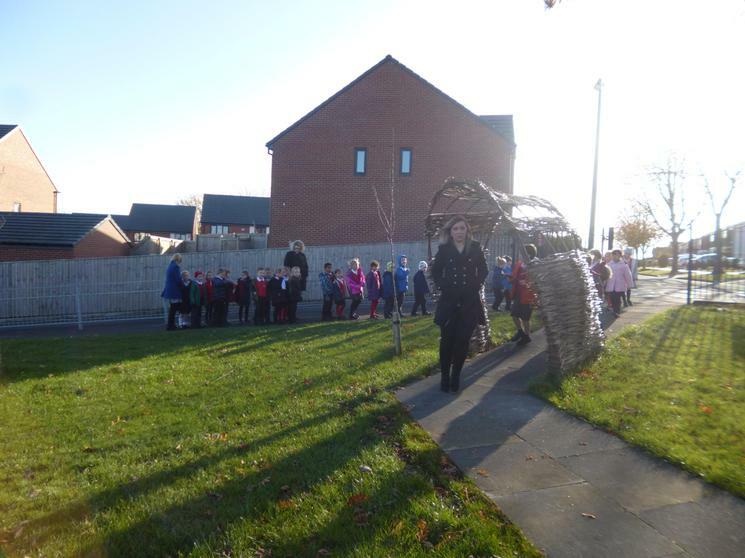 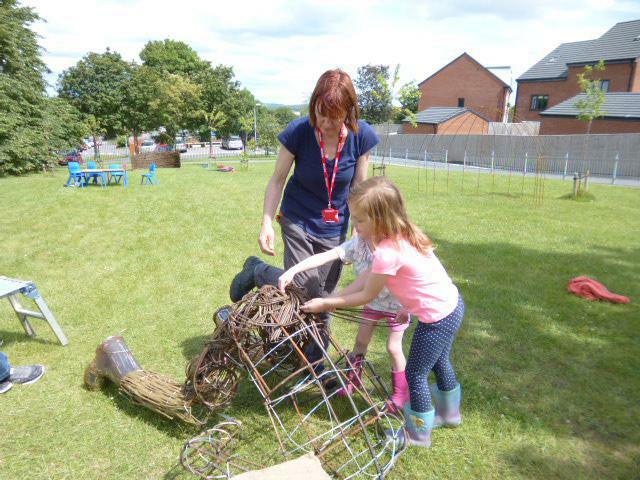 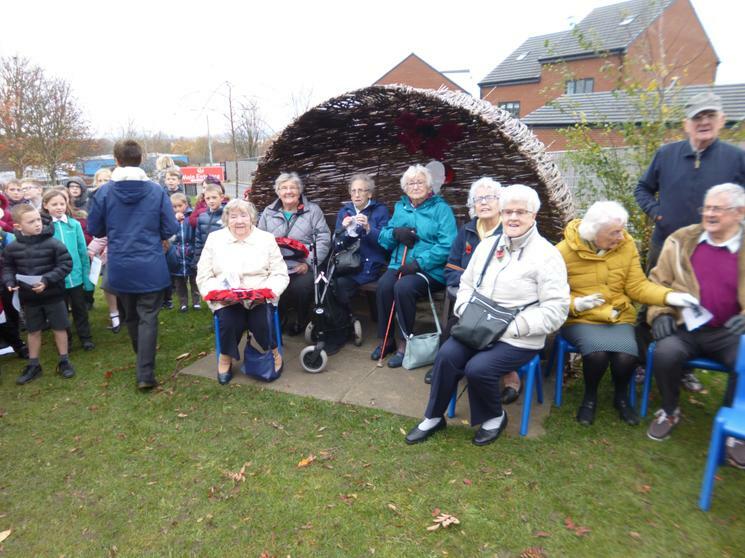 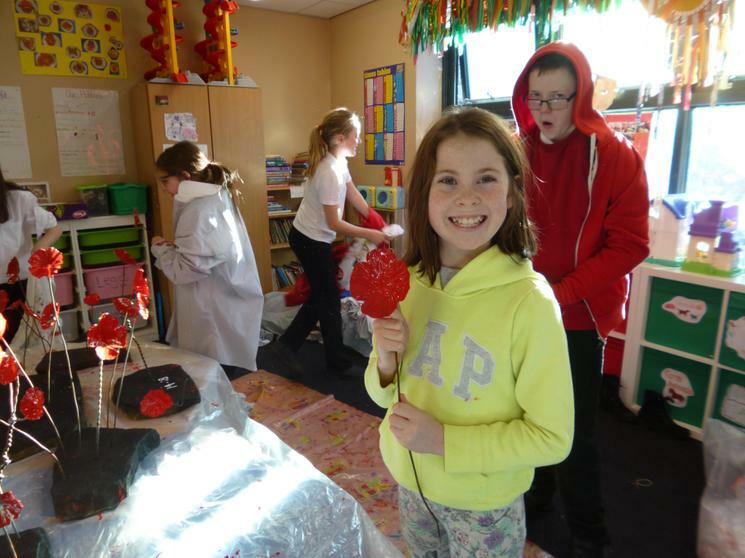 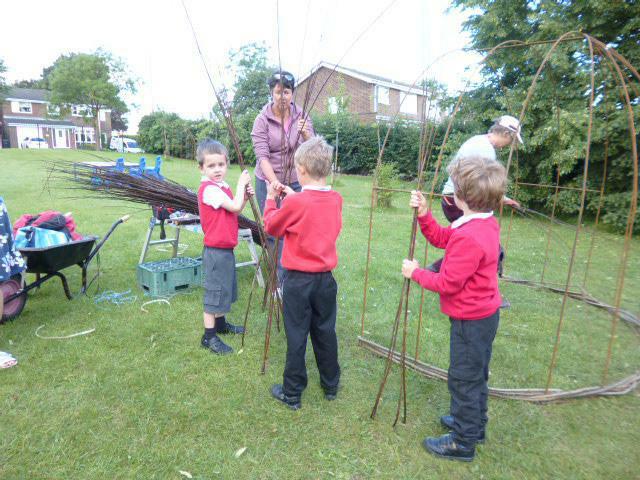 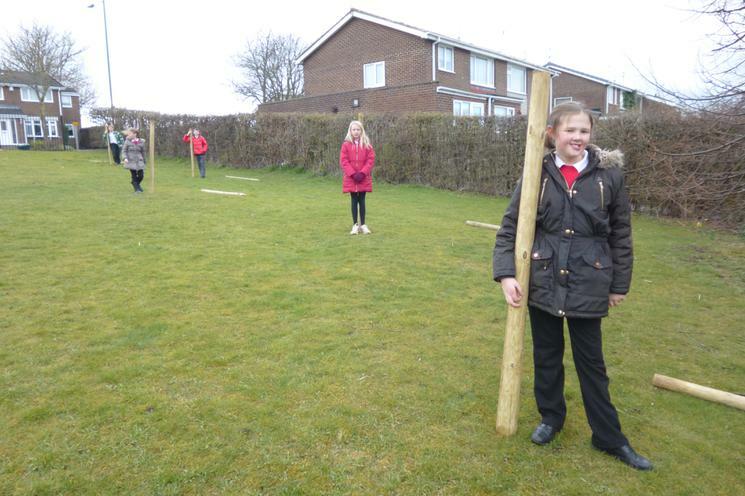 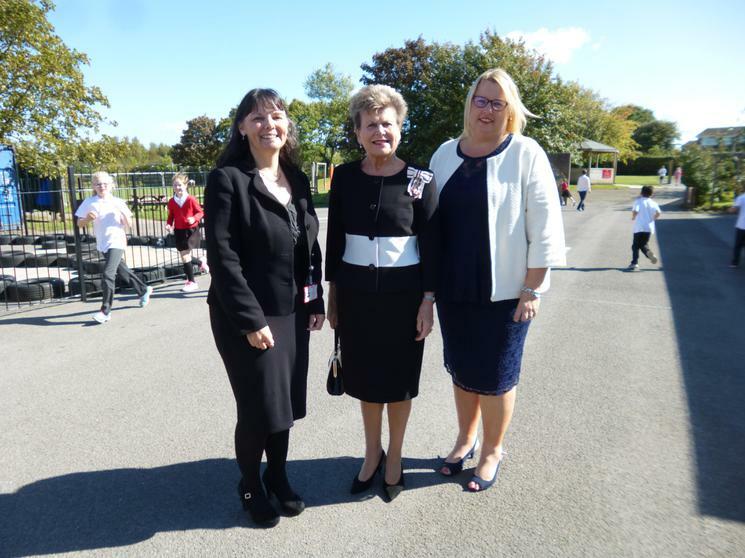 This project came about when we secured funding to develop something that could be enjoyed by the local community and it has been in the development stages for more than 2 years, from when we first planted trees in the site. 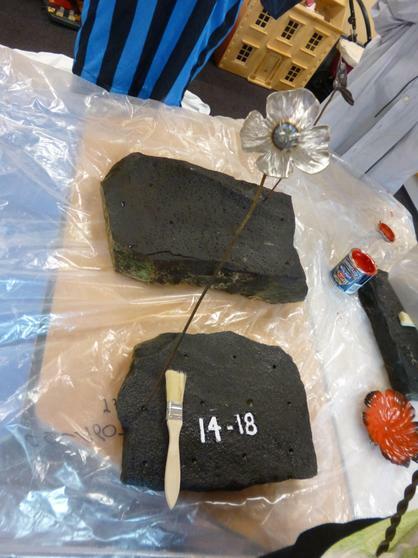 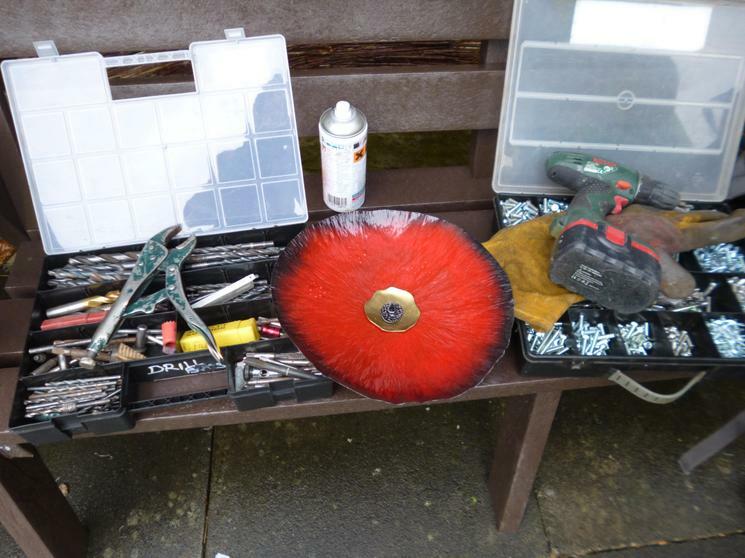 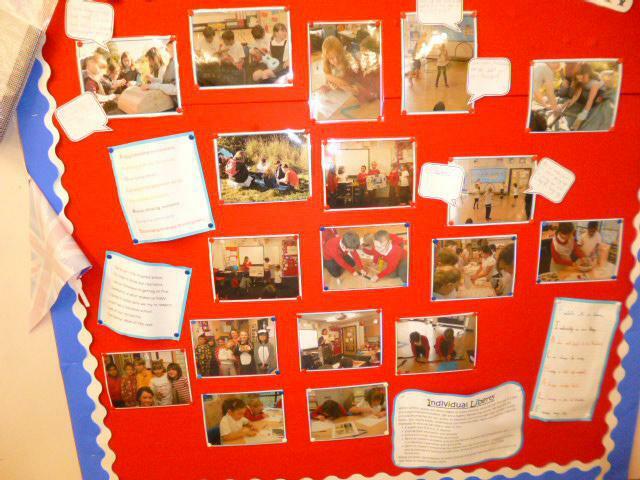 The photographs below show some of the stages we went through. 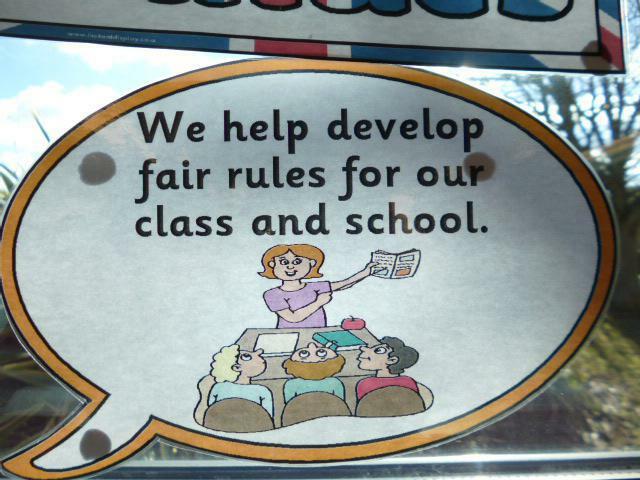 7am - 6pm during term time. 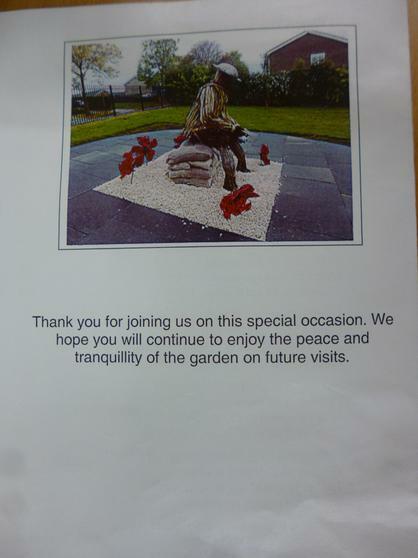 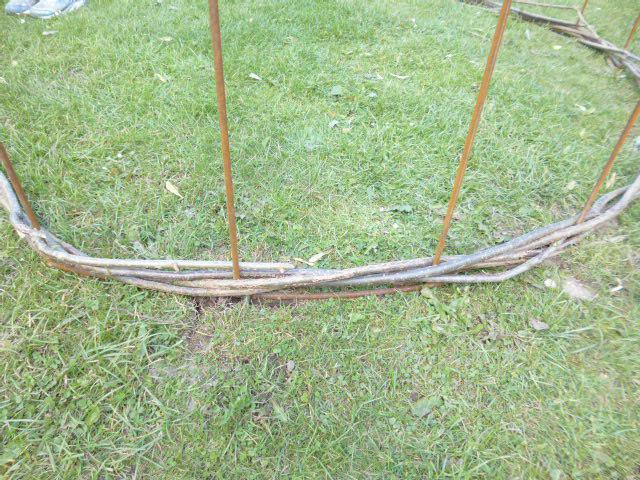 Please come and enjoy the garden. 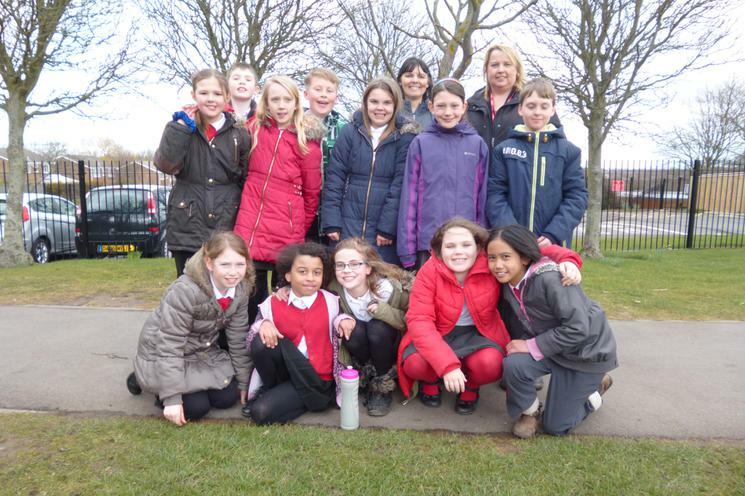 Respecting the environment and showing a sense of the wider community we live in Olivia, Preet, Evie and Fergus from Year 4 picked up and disposed of all of the litter at the entrance to school. 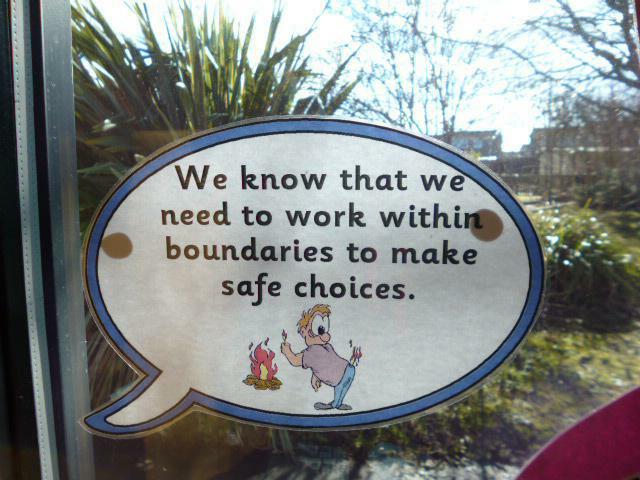 They then continued around the bus stop and fence bordering Canterbury Road. 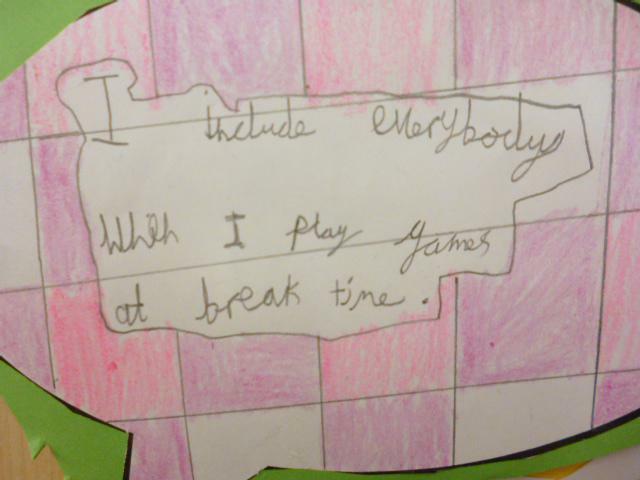 Well done and many thanks for giving up your precious break times, it was vey kind of you! 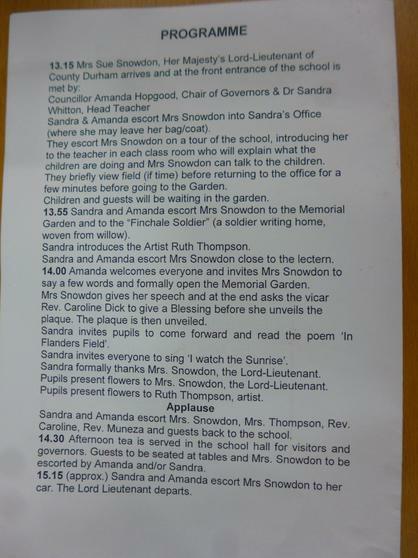 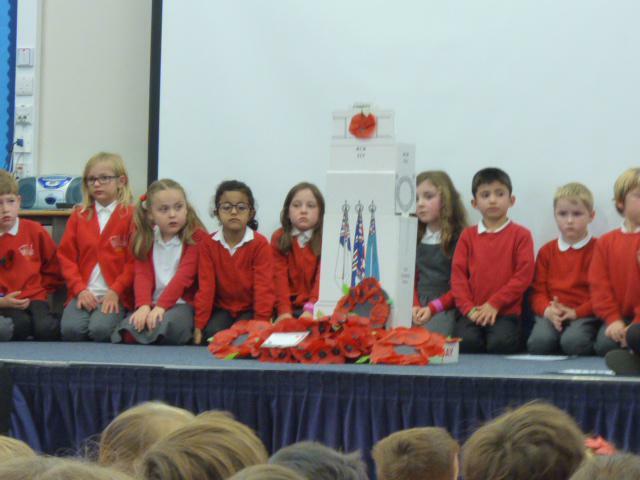 Many thanks to all who made our Service of Remembrance such a special occasion. 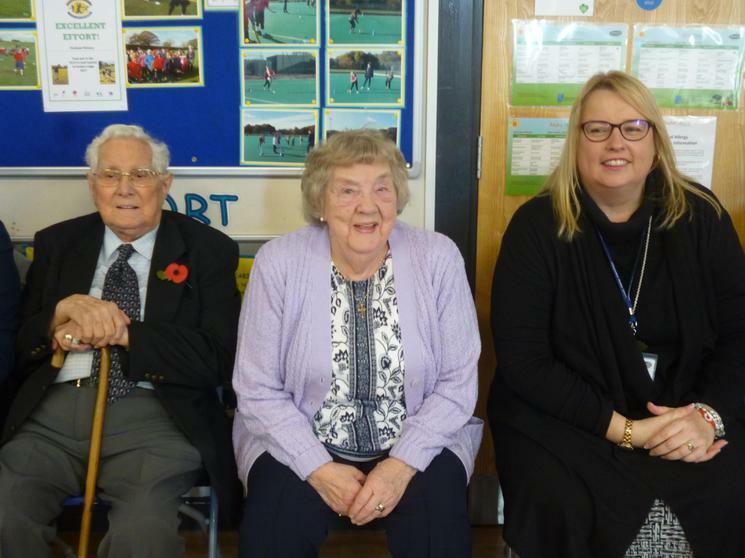 I mention particularly the veterans: Jean, Harry, Mabel, Jim, Anne, Malcolm, Renee, Thelma and Audrey who joined us and shared so much knowledge and gave us a true sense of why we must continue to say our thanks to the many people who gave their lives so that we may live in the comfort and freedom we so take for granted these days. 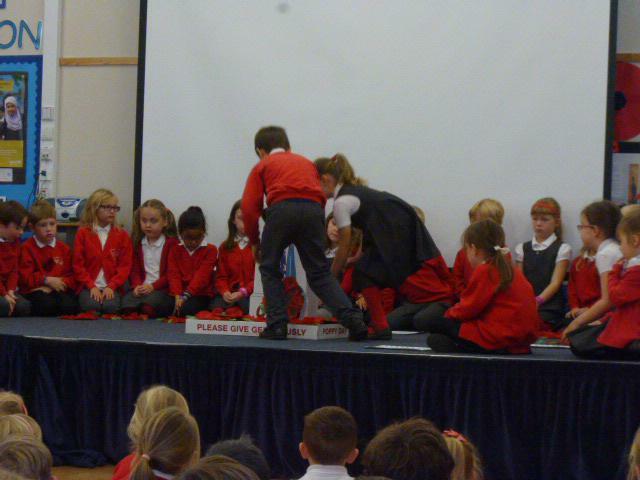 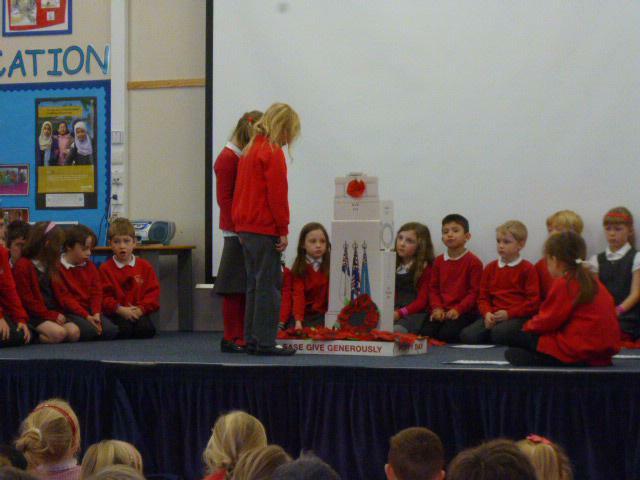 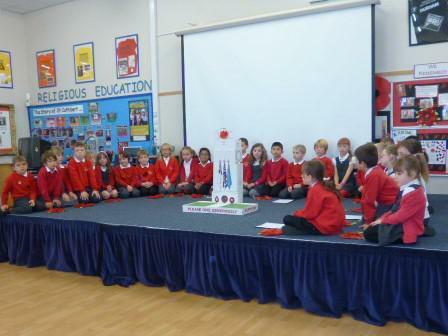 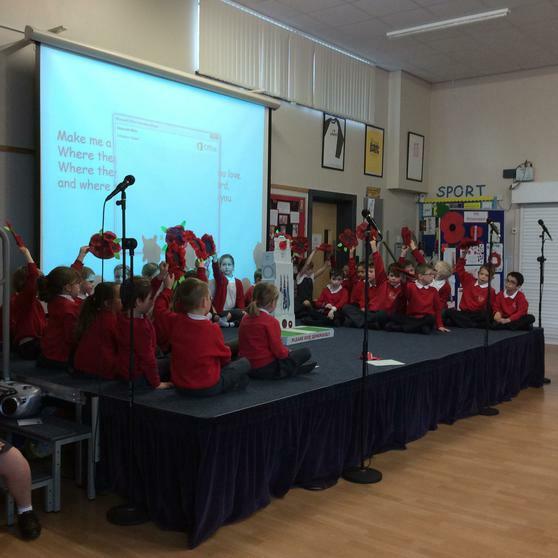 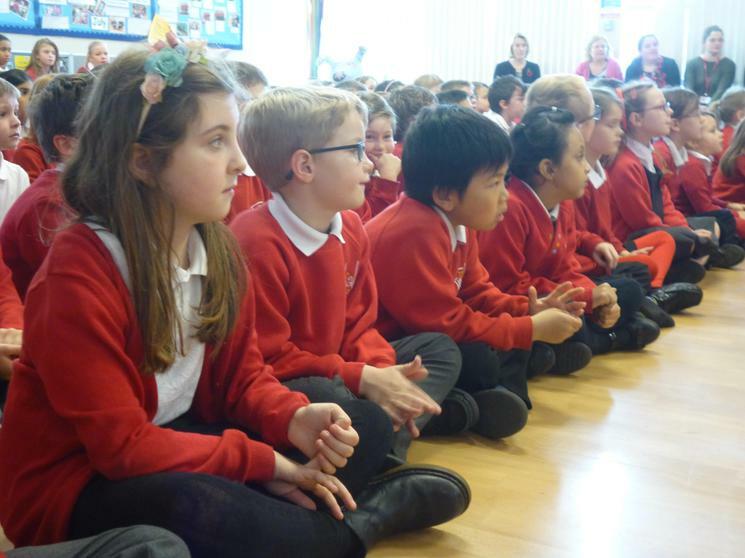 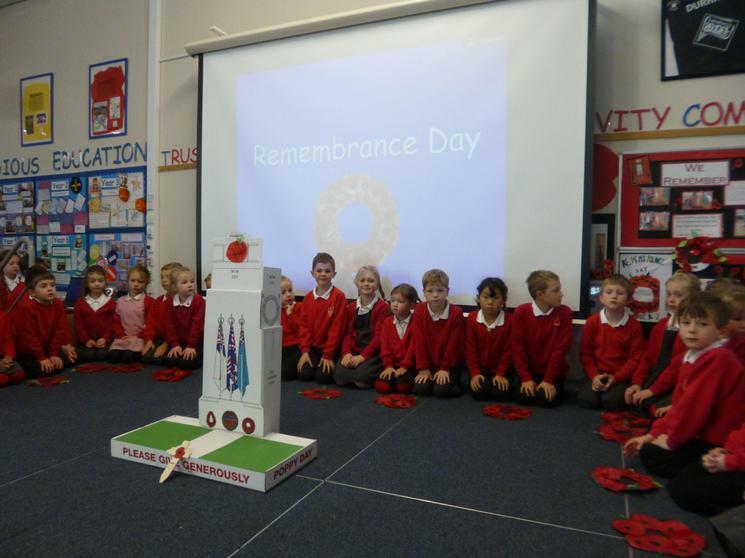 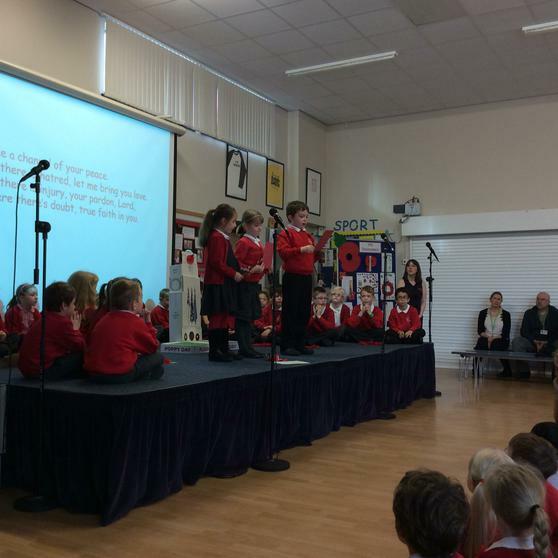 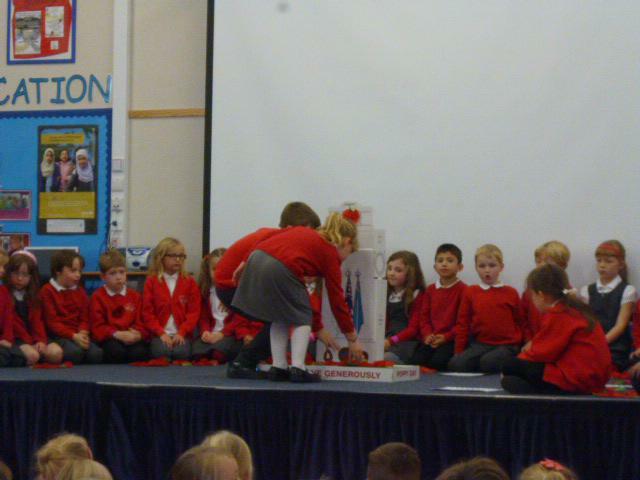 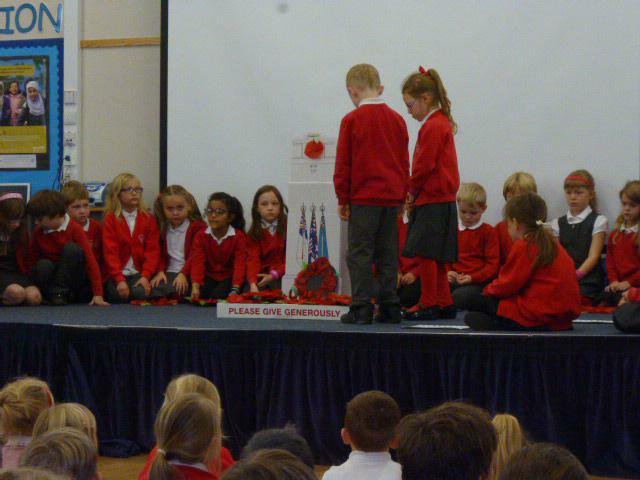 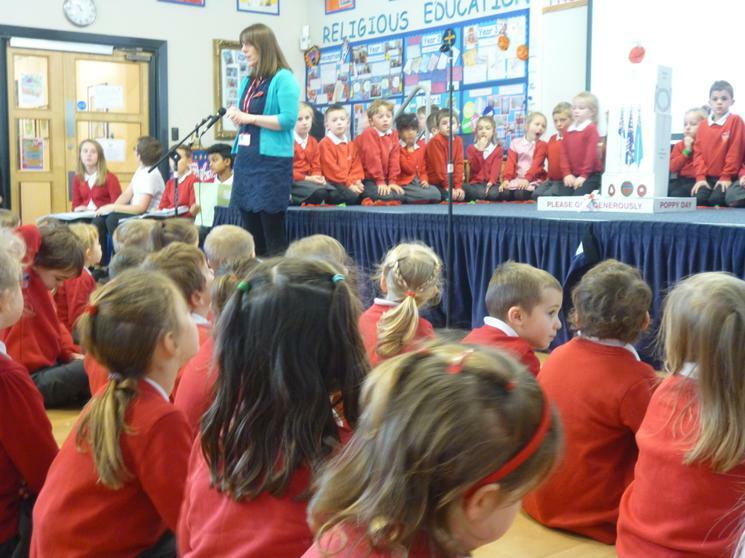 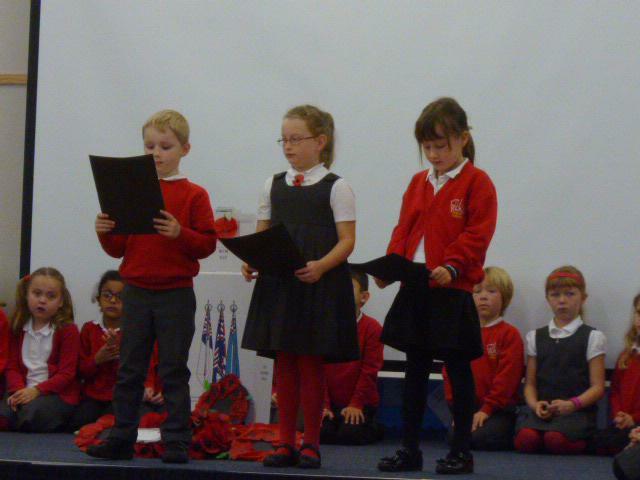 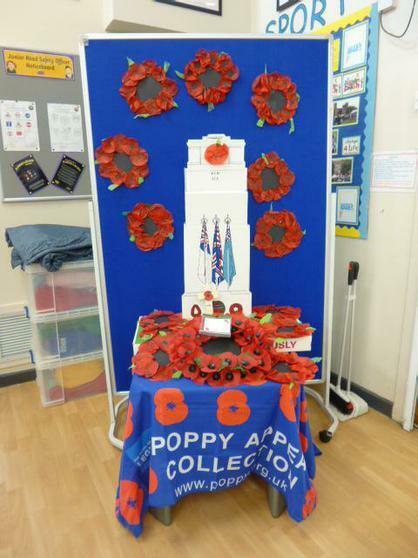 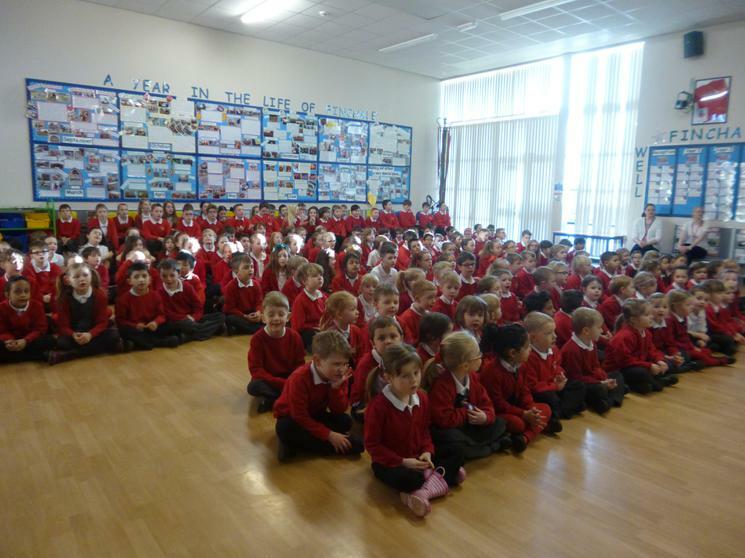 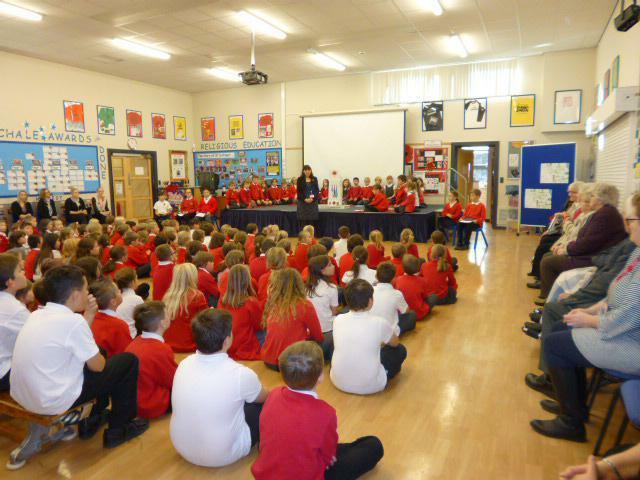 Year 2 led our assembly, supported by Year 6, they spoke so well and showed true respect when laying the poppy wreaths they made themselves. 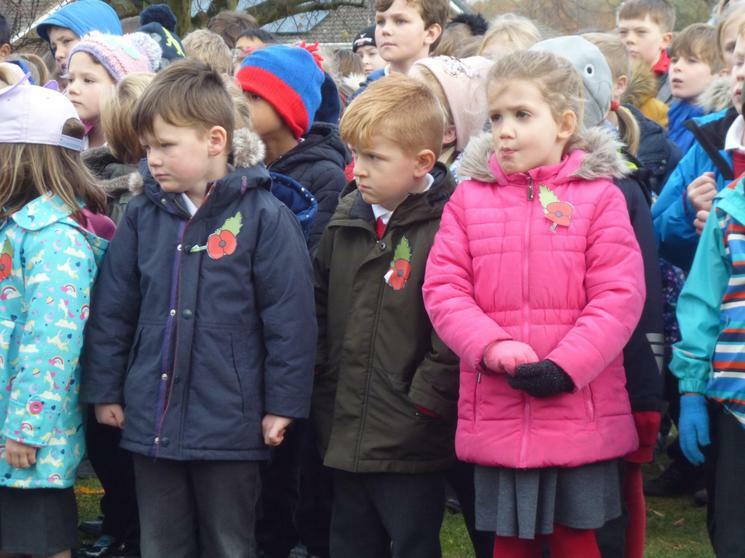 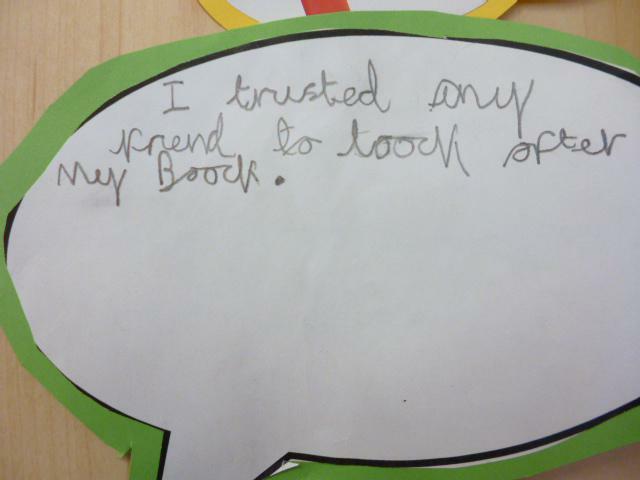 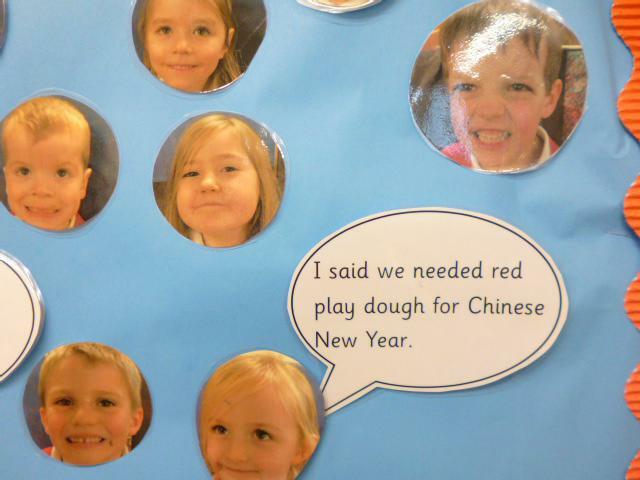 It was emotional for both children and adults. 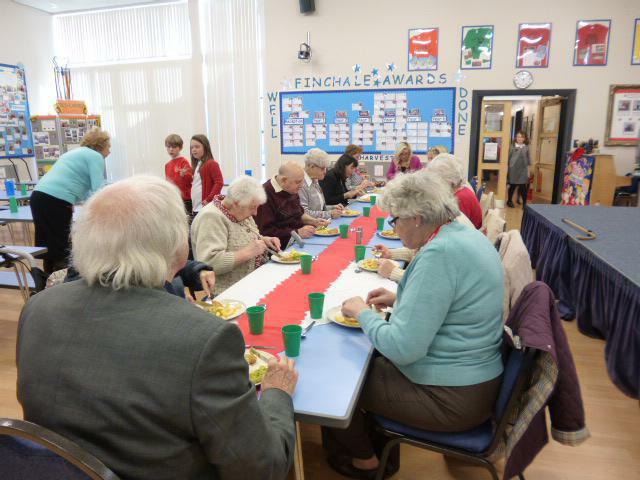 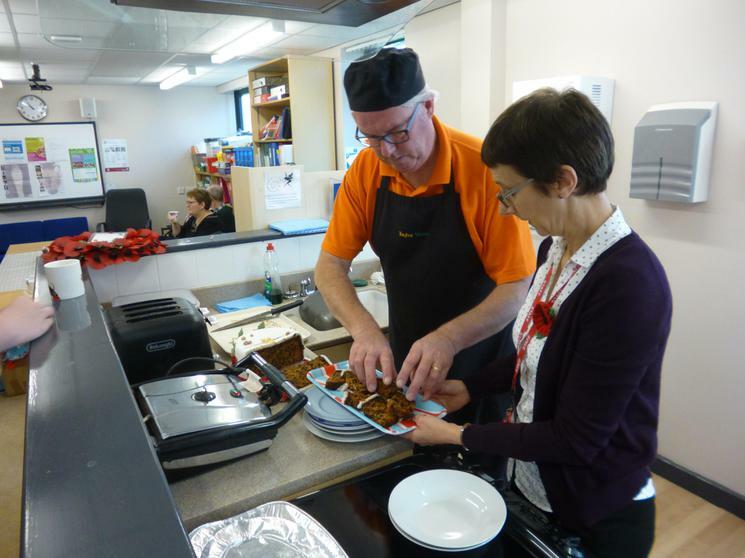 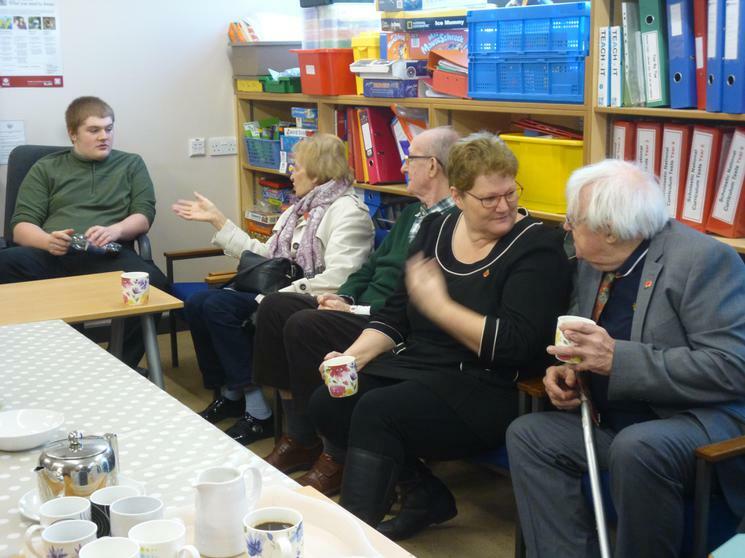 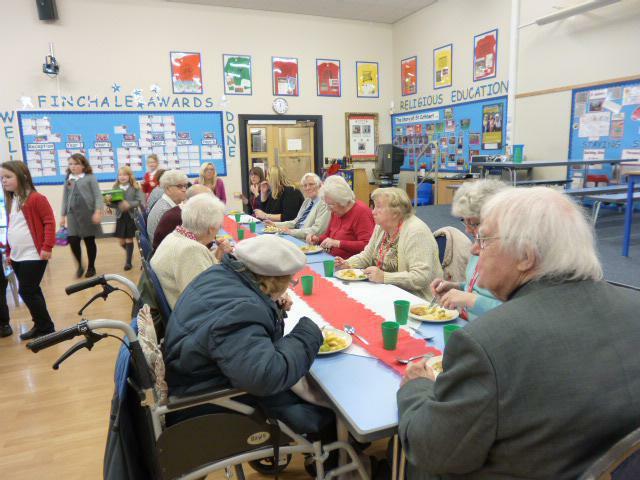 We then spent time in true conversation with the veterans who also joined us for lunch. 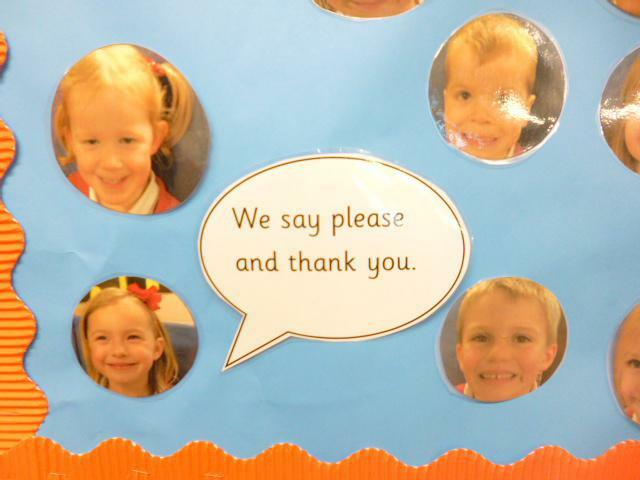 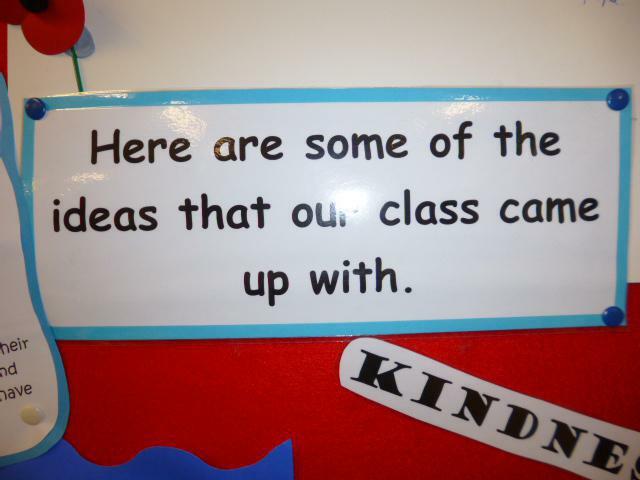 We have subscribed to a project called the BIG classroom. 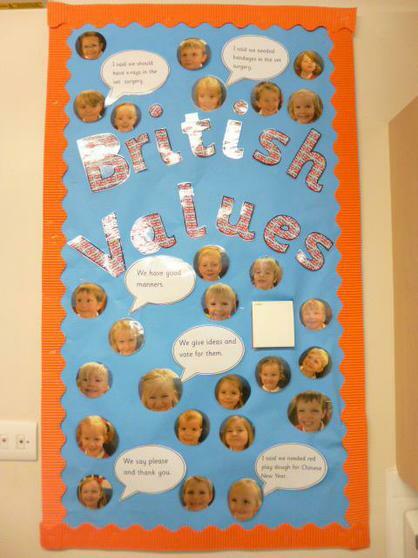 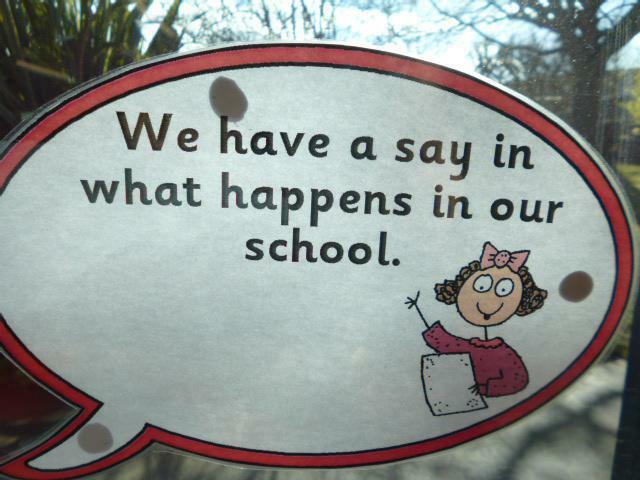 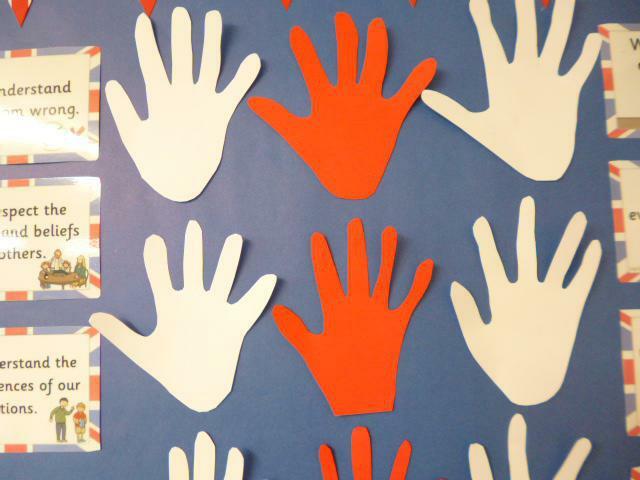 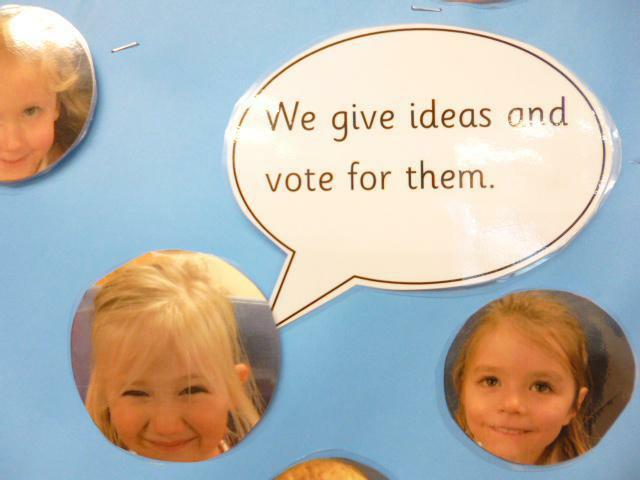 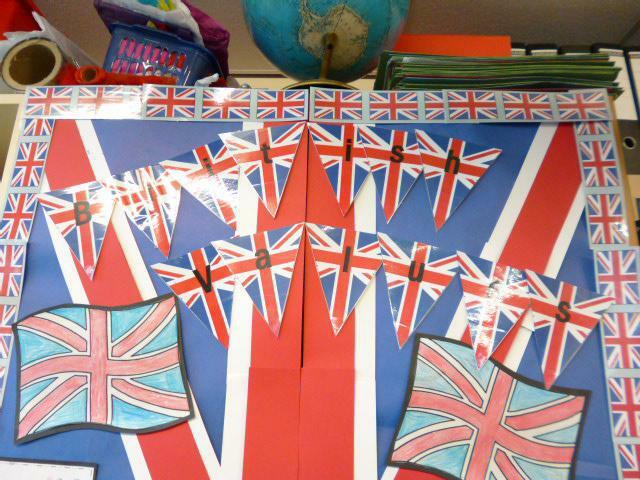 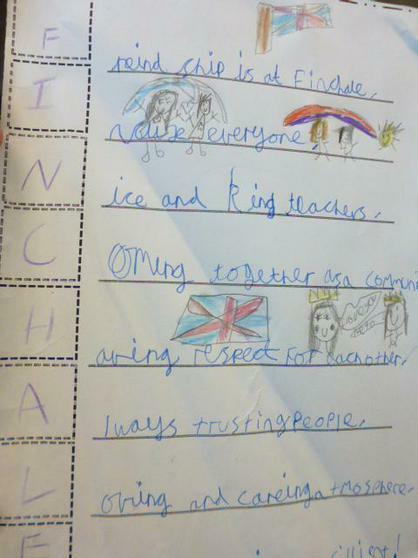 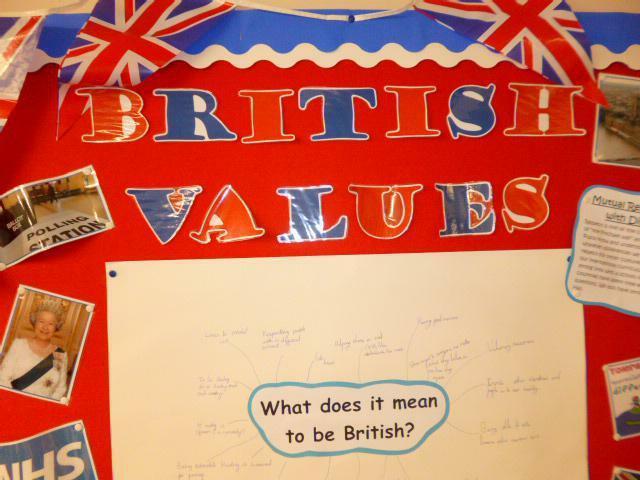 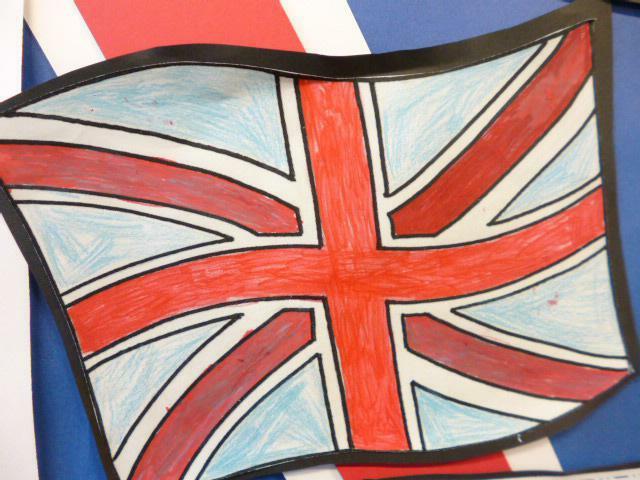 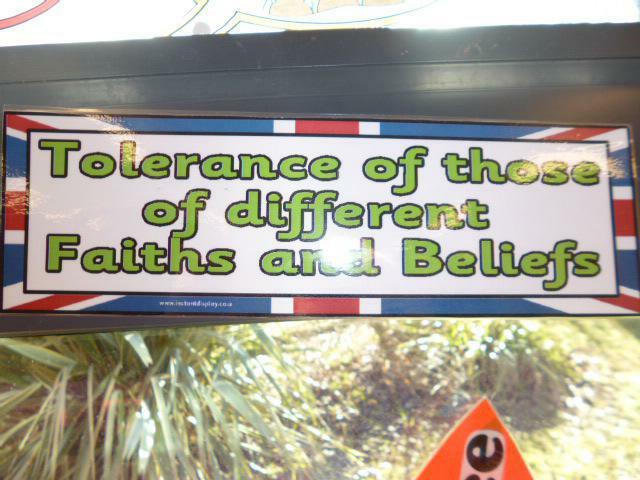 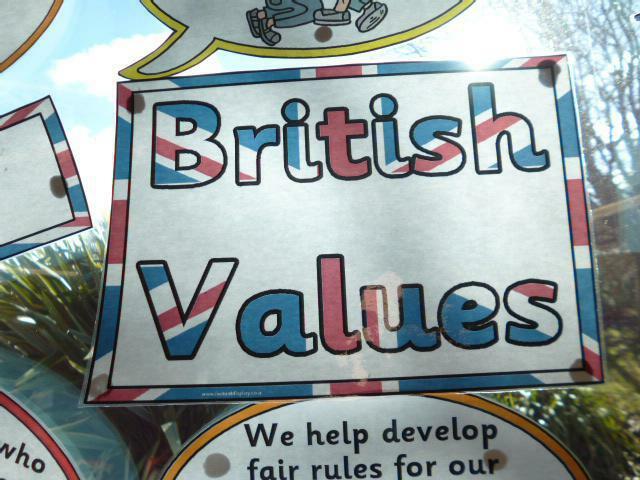 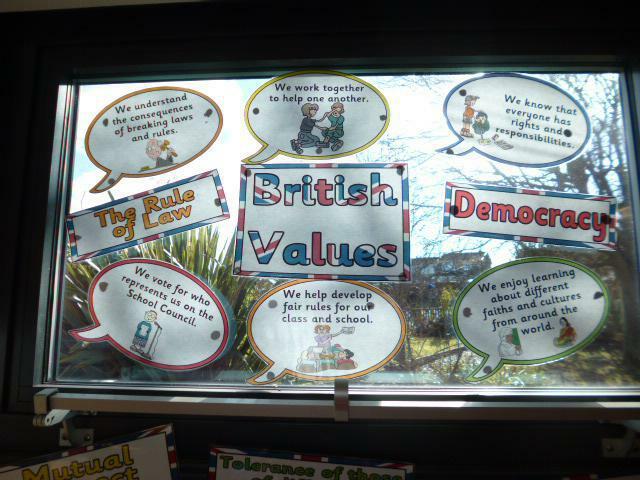 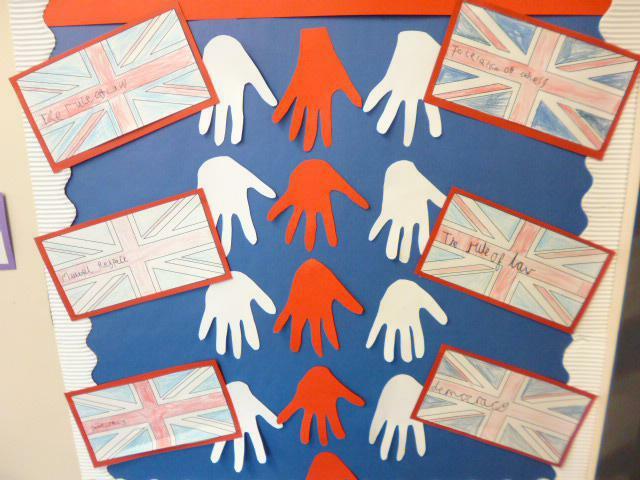 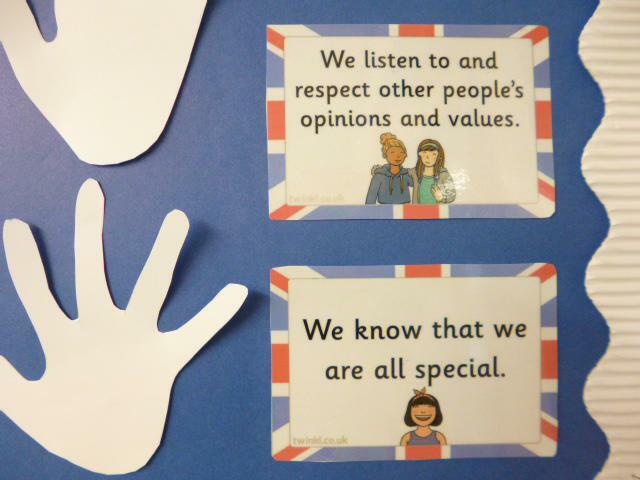 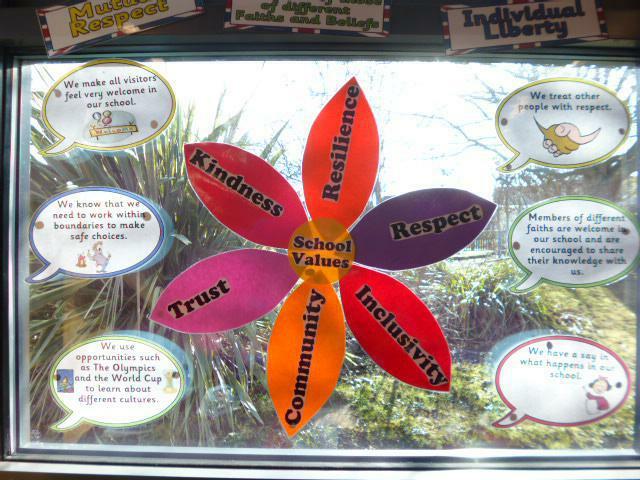 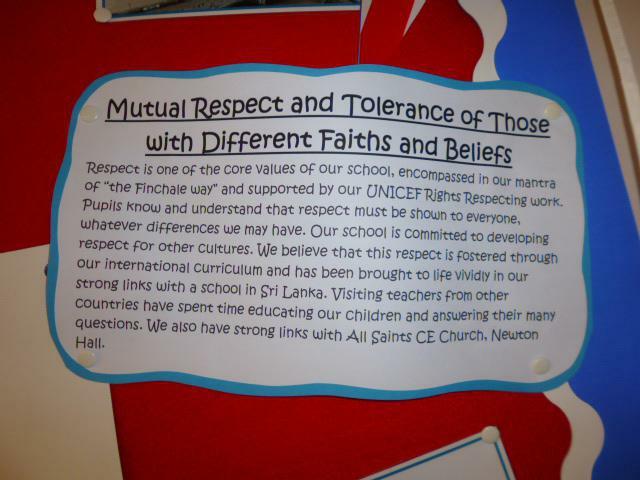 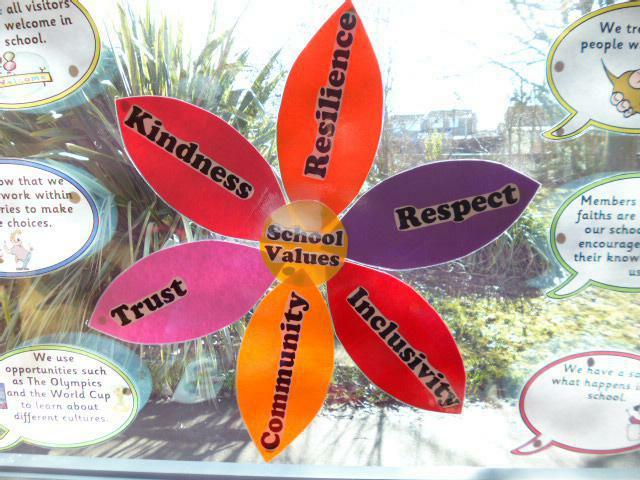 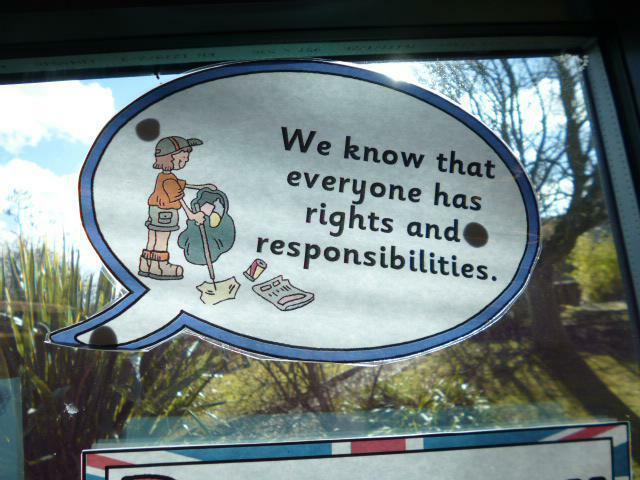 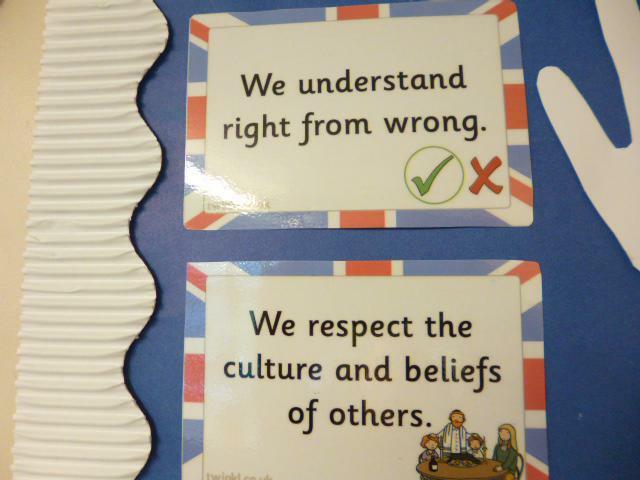 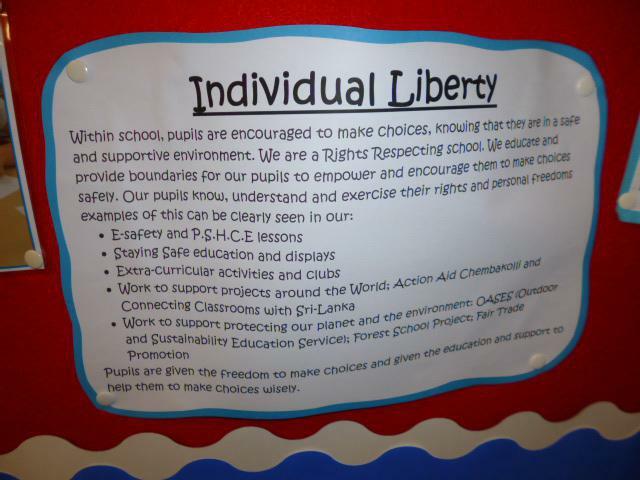 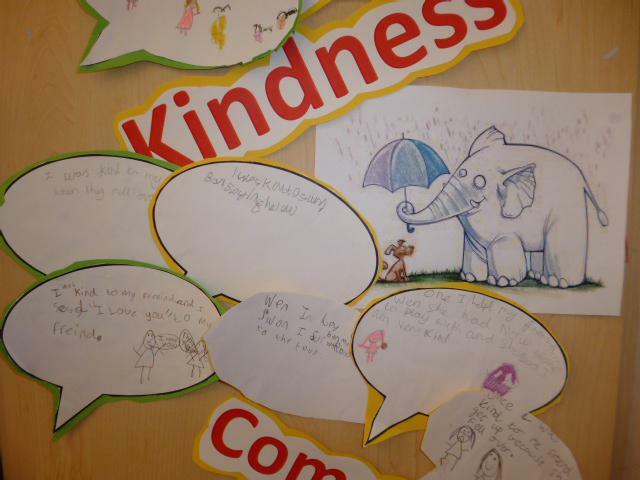 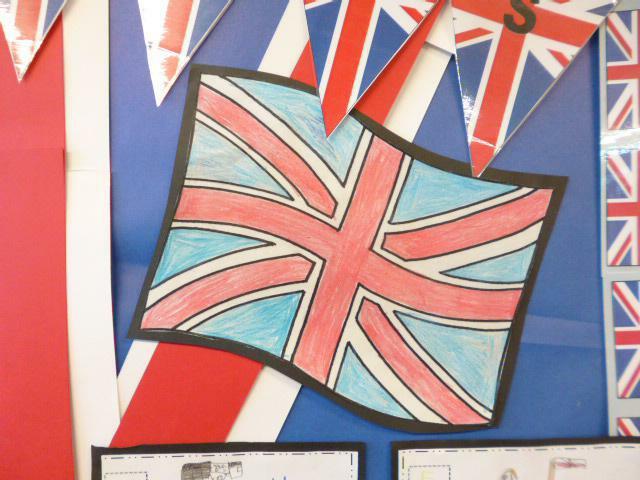 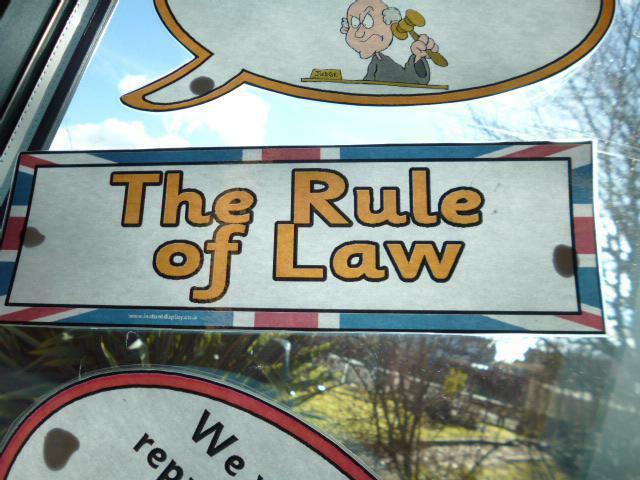 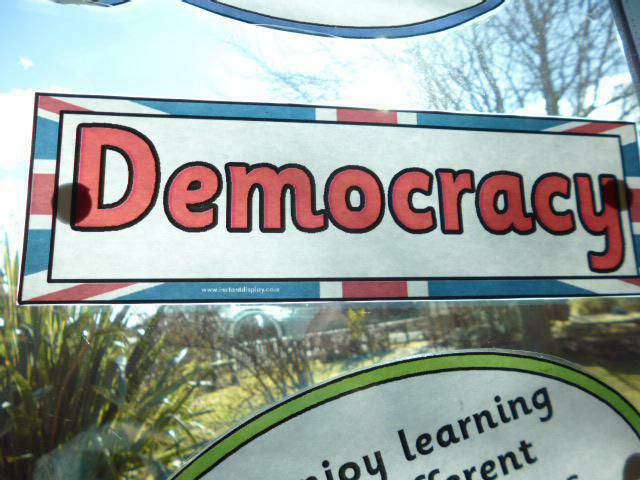 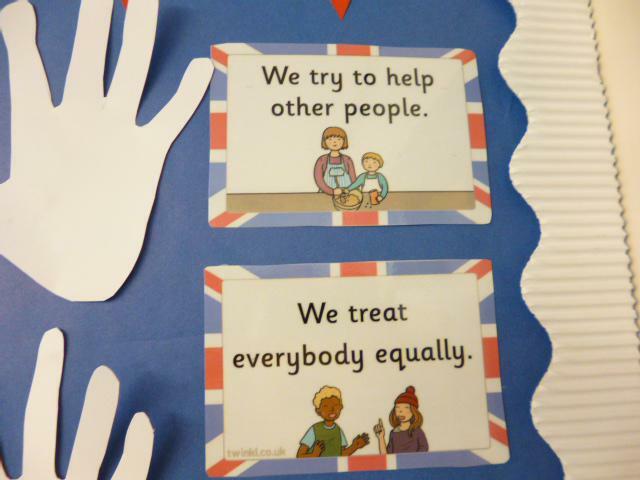 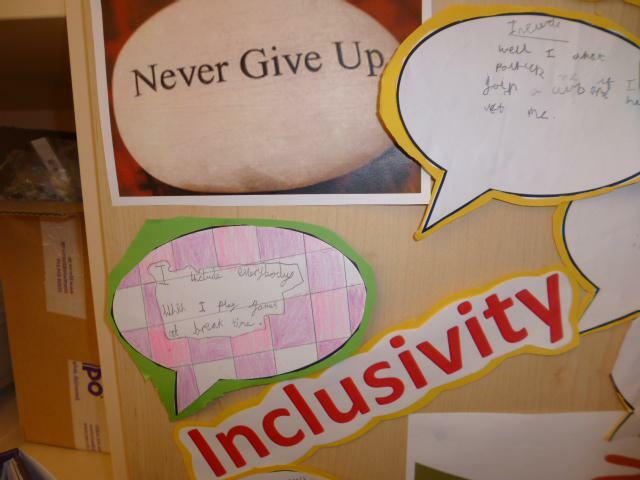 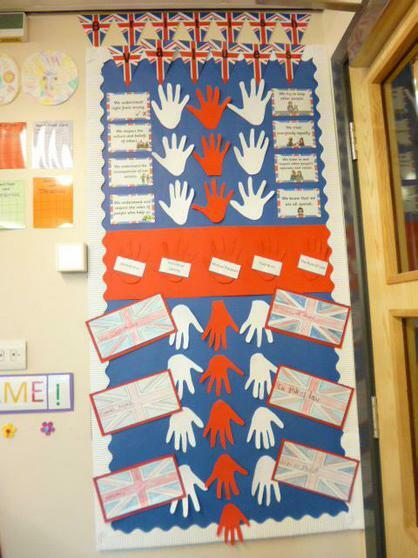 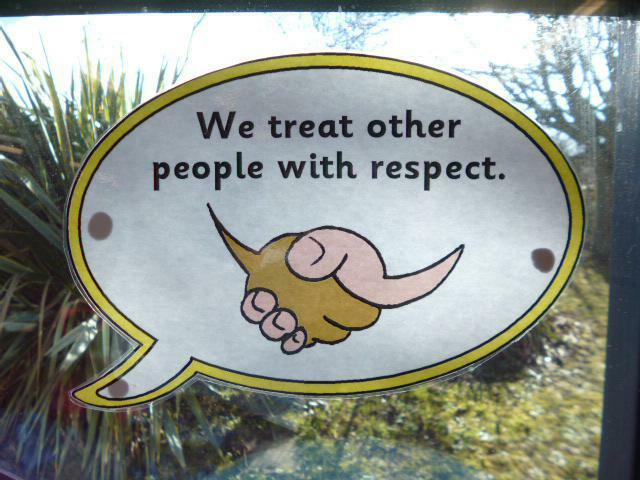 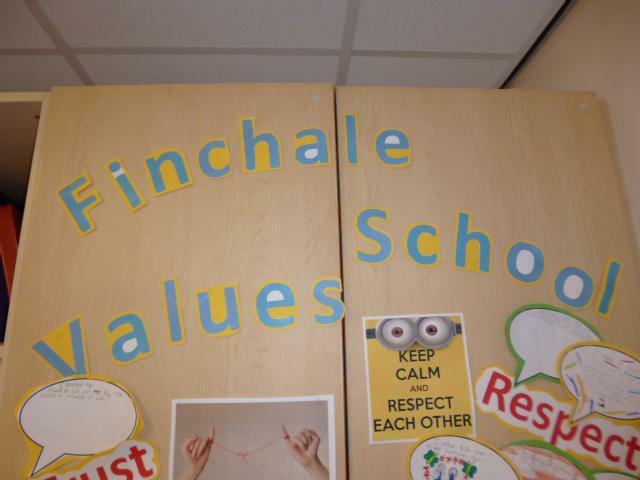 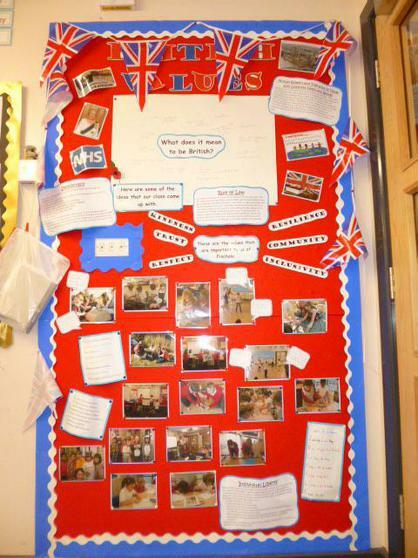 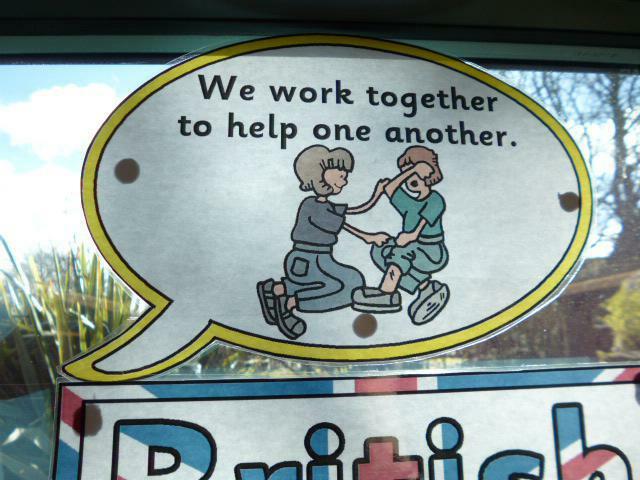 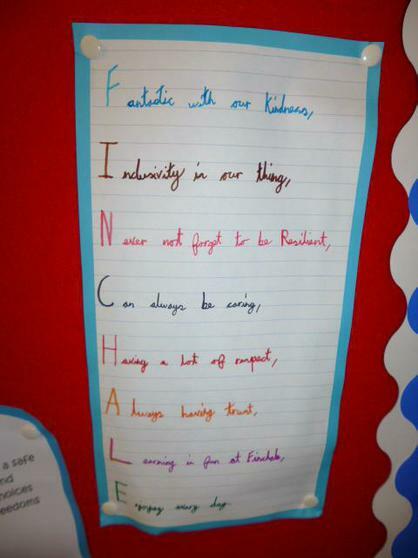 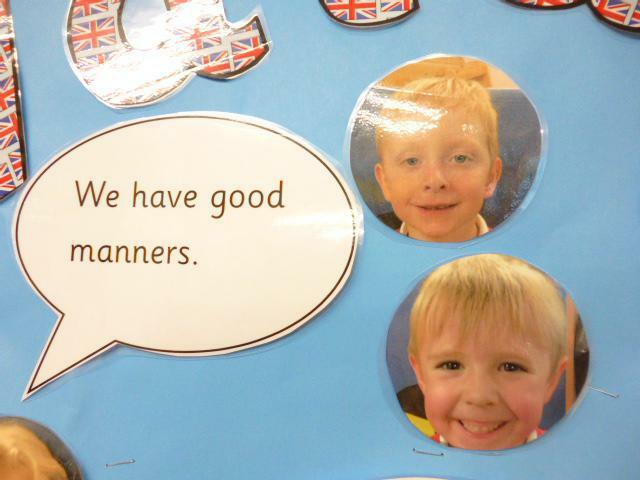 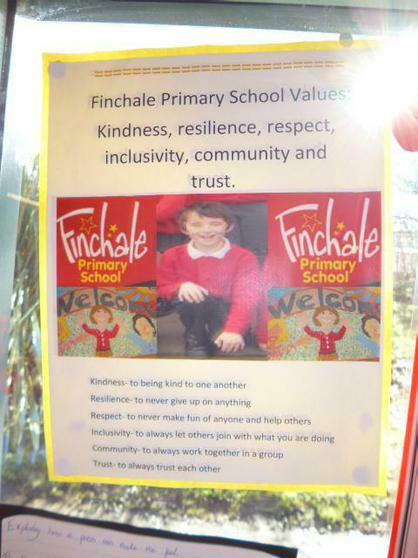 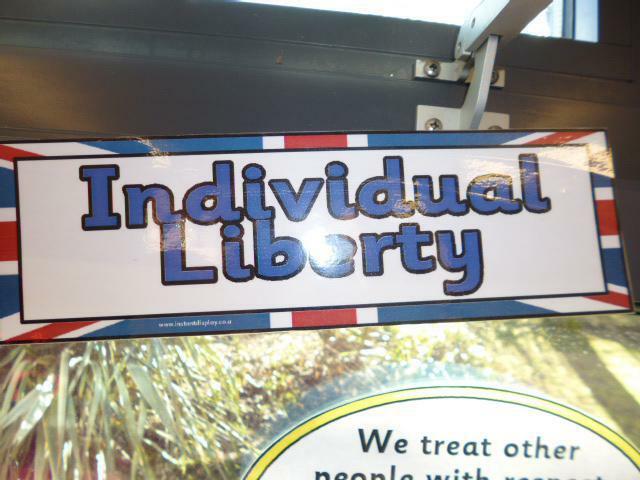 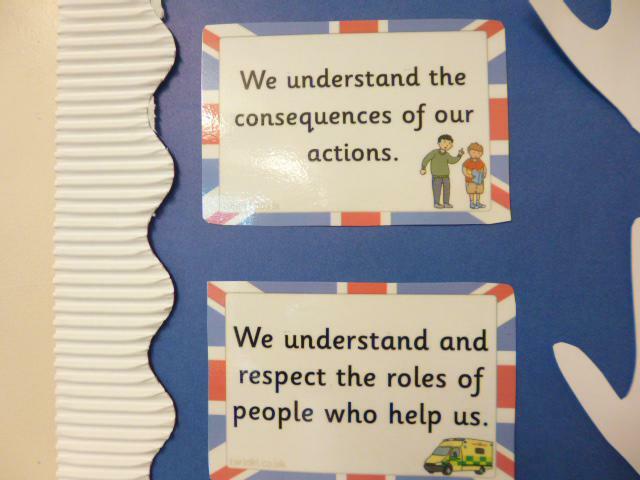 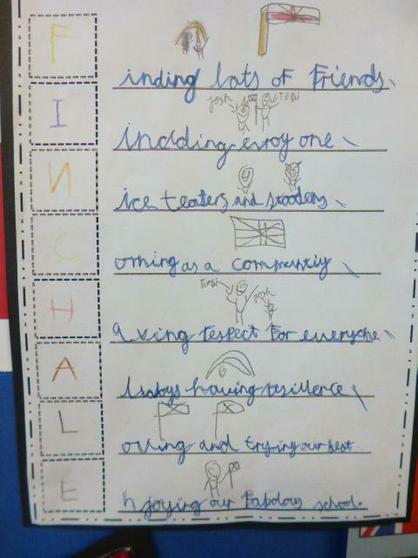 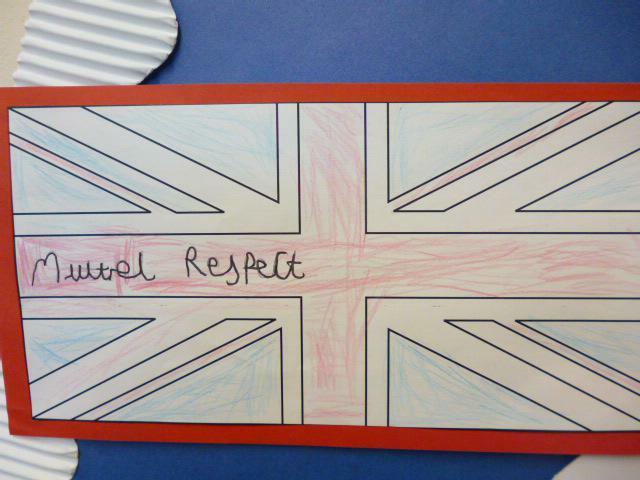 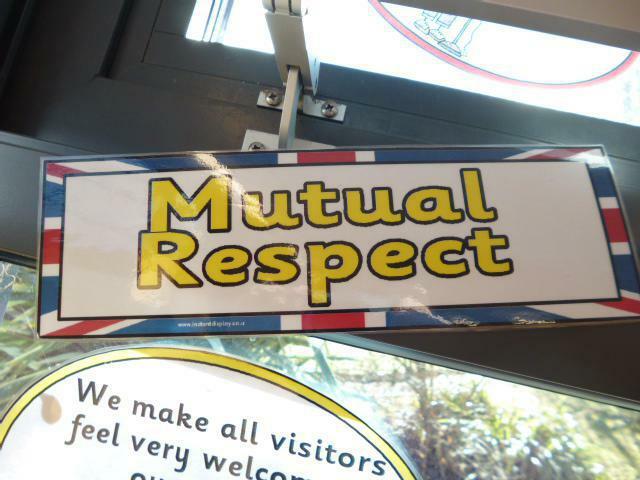 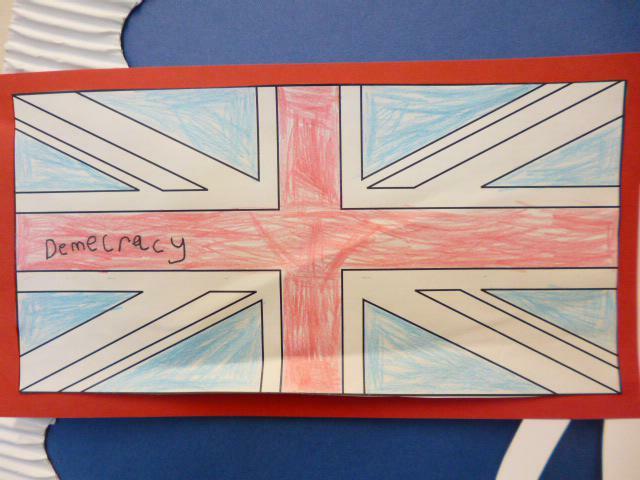 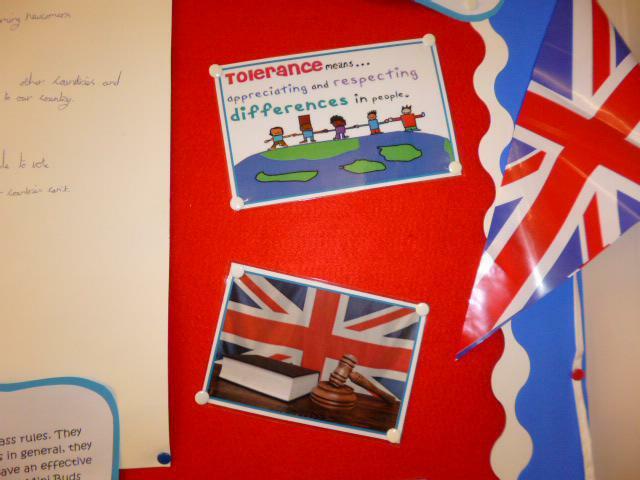 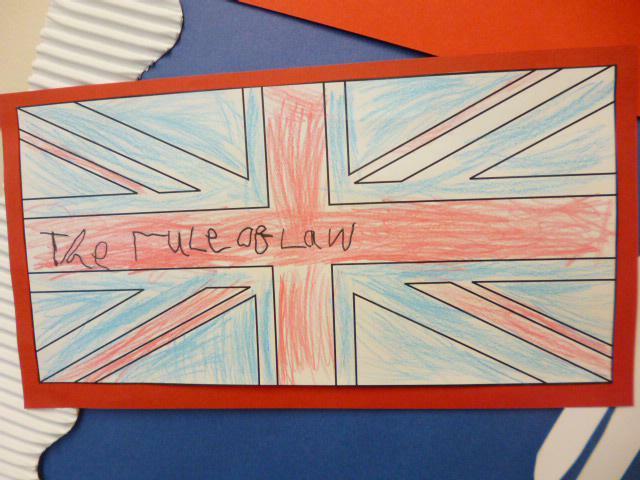 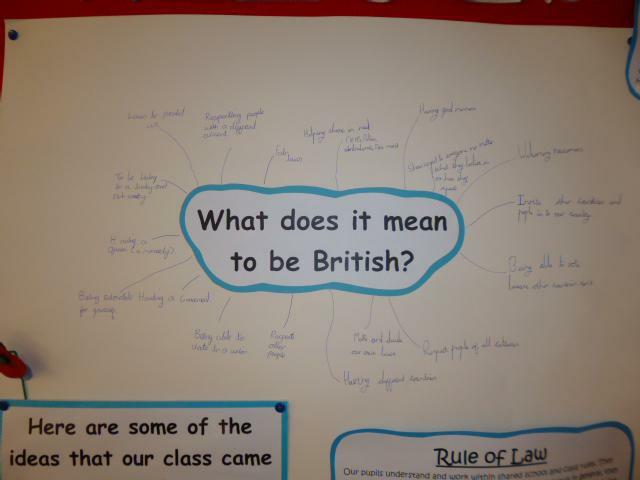 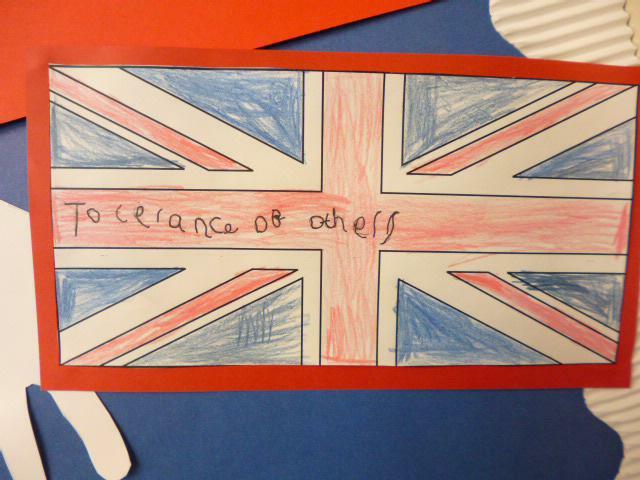 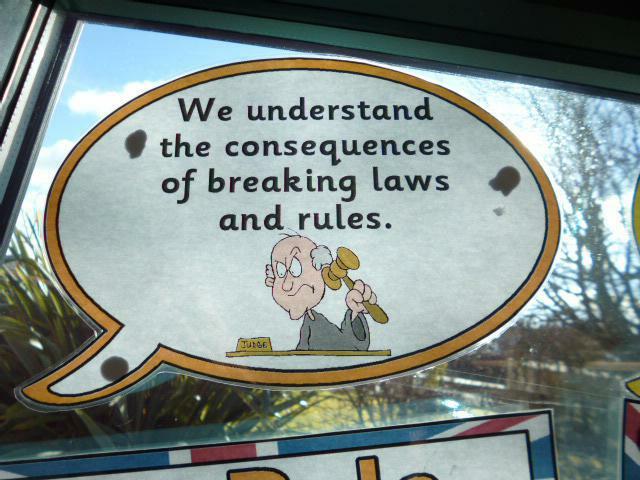 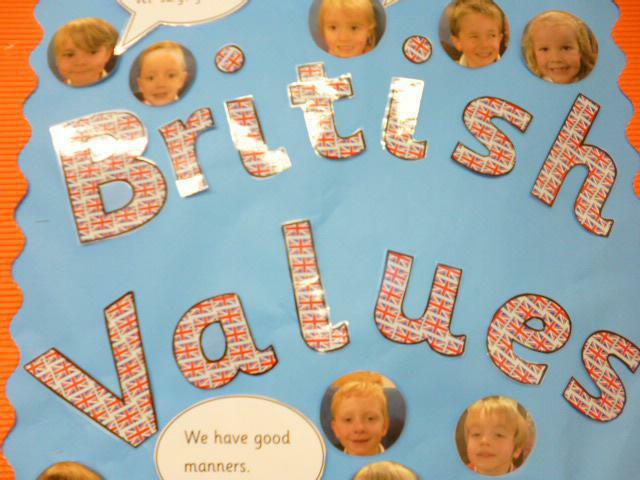 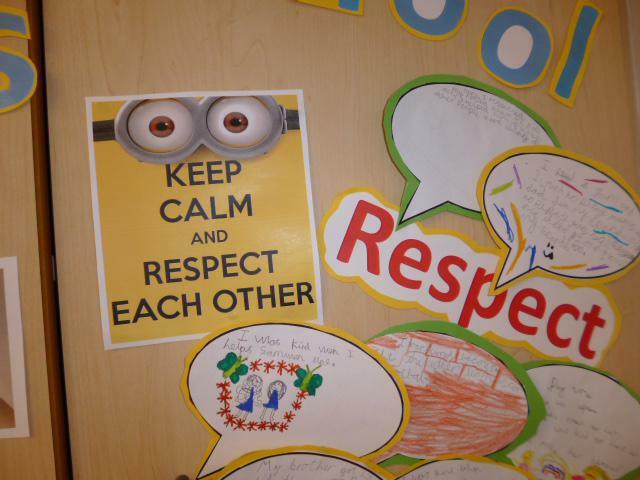 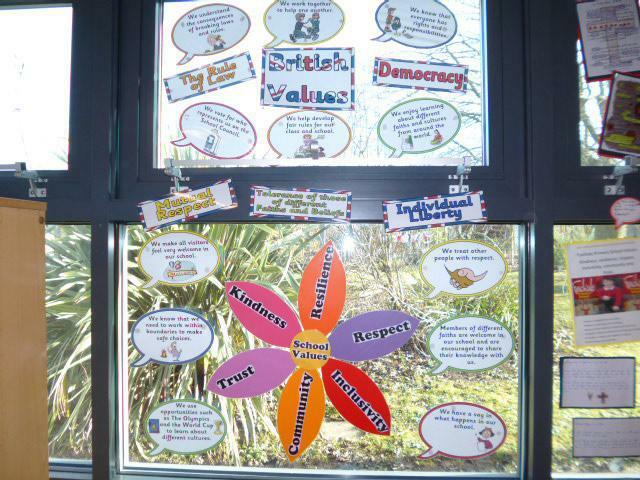 This is an on-line community of thousands of schools across the UK, who are dedicated to promoting British values by giving snapshots of their day-to-day lives. 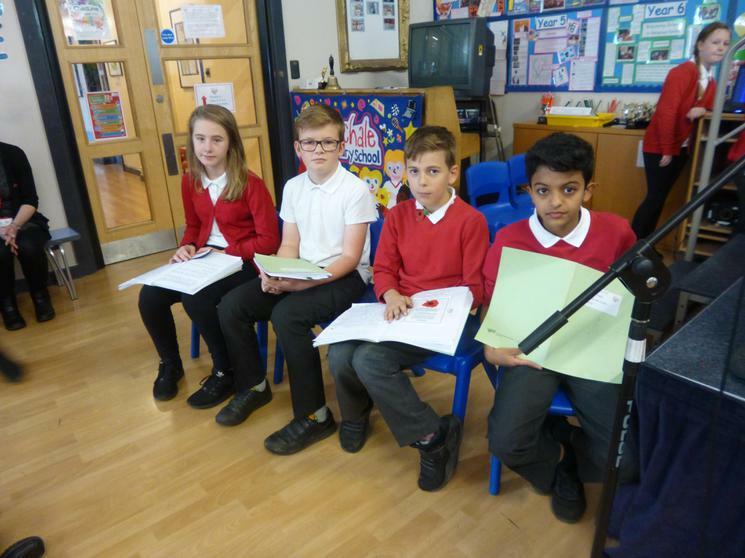 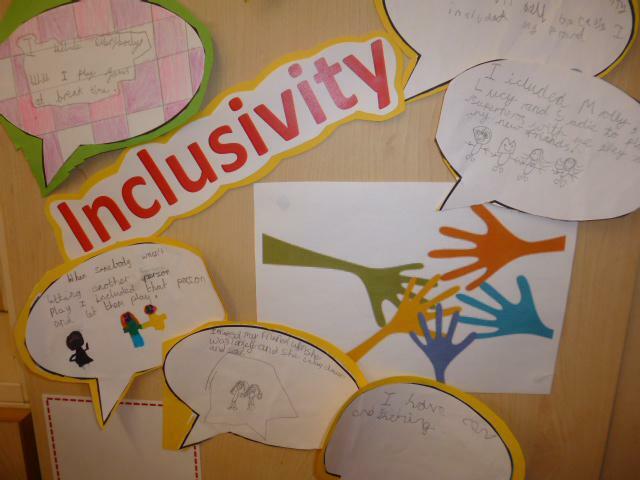 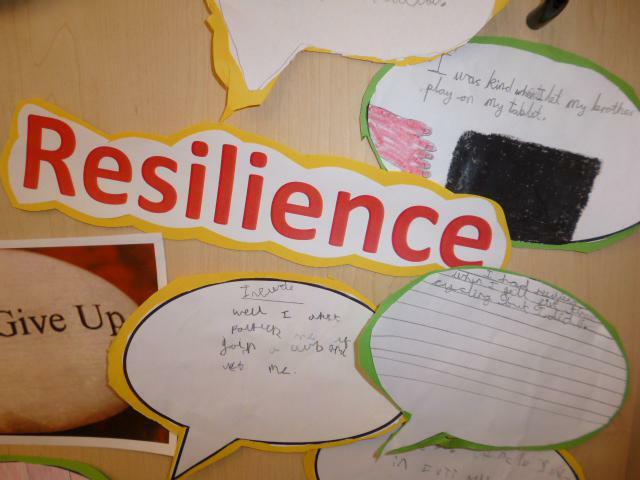 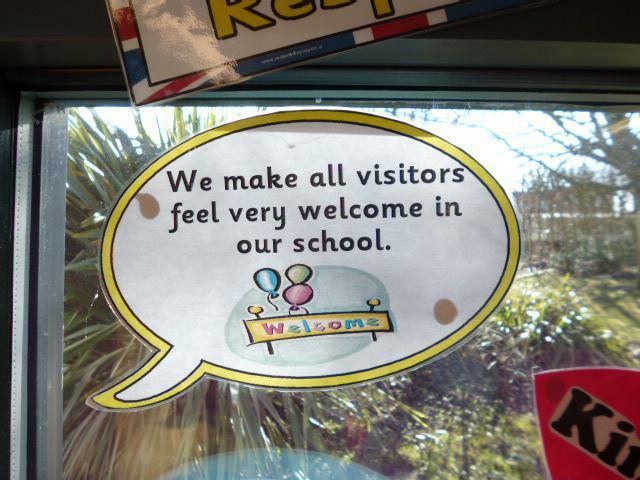 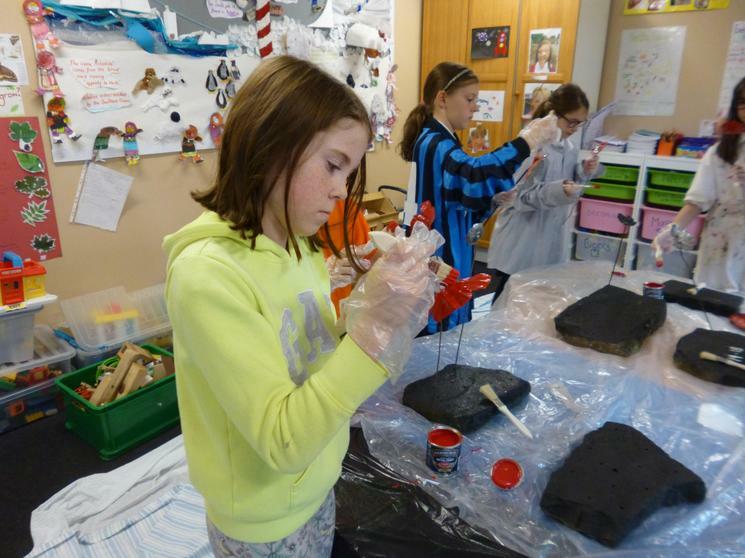 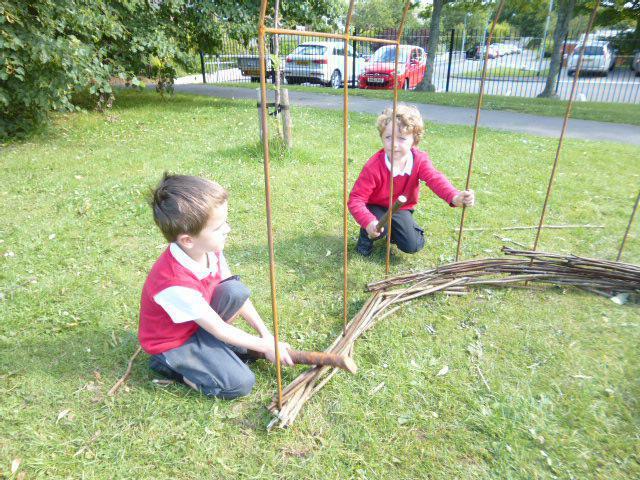 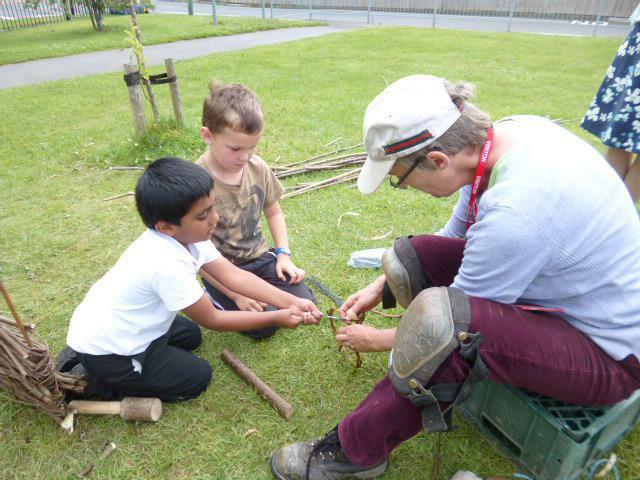 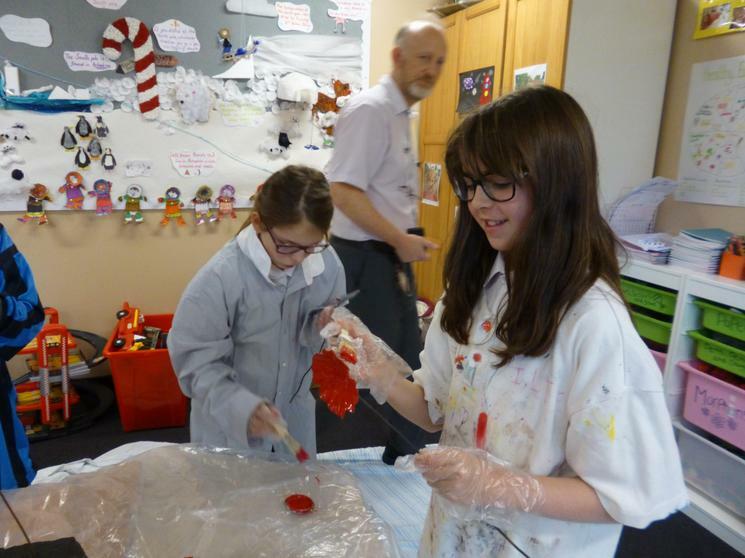 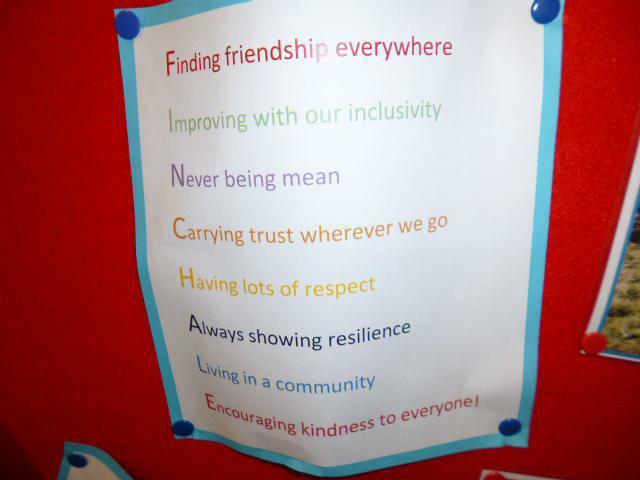 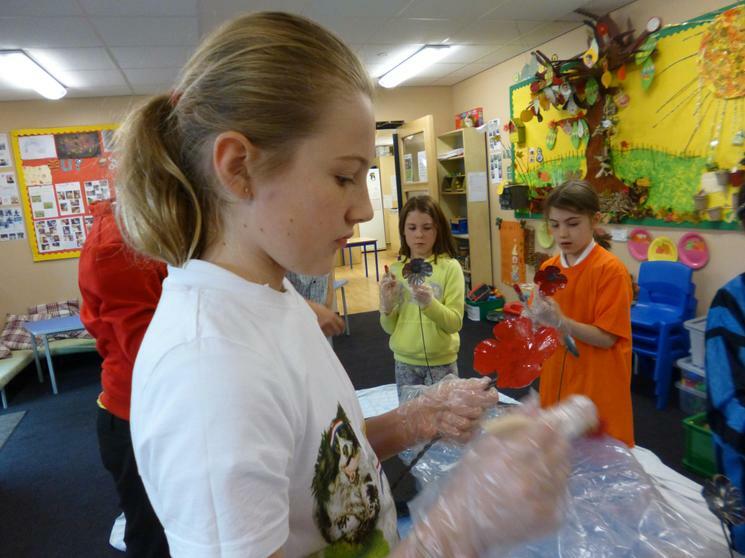 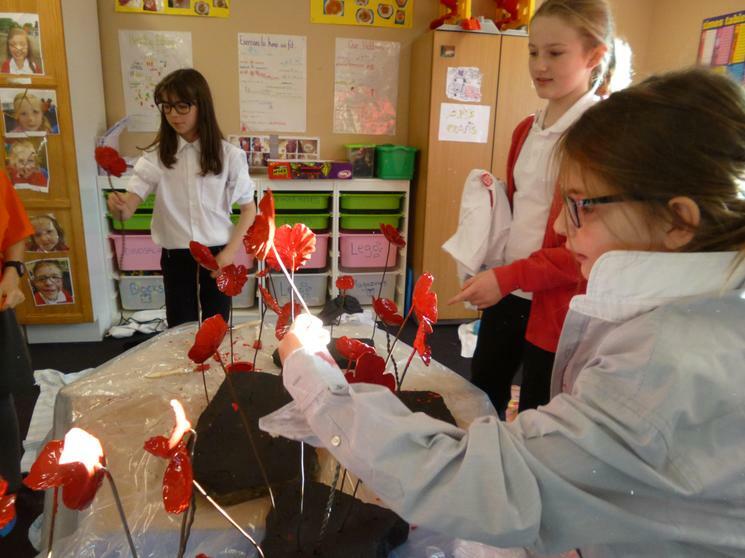 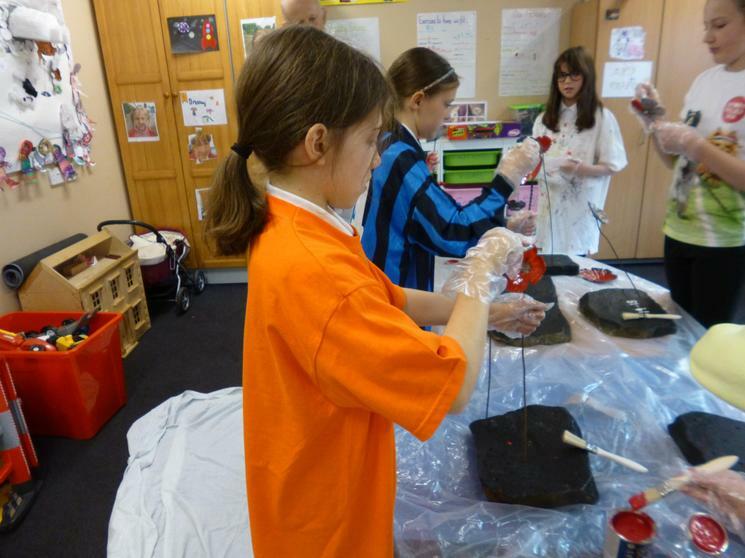 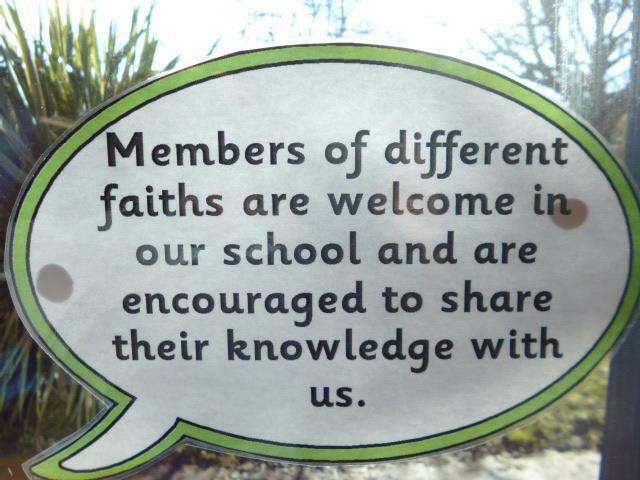 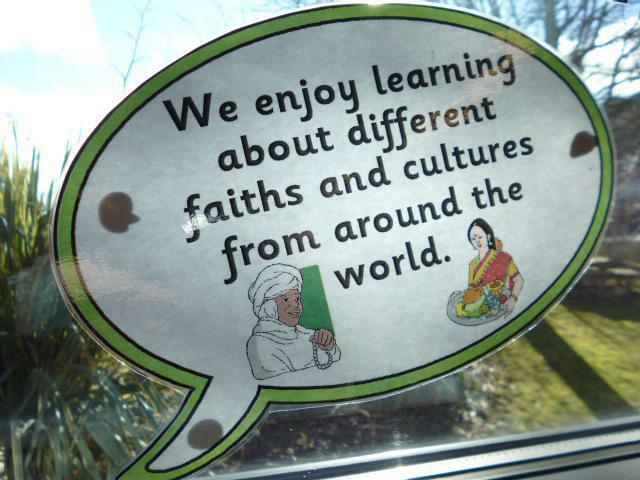 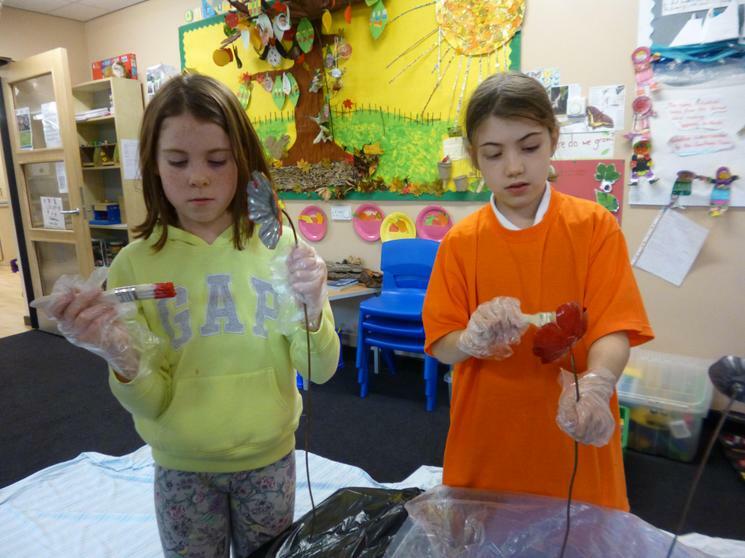 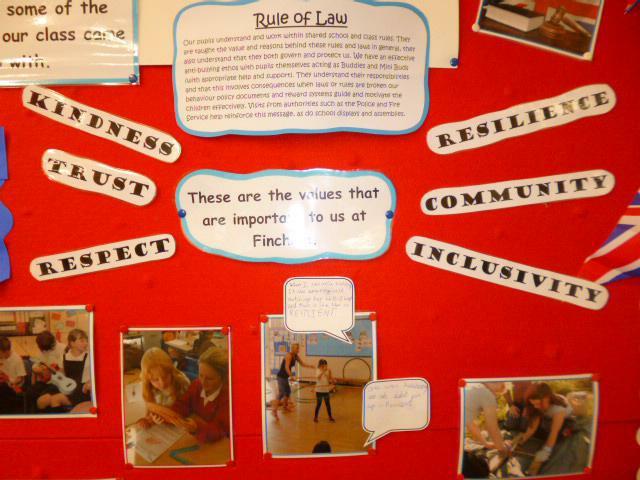 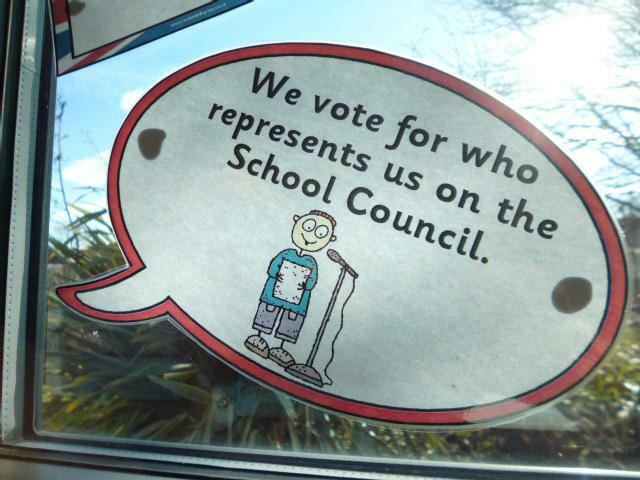 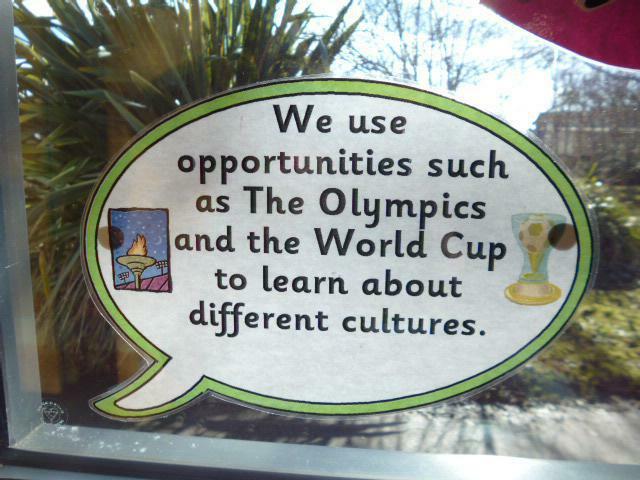 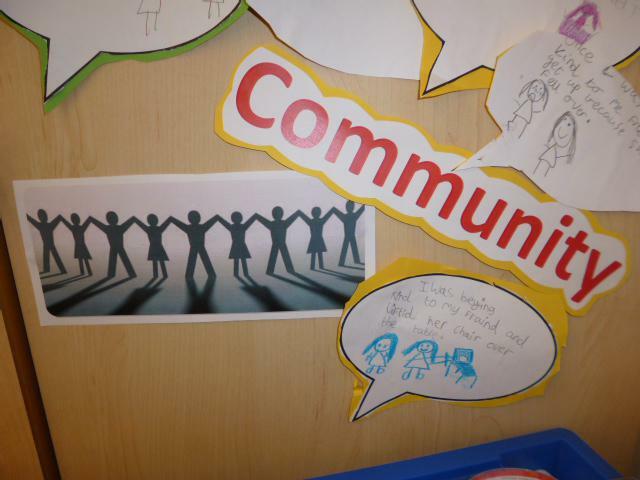 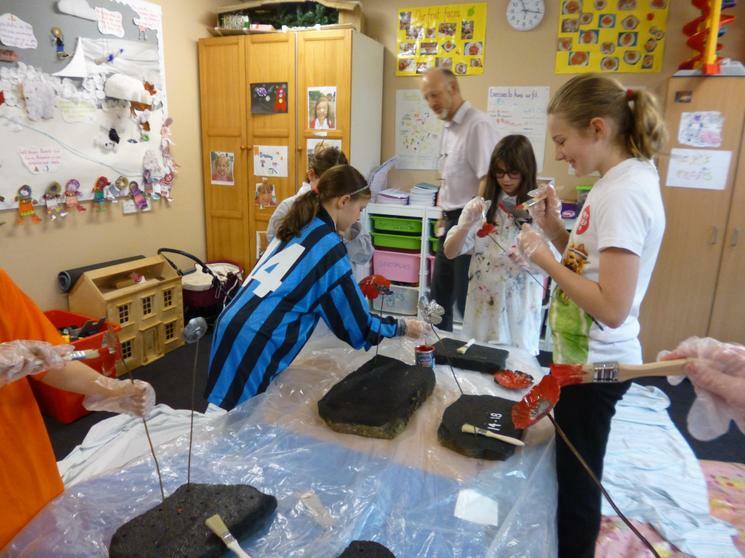 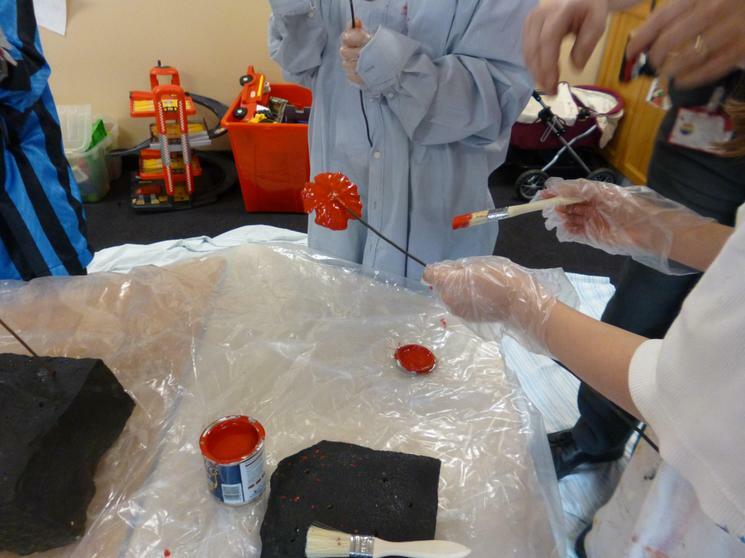 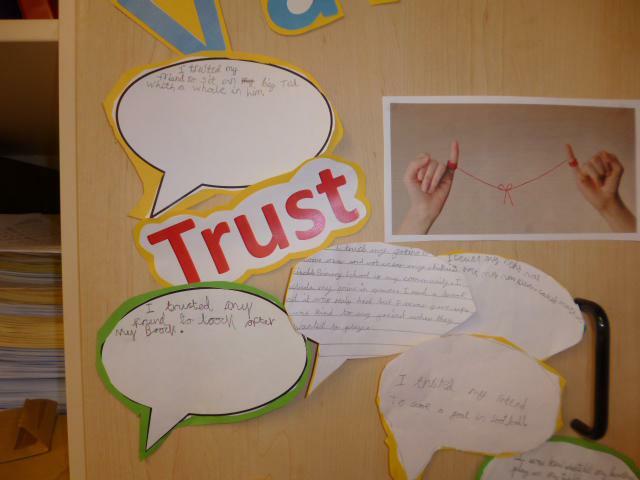 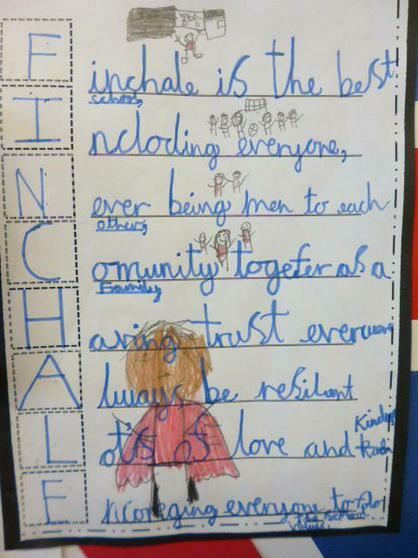 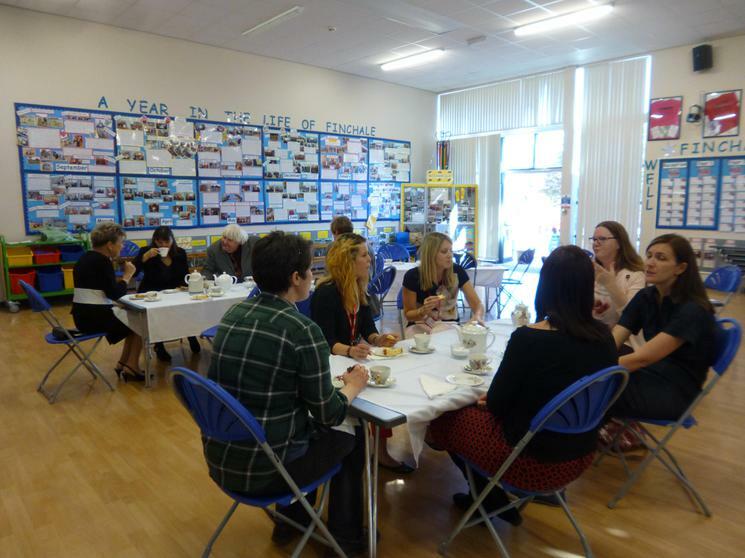 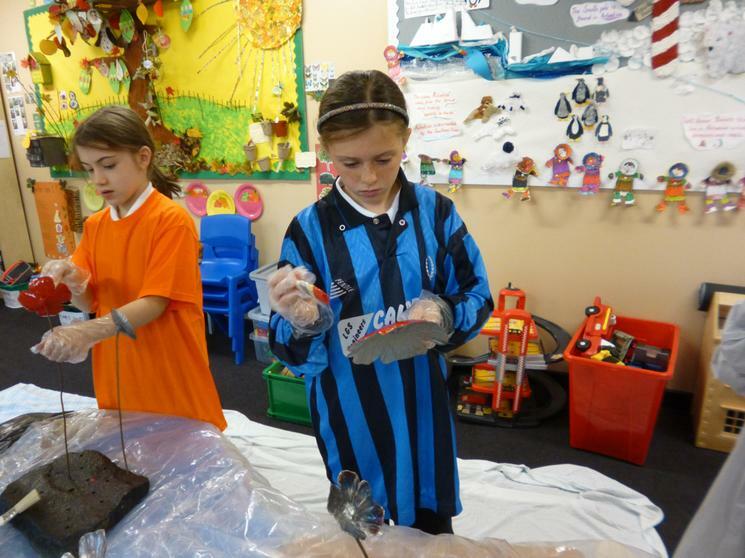 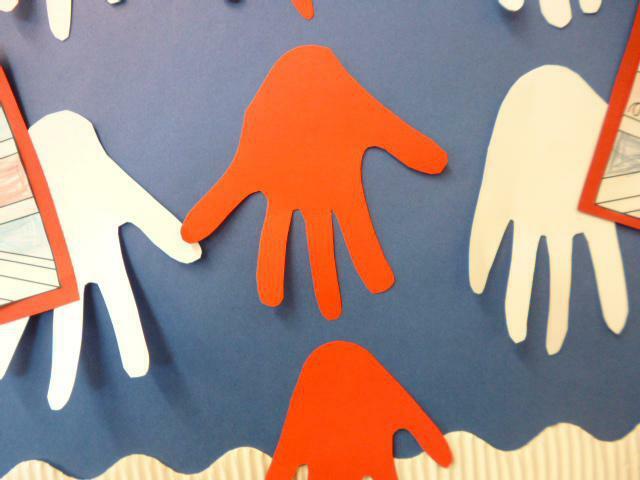 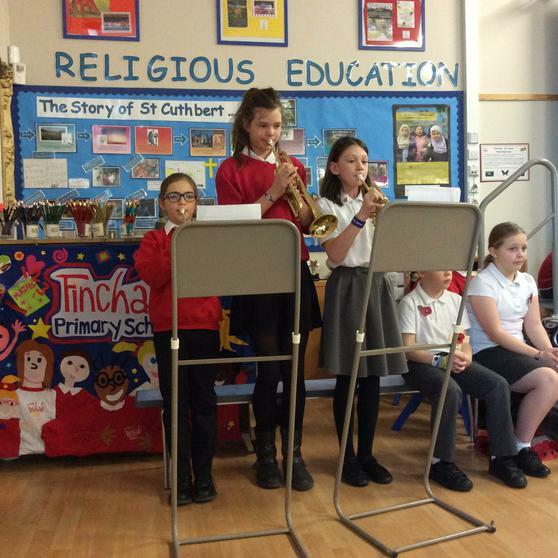 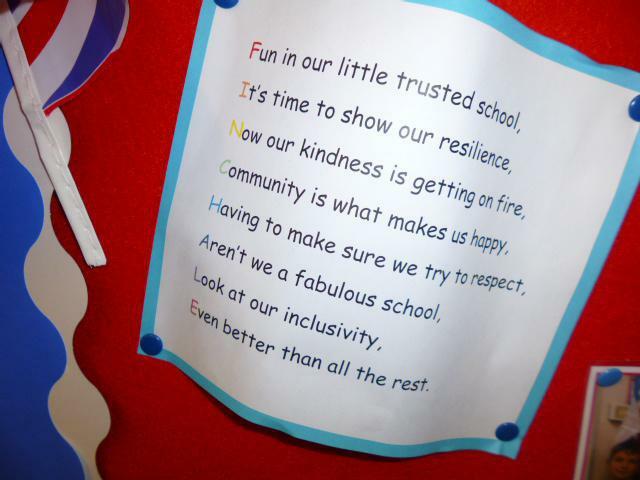 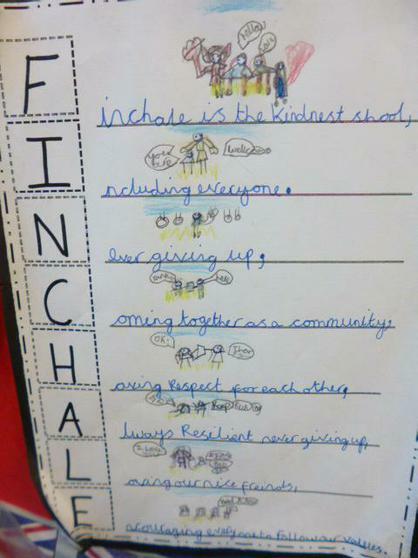 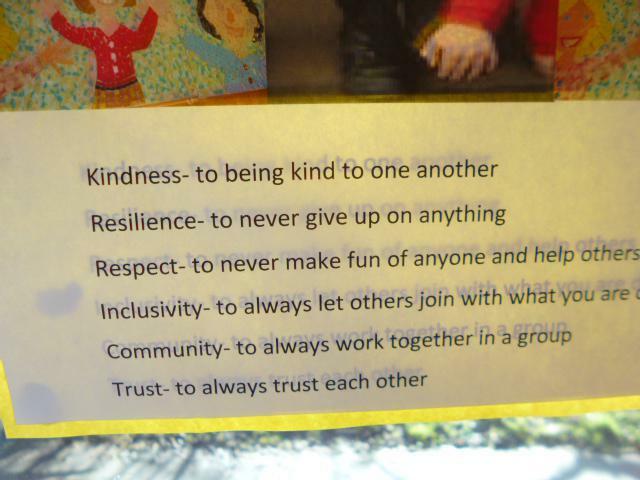 We are connected to five other schools in different areas of the country, and will share what we have been learning. 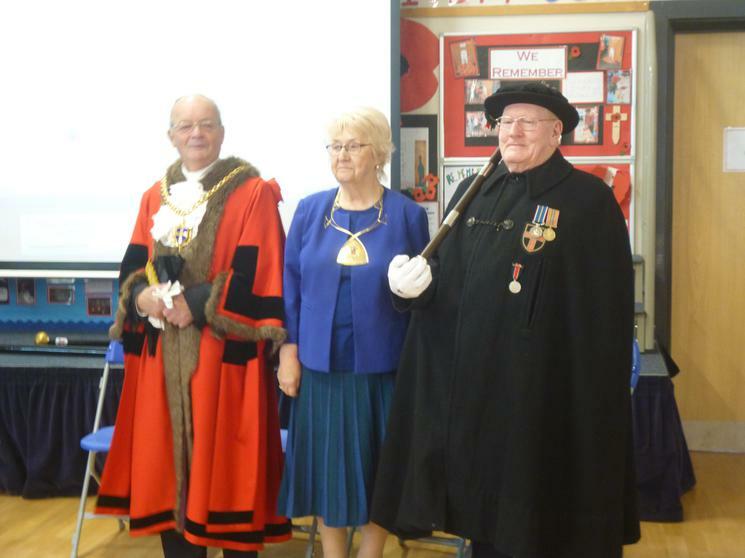 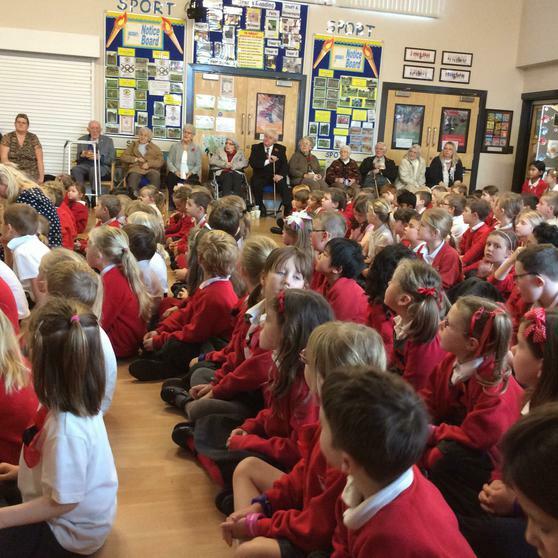 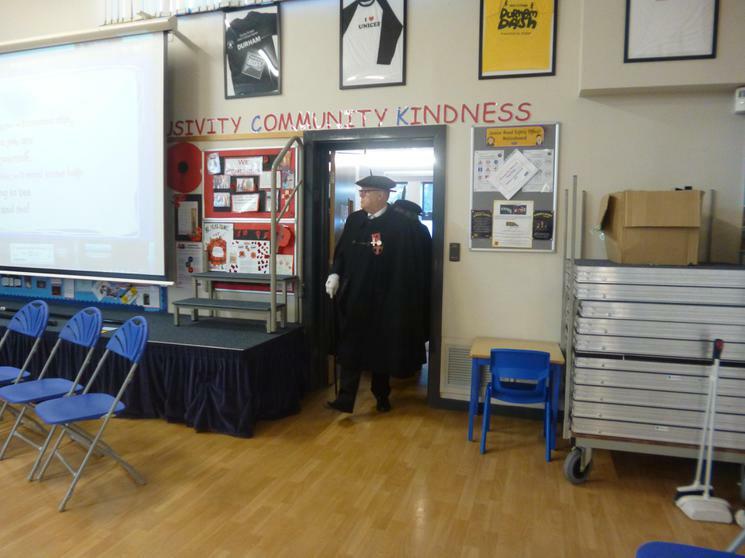 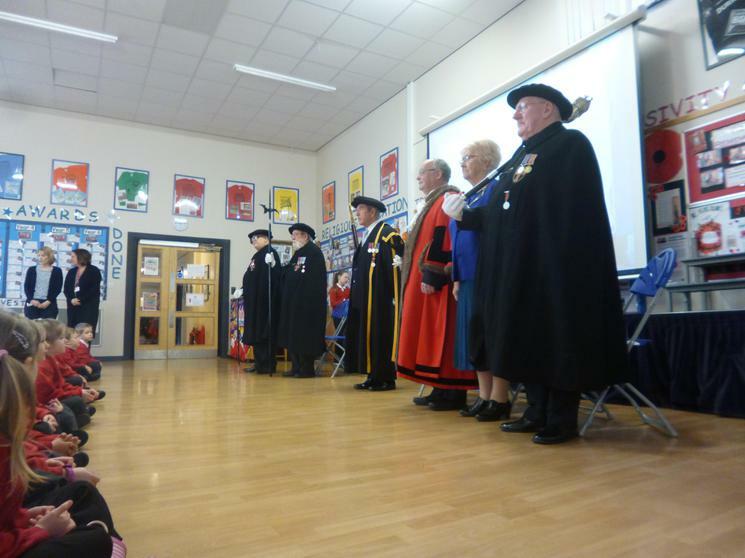 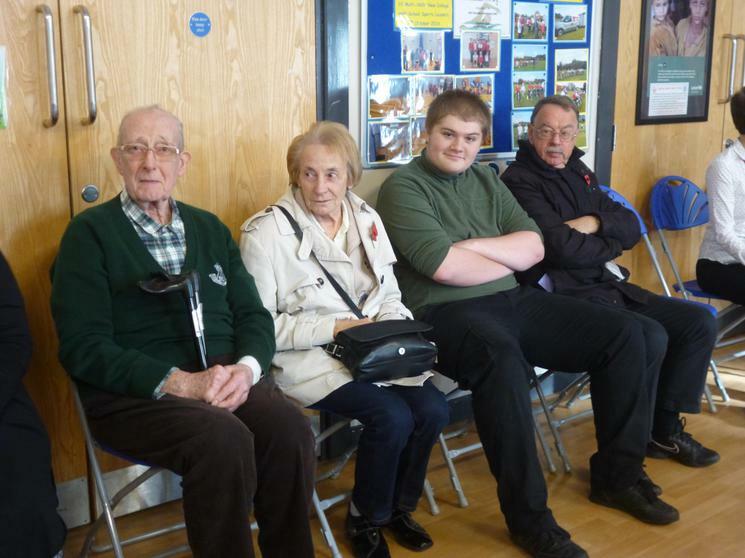 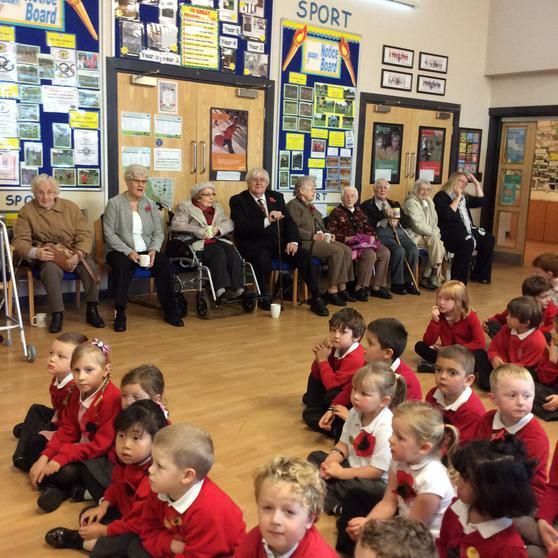 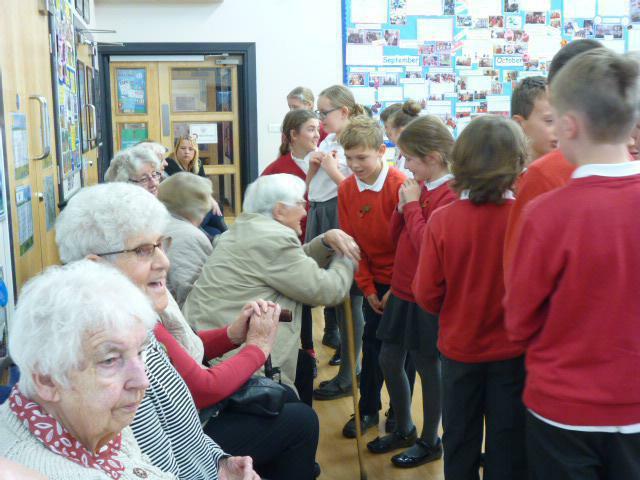 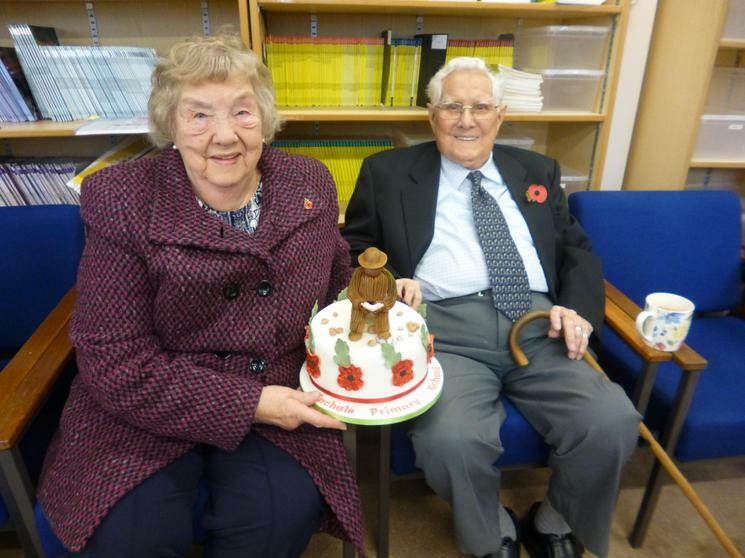 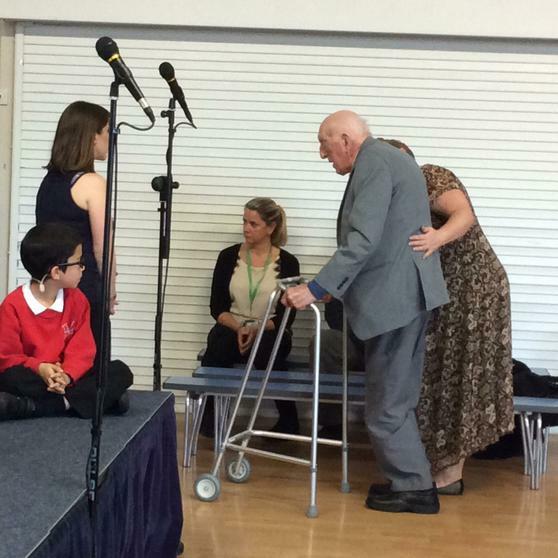 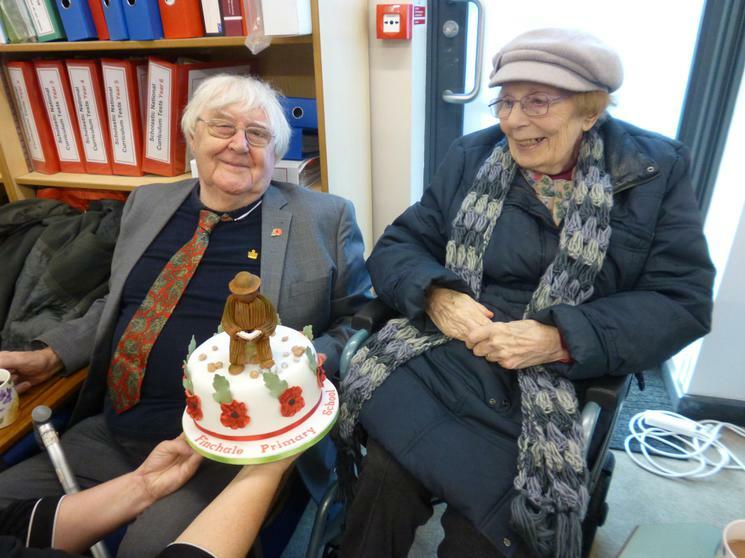 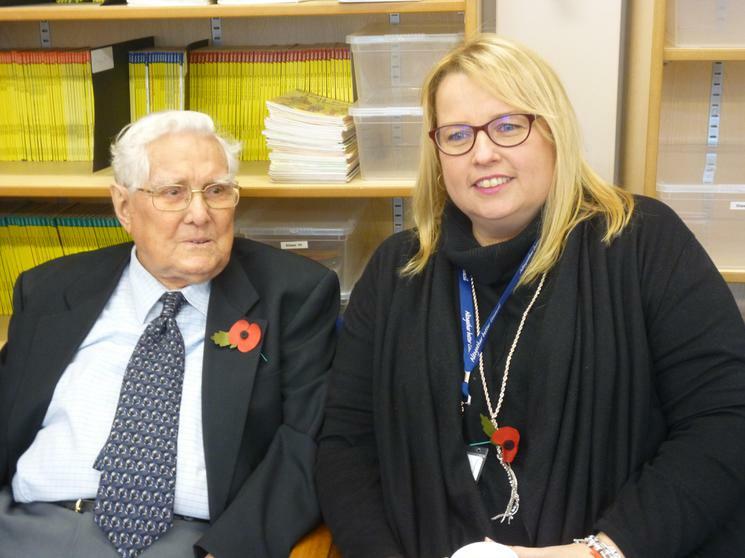 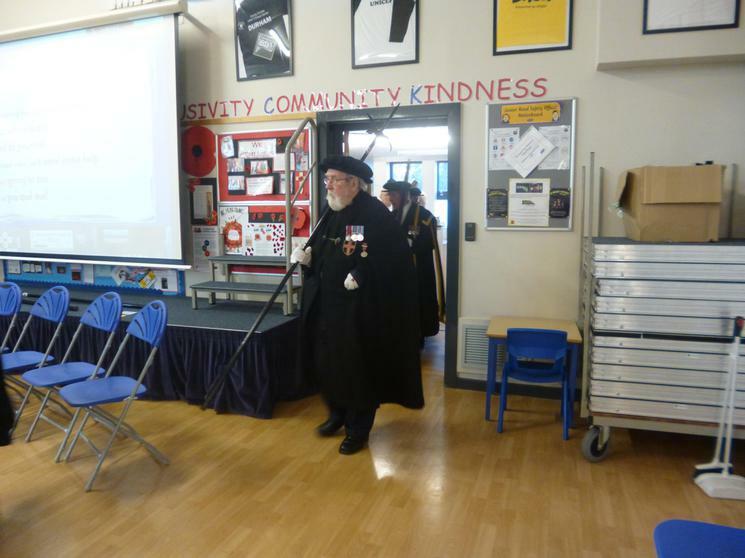 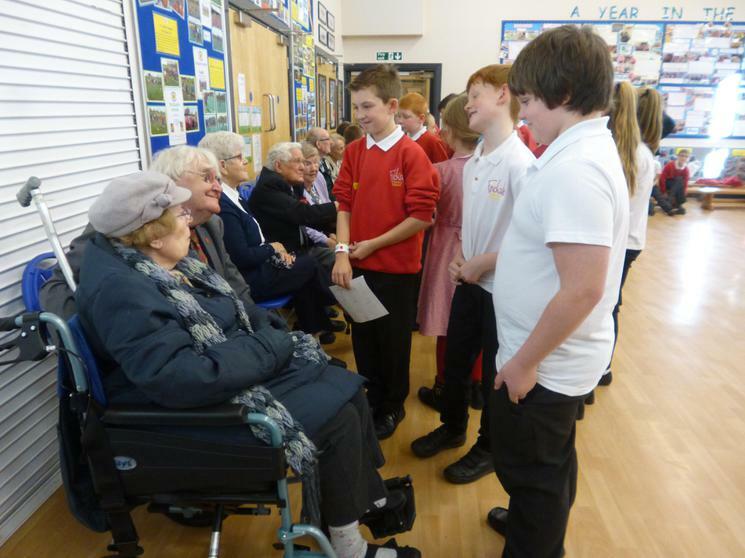 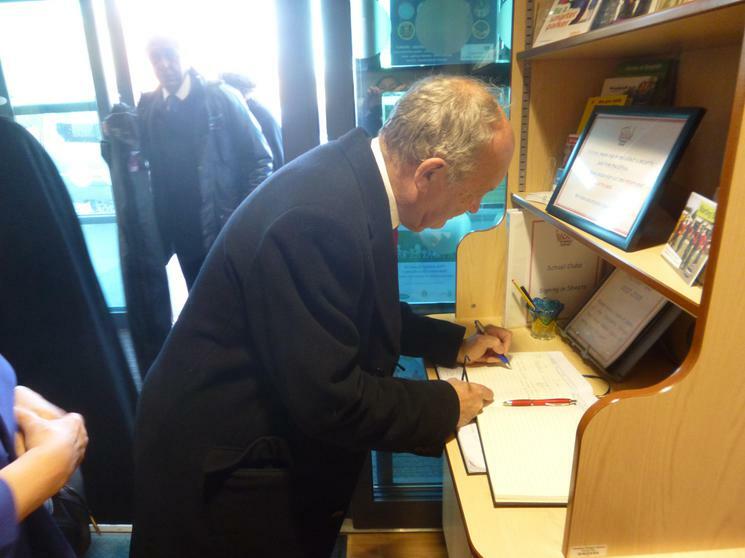 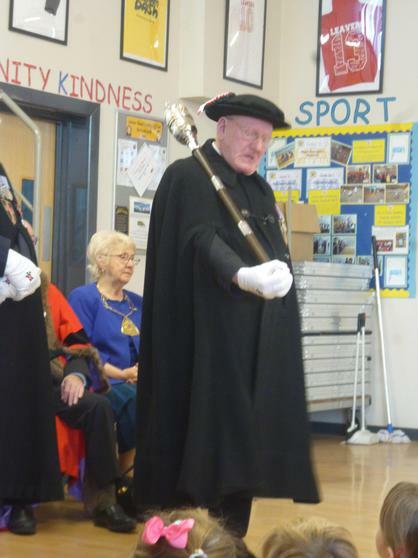 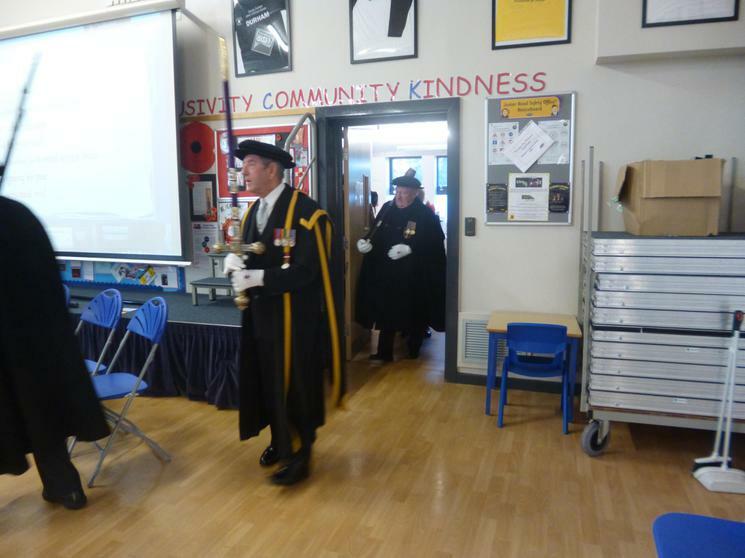 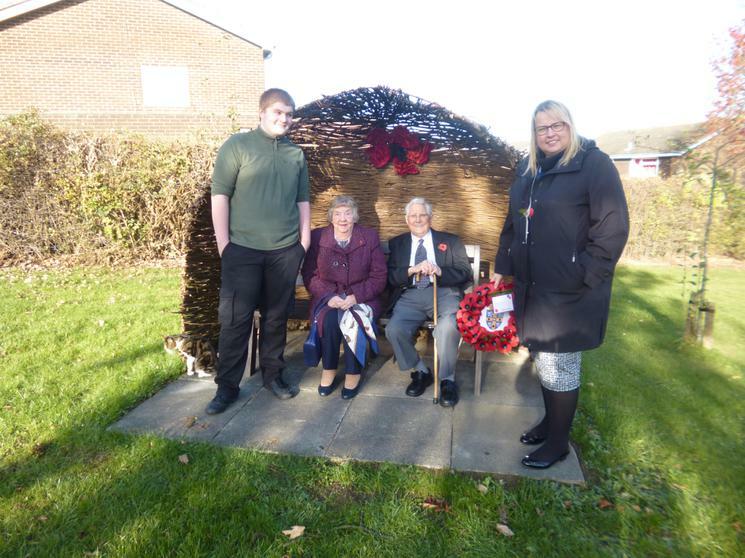 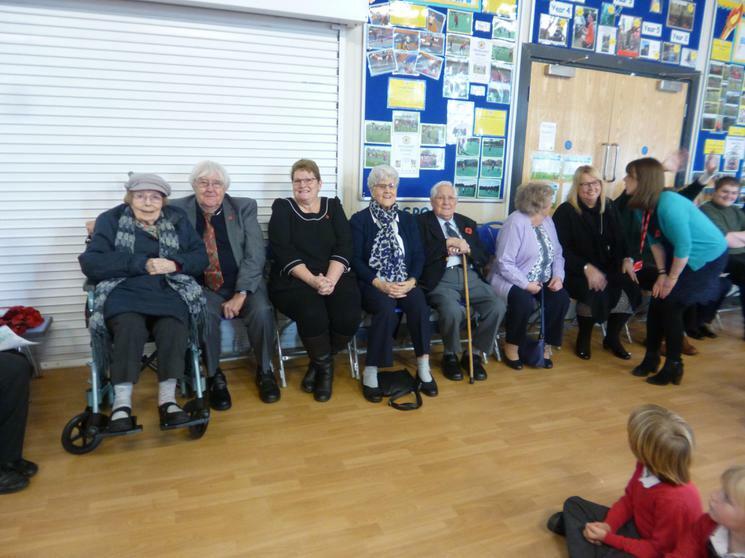 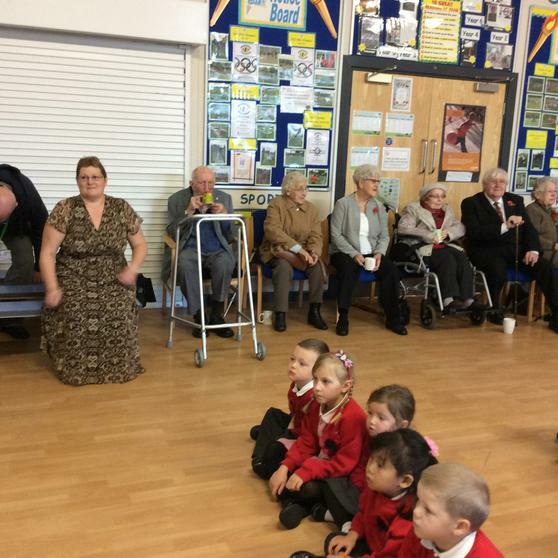 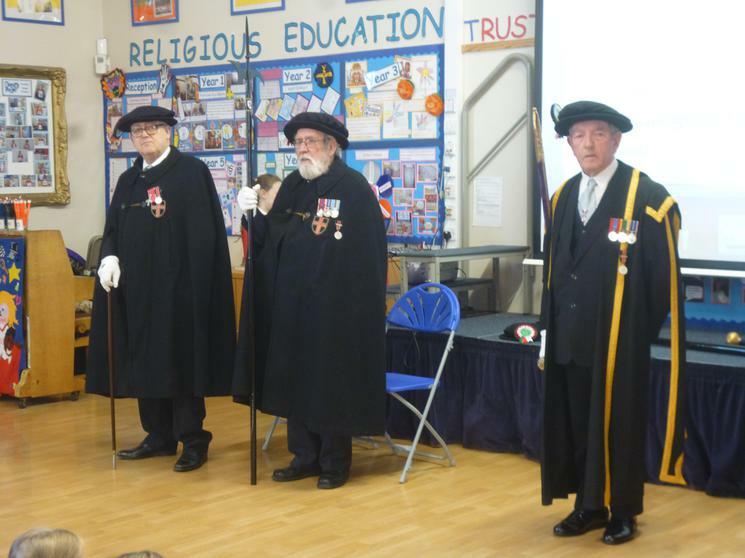 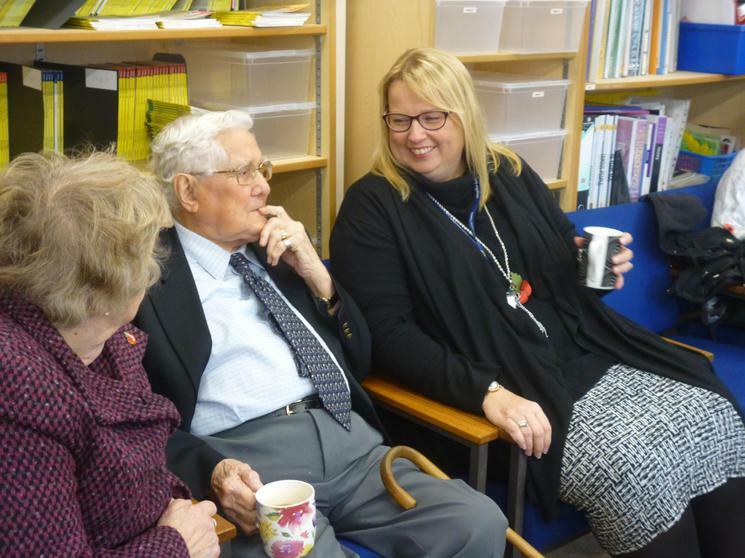 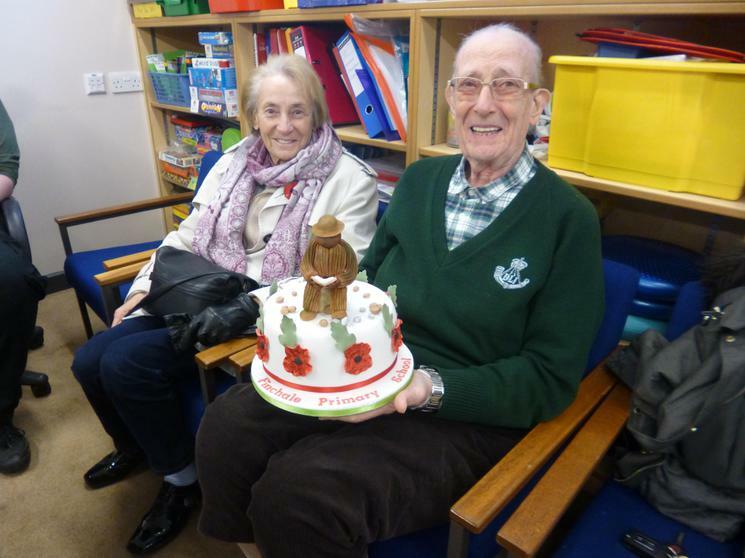 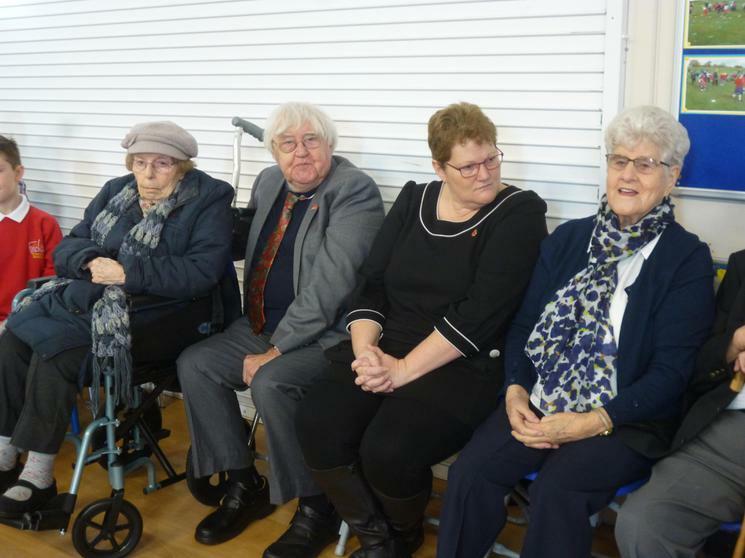 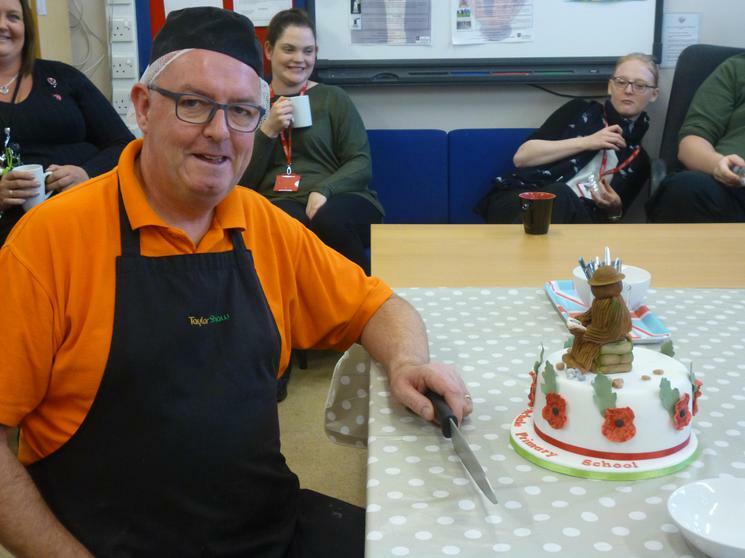 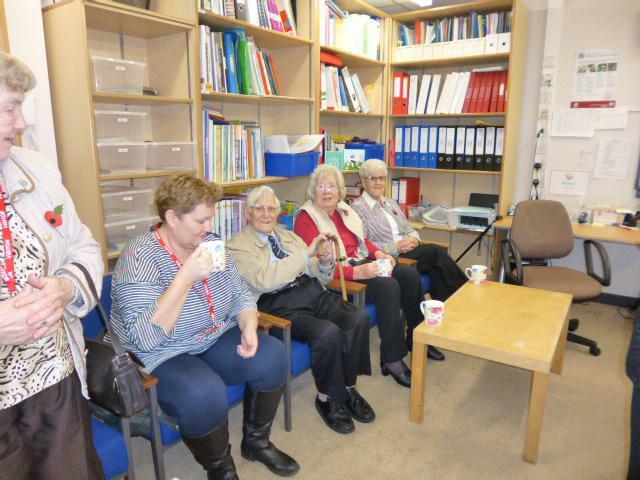 Veteran Mr Norman Watson and honoured guests attended our Remembrance Day Service 2015.